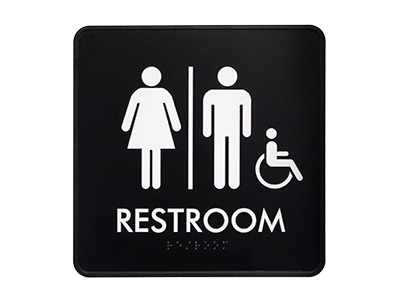 JRS carries a large assortment of custom manufactured sign frames to fit your customer's needs. 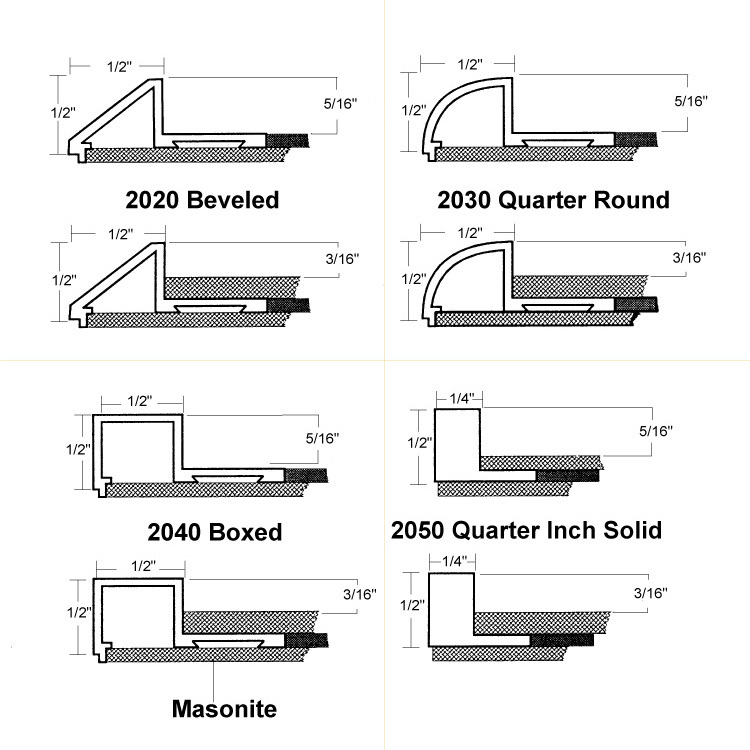 Architectural sign frames are custom fabricated from continuous aluminum extrusion from 1/16” or 1/8” wall thickness to your custom size requirements. 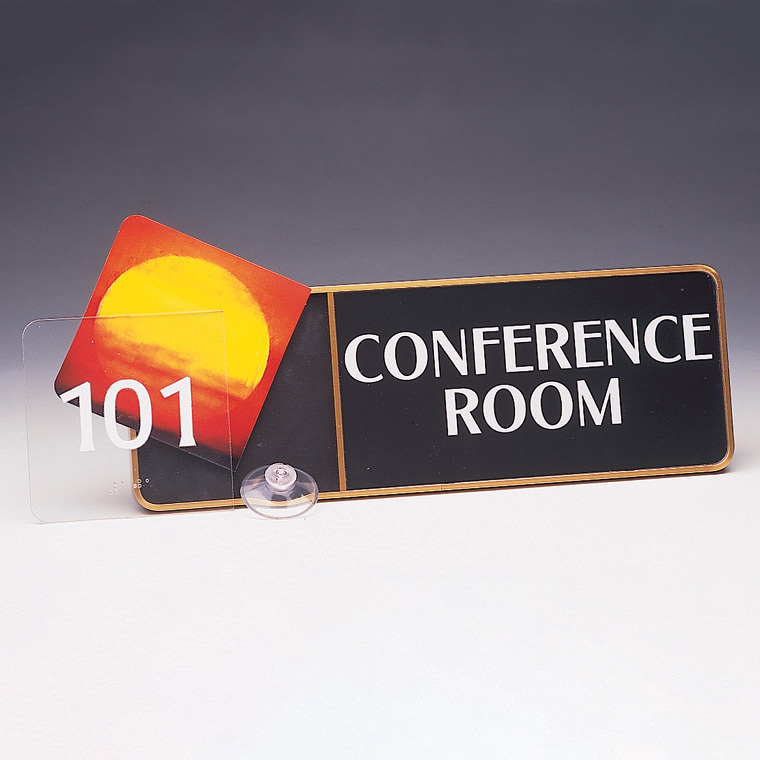 Matte clear acrylic based lenses are laser cut to snap in and out of anodized aluminum frames, round or square cornered. 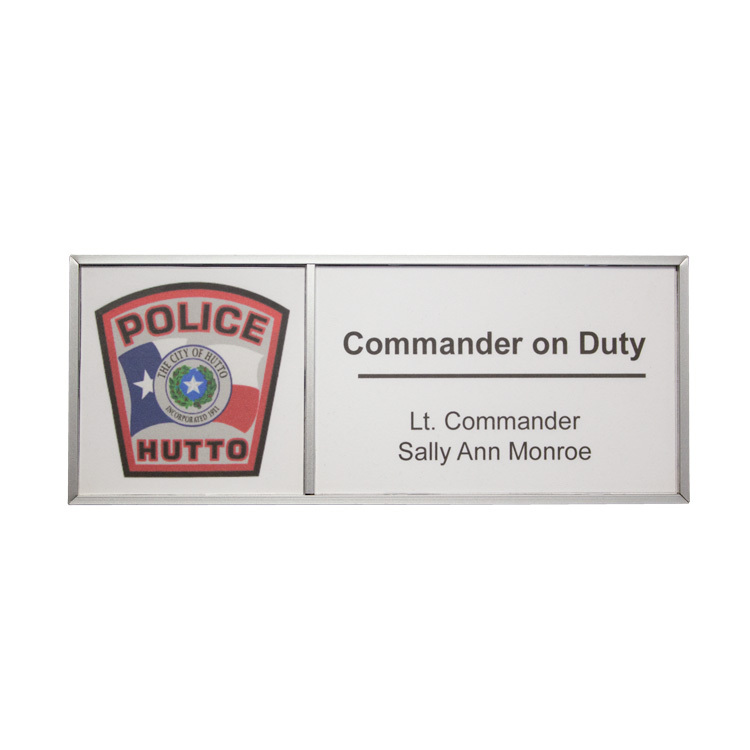 Provide quick status updates and identification with these unique aluminum changeable message frames. 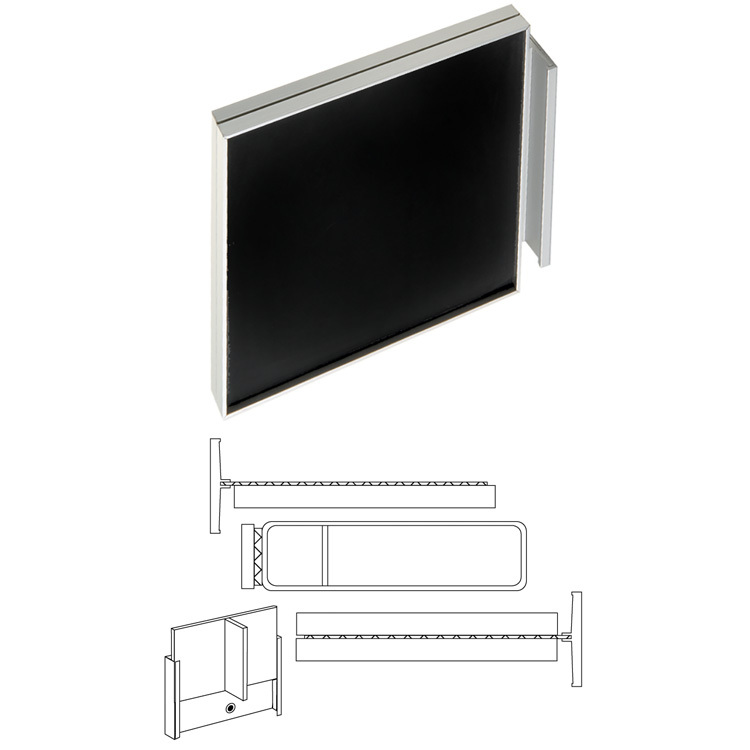 Fabricated from aluminum with a styrene backer, Coherent Window Series is a simple straight-forward and economical frame system that will accommodate a variety of inserts from paper to 1/16” material. 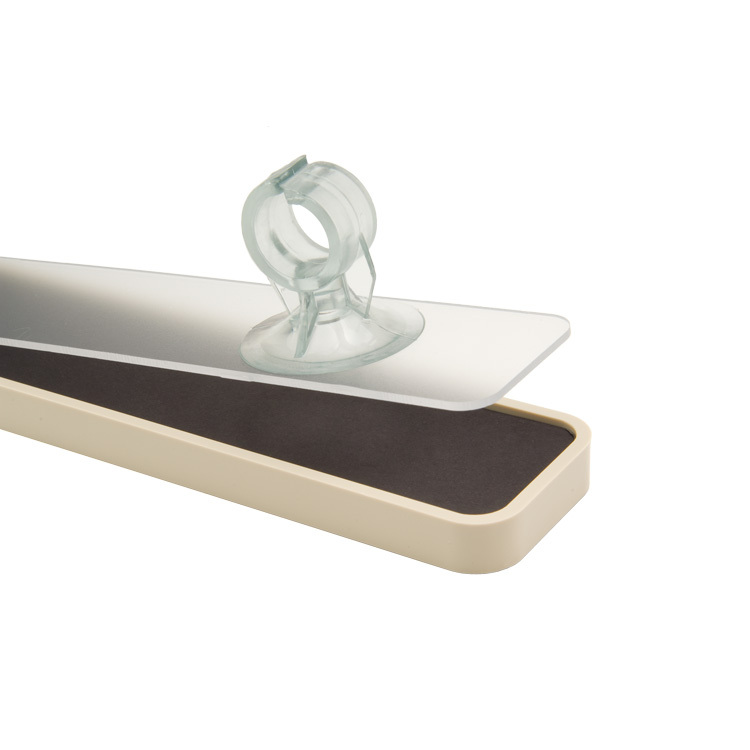 Inserts are protected by our matte-clear lens. 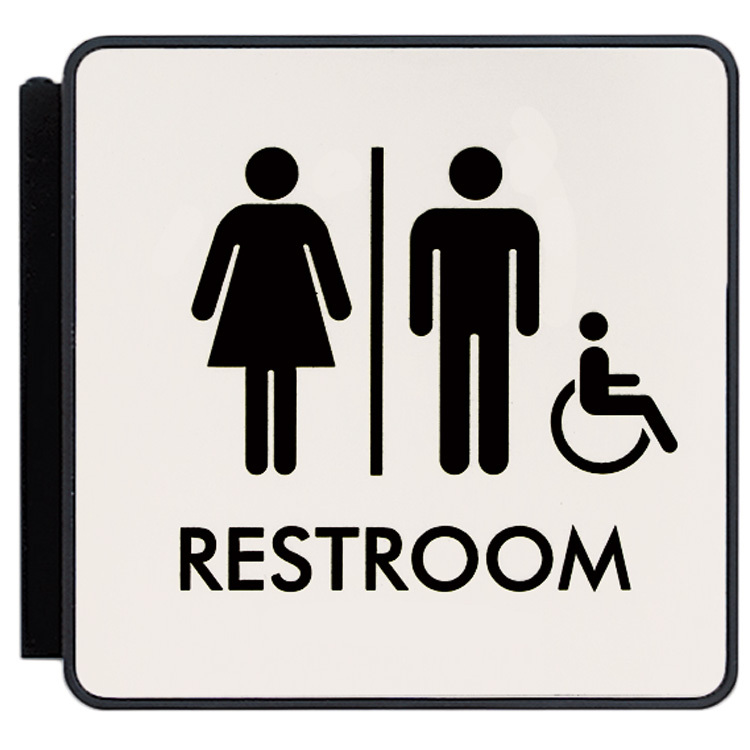 Innovative and cost effective. 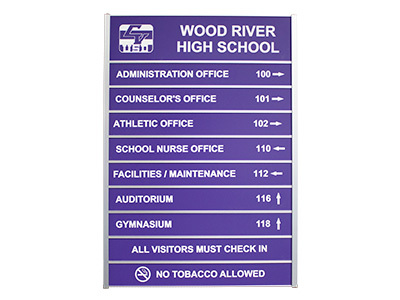 Curves adds a whole new dimension to sign frames. 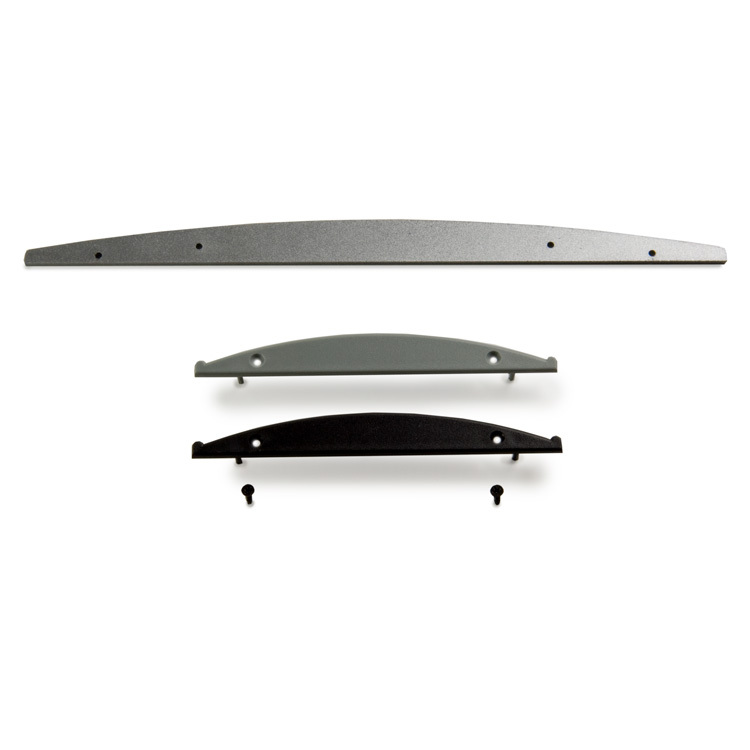 Curves can be mounted to a wall or partition, hung from the ceiling with fixed bracket or wire, flag mounted or used as a desk signholder ...CURVES... literally, the options end only with your imagination! 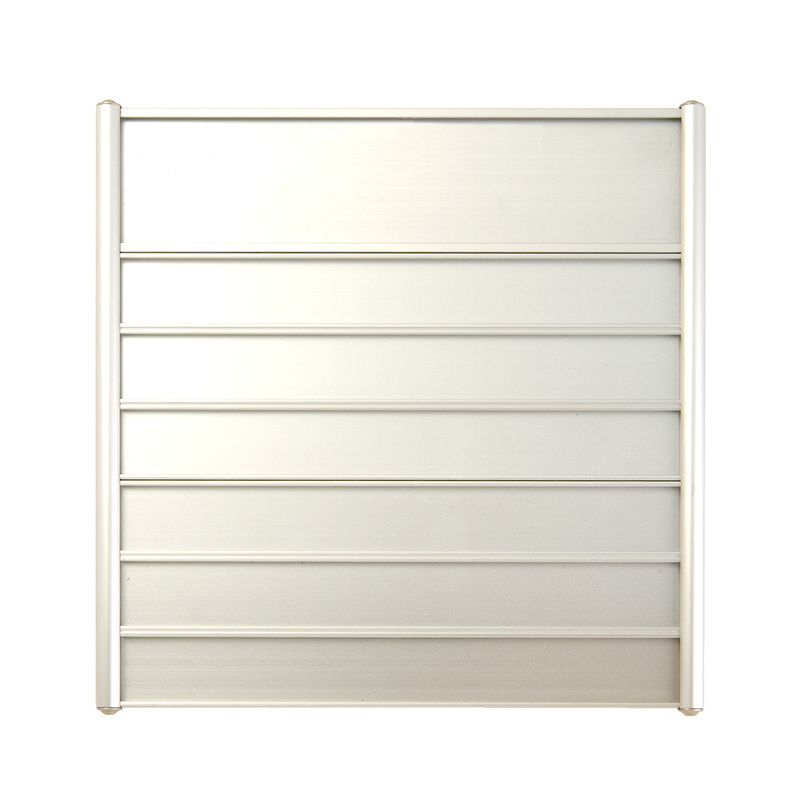 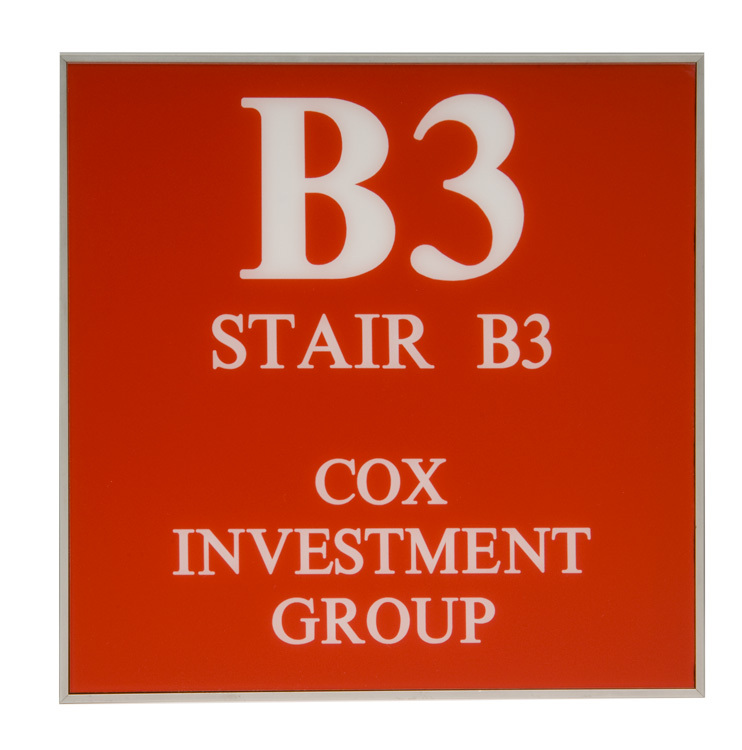 Four sizes of decorative bars create bold metallic borders for your signs. 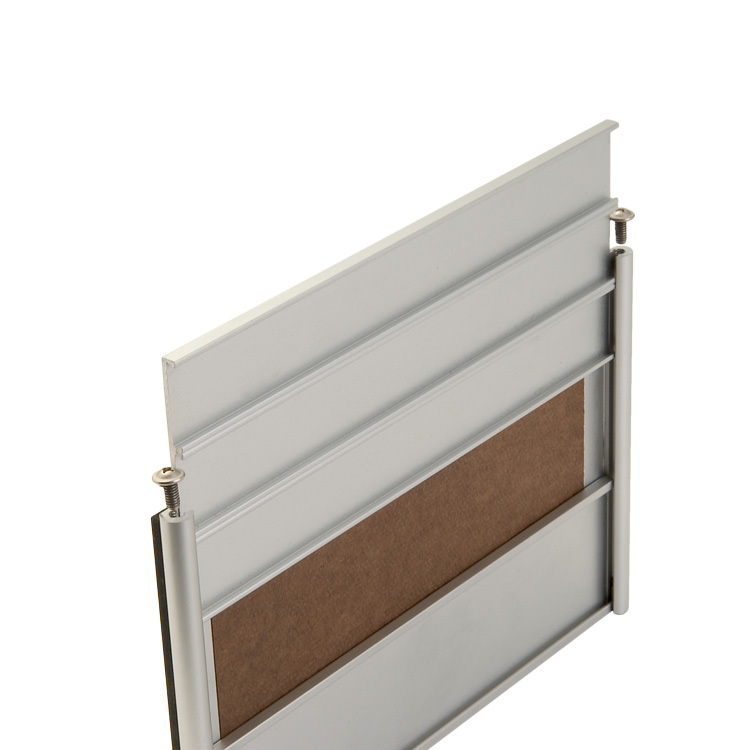 Options consist of bars only, 2-sided frame, and 4-sided frame. 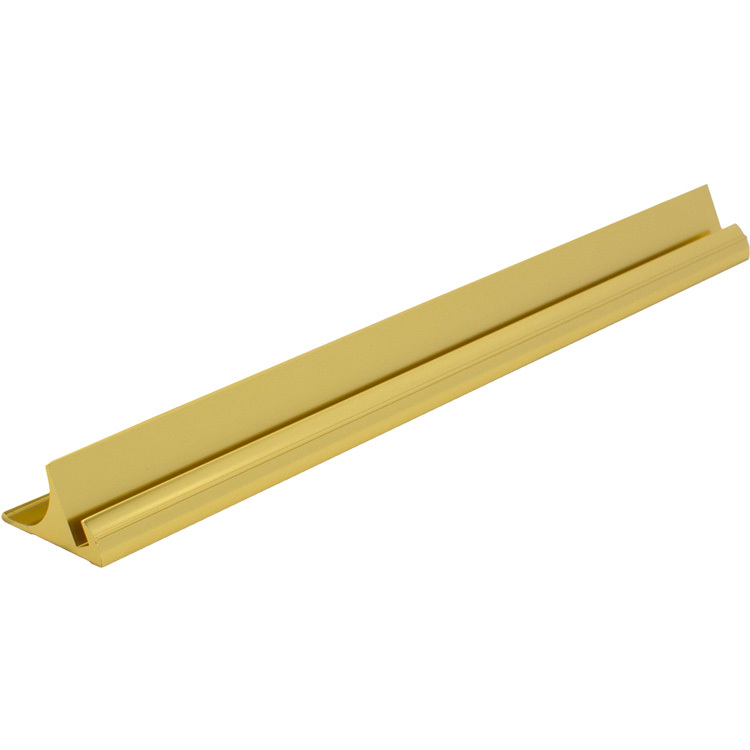 One can use equal size bars or mix two different sizes for 4-Sided frames. 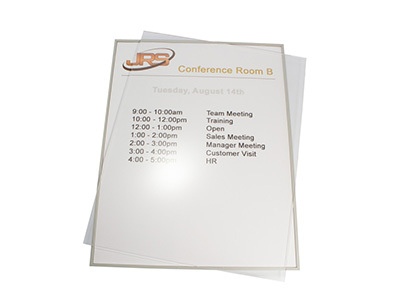 All four sizes can be made in to a complete four-sided frame, and all formats can snap in a matte clear lens. 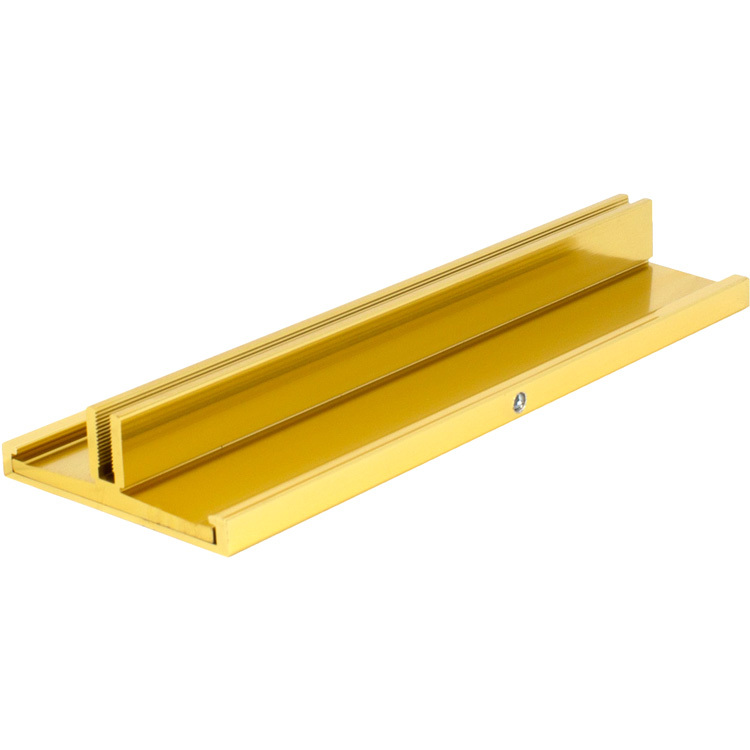 Use as a single frame or combine the Euro System with our Aluminum Holders to create tamper resistant directories, large and small. 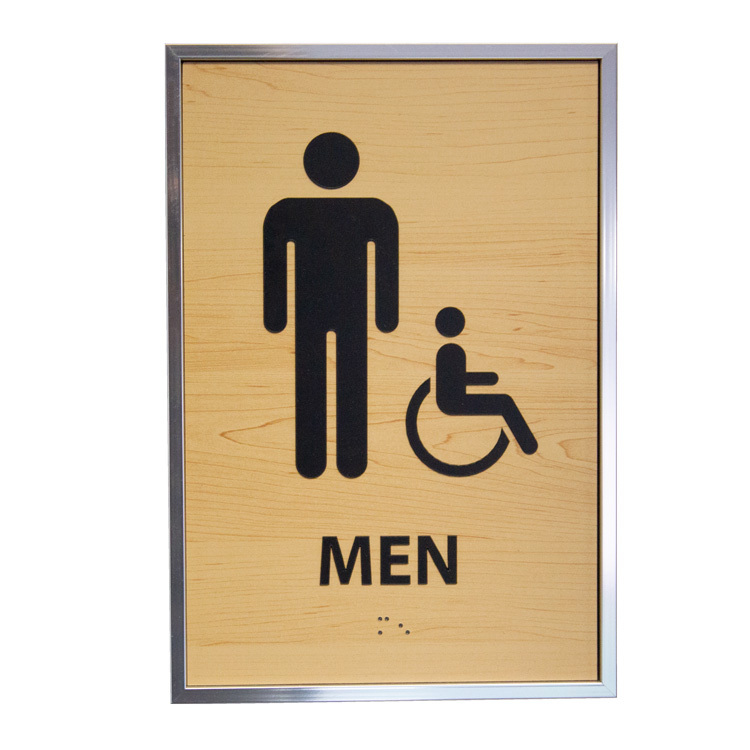 Specifically designed machined screws in round or square head lock the sign assemblies in place and provide	security for your signage. 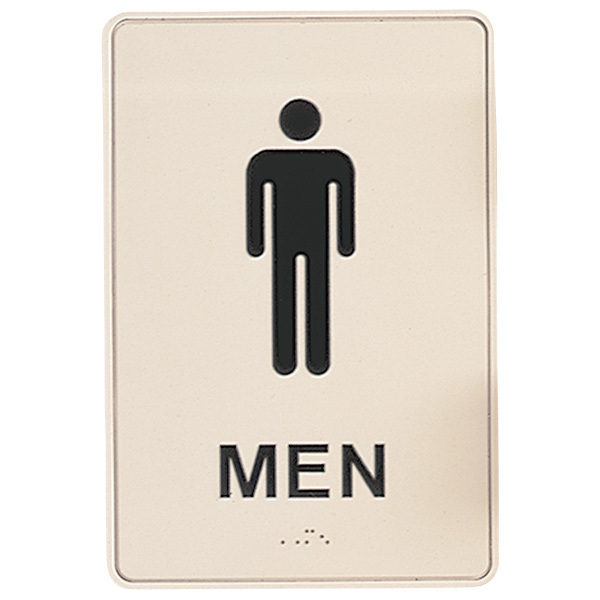 Top screws are simply removed to	make signage updates. 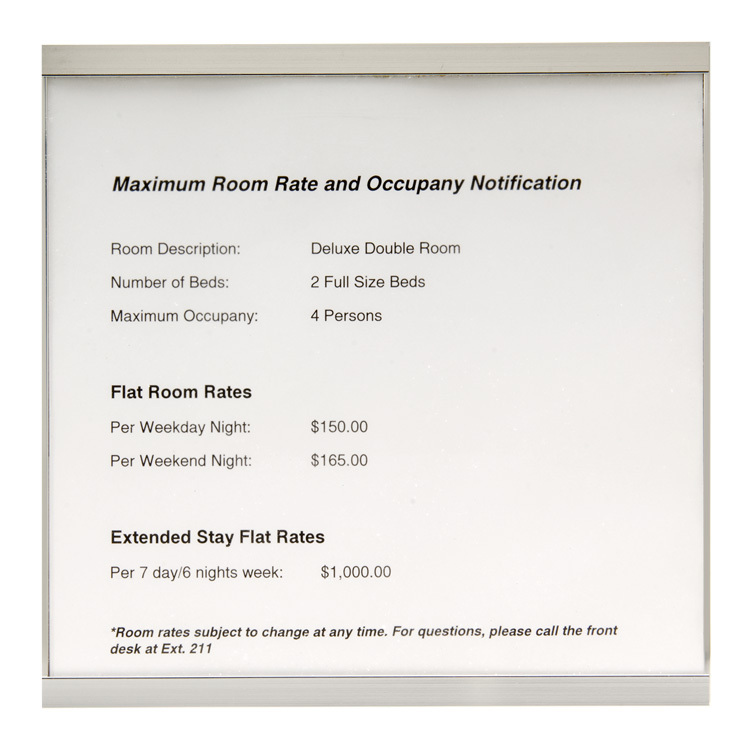 Attractive, functional and flexible, FLEX is a tamper resistant sign frame option that can be utilized for virtually any interior signage application. 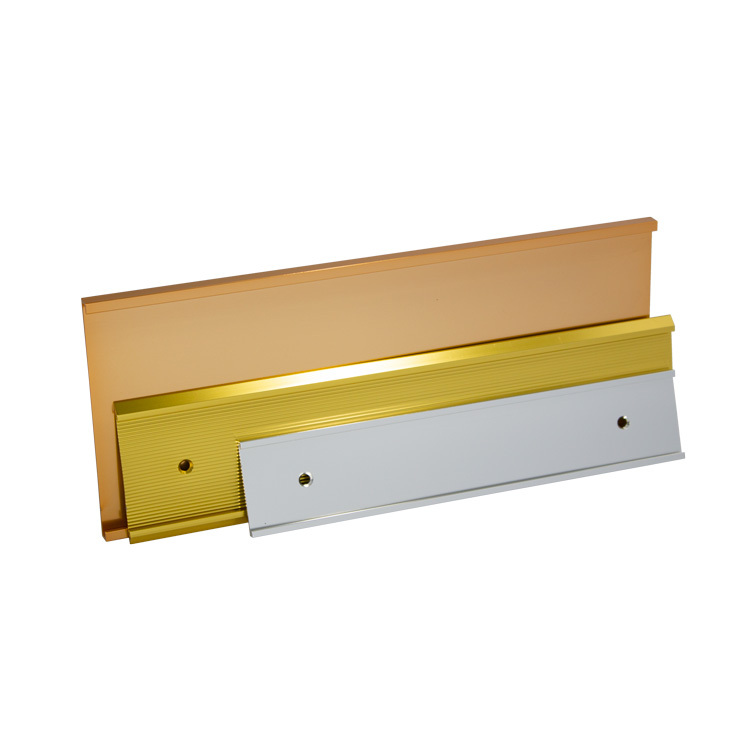 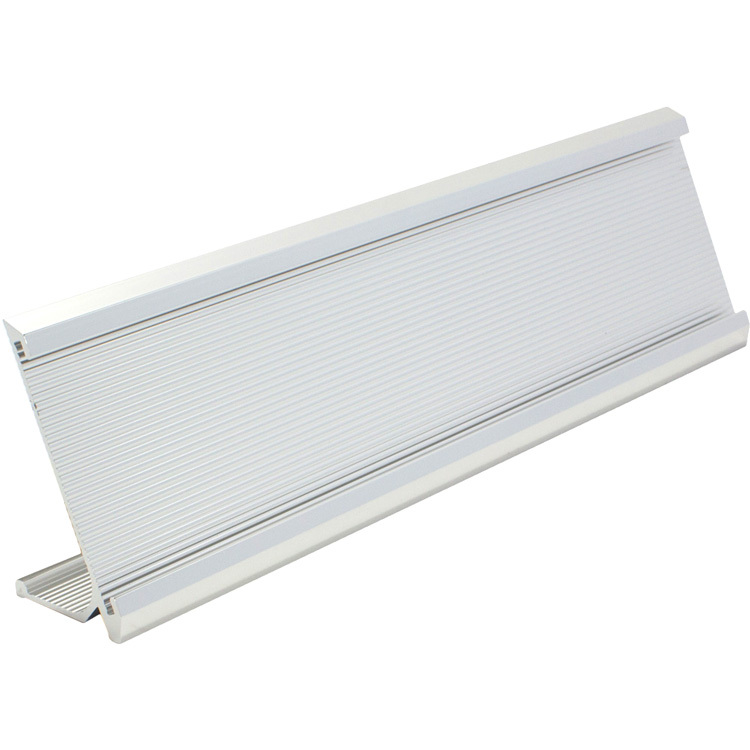 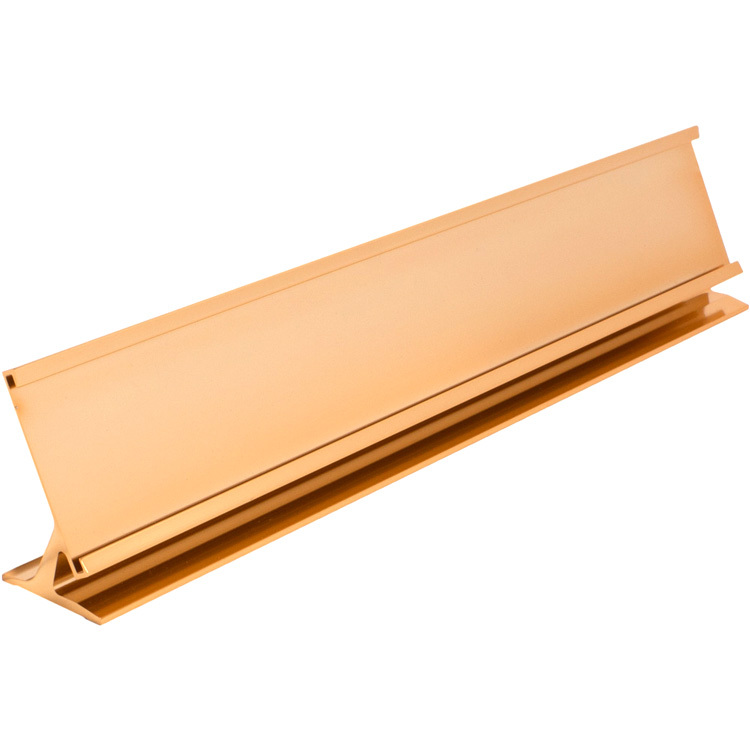 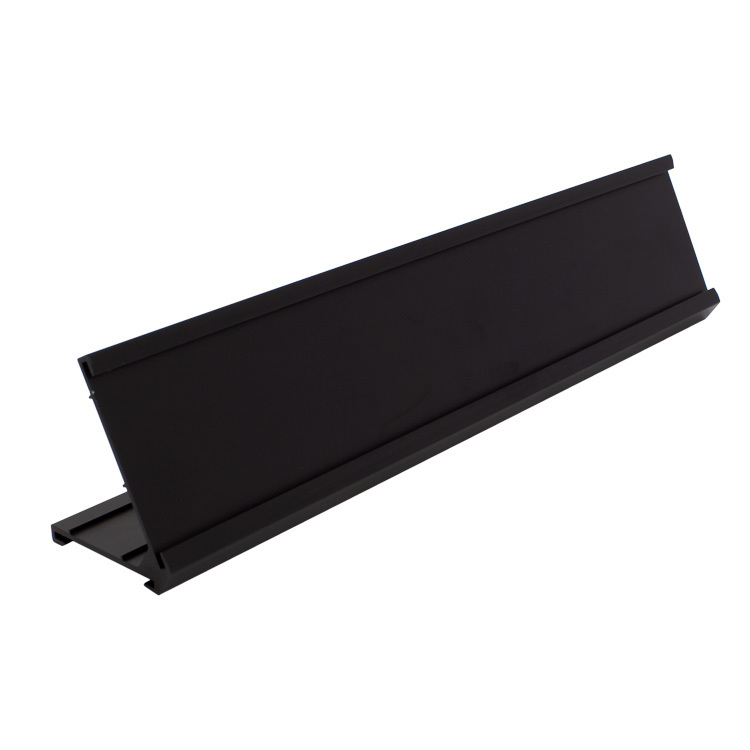 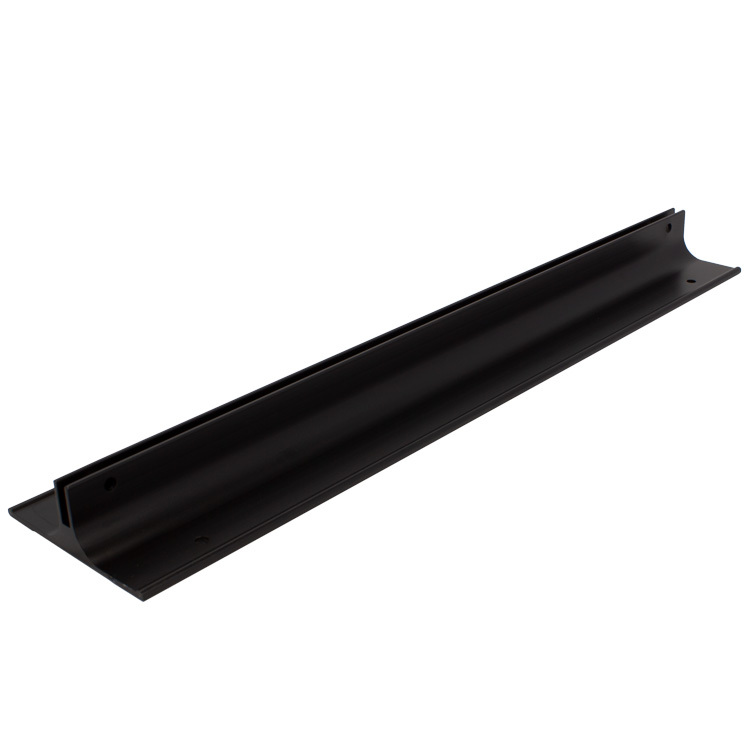 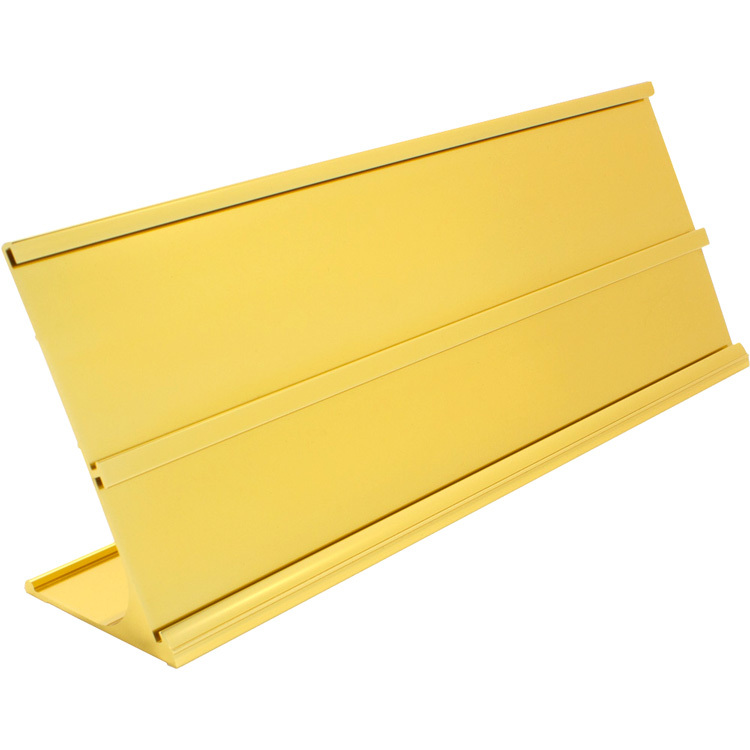 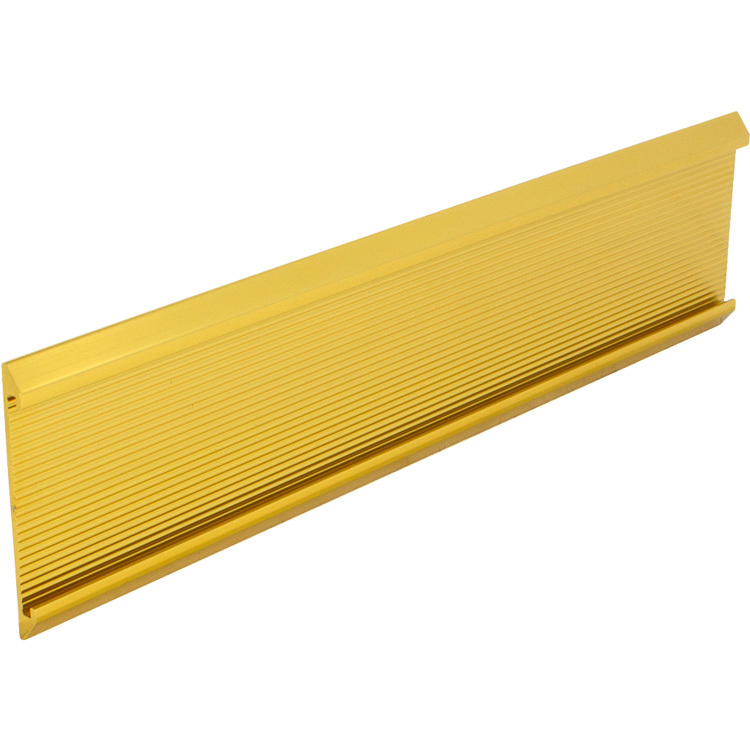 Square side rails with finished ends use a mix of our wall brackets that slide into the rails and are secured with a setscrew combination offering a wide range of signage options while maintaining ease of maintenance and changeability. 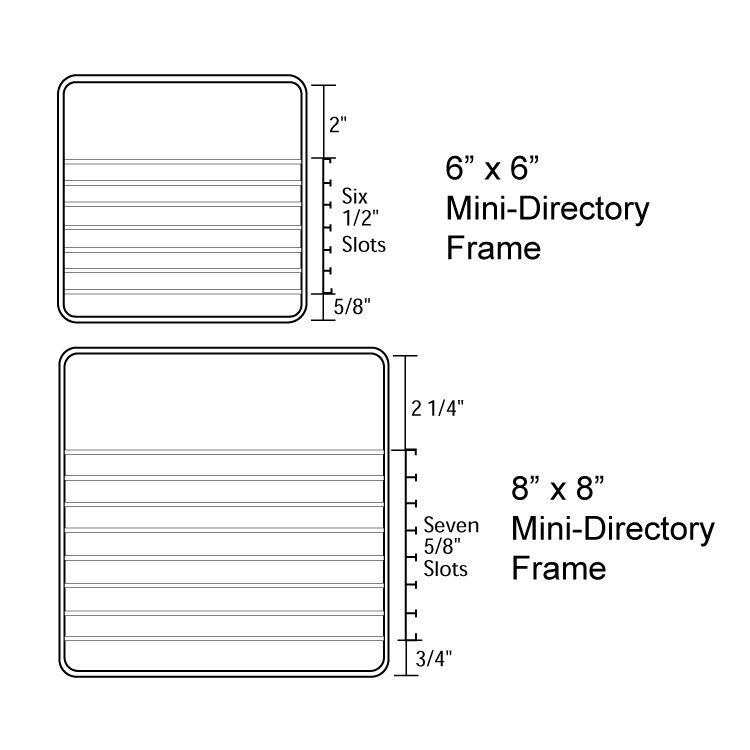 Provide simple to read directories with these pre-formatted Mini-Directory frames. 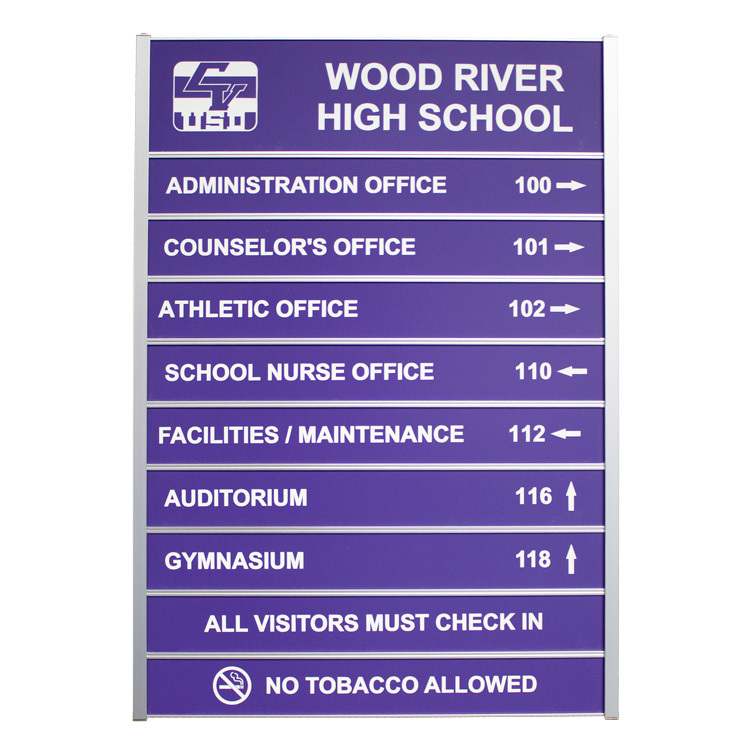 Precision mitered from an extrusion of premium alloy in three professional styles - Beveled, Radiused, and Boxed - makes this sign system a top of the line favorite. 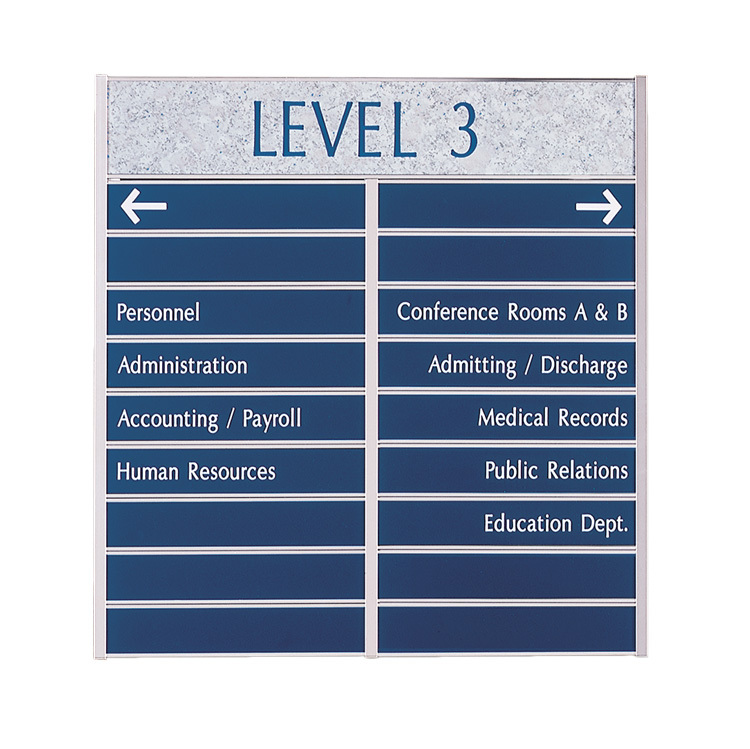 Each style has several features that make professional signs simple. 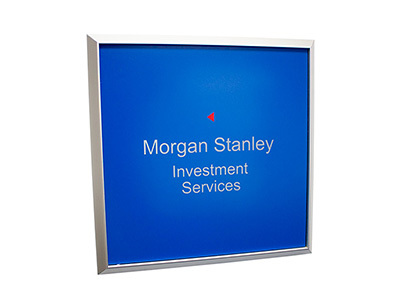 Precision mitered from an extrusion of premium alloy in four professional styles: Beveled, Quarter Round, Boxed, and Quarter Inch Solid, makes this sign system a top of the line favorite. 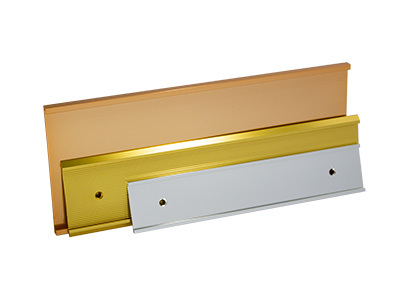 Sleek and contemporary with a traditional appeal. 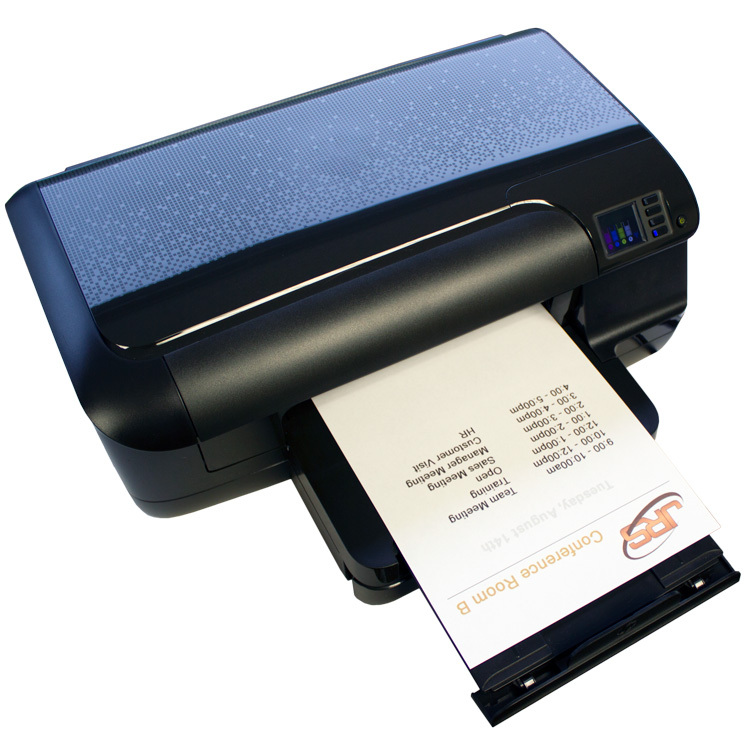 Vista Clara offers a simple, yet effective solution for your identification and point of sale requirements. 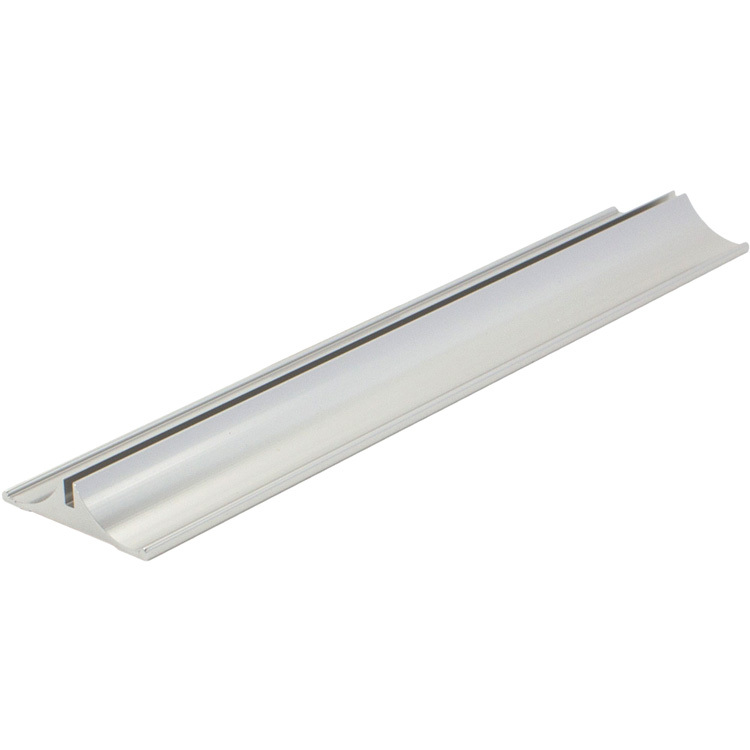 Each unit consists of an aluminum profile of high quality material along with a custom fit 3/16” thick acrylic lens bevel cut to sit flush with surface of holder. 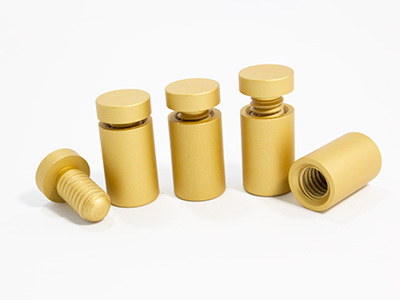 Precision mitered from a premium aluminum alloy, XTERIOR is suitable for outdoor applications. 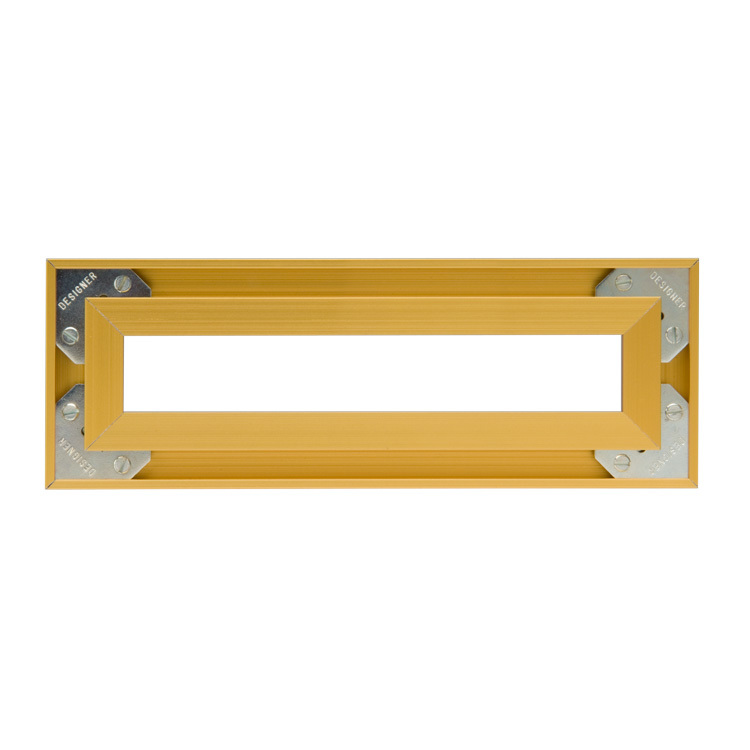 Available in two ‘Hard-coat’ anodized colors, Satin Yellow Gold and Satin Silver, each frame is hand assembled utilizing stamped stainless steel corner angles. 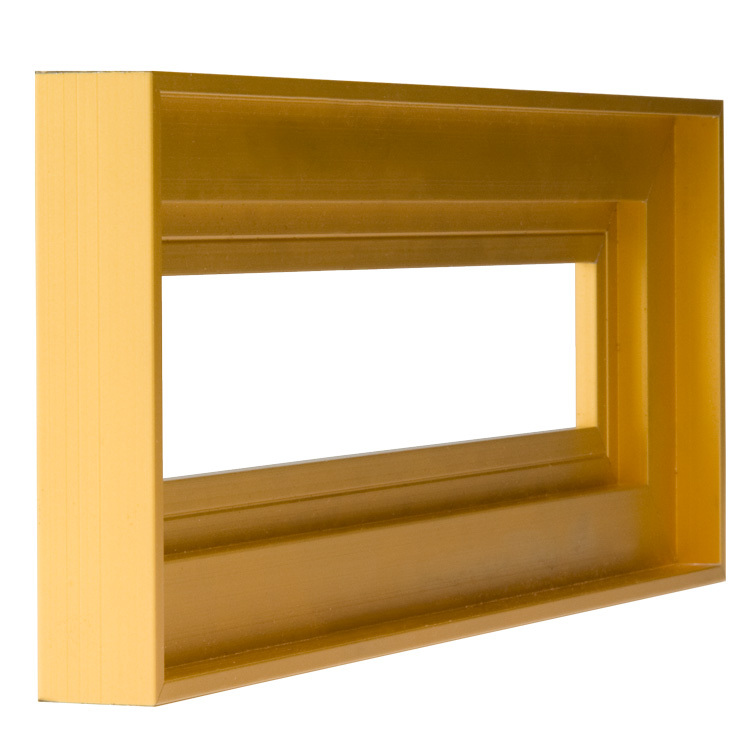 Architectural Frames in Molded Plastic is a round and square corner system designed for quality interior signage. 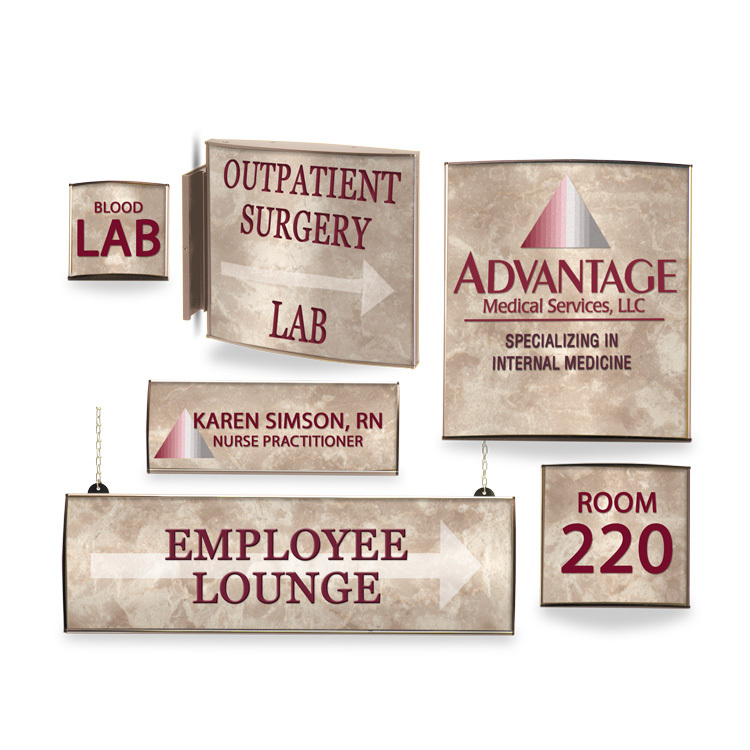 Our Designer Frame System and Designer2 Frame System are designed for quality interior signage. 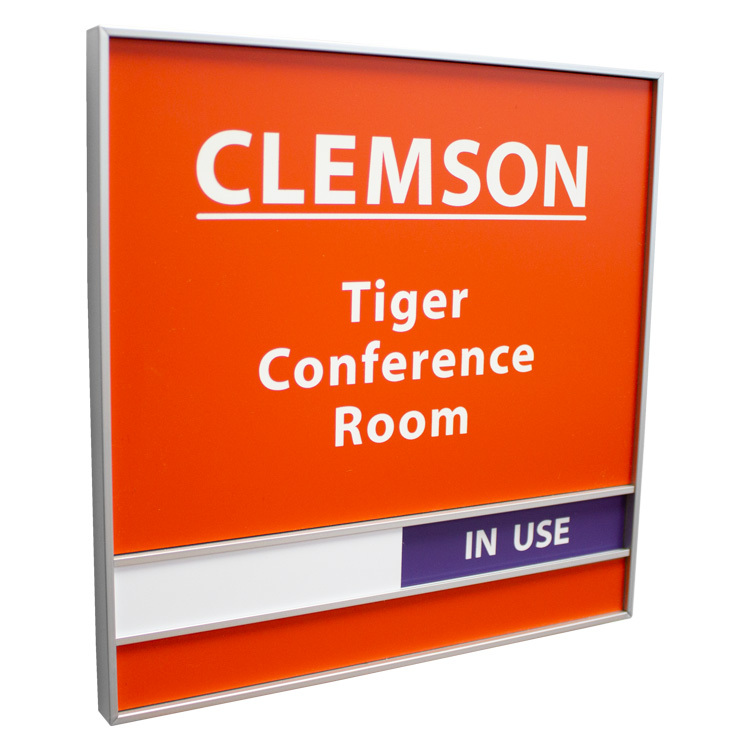 Several unique features offered by this system will make designing and mounting interior signage simple! 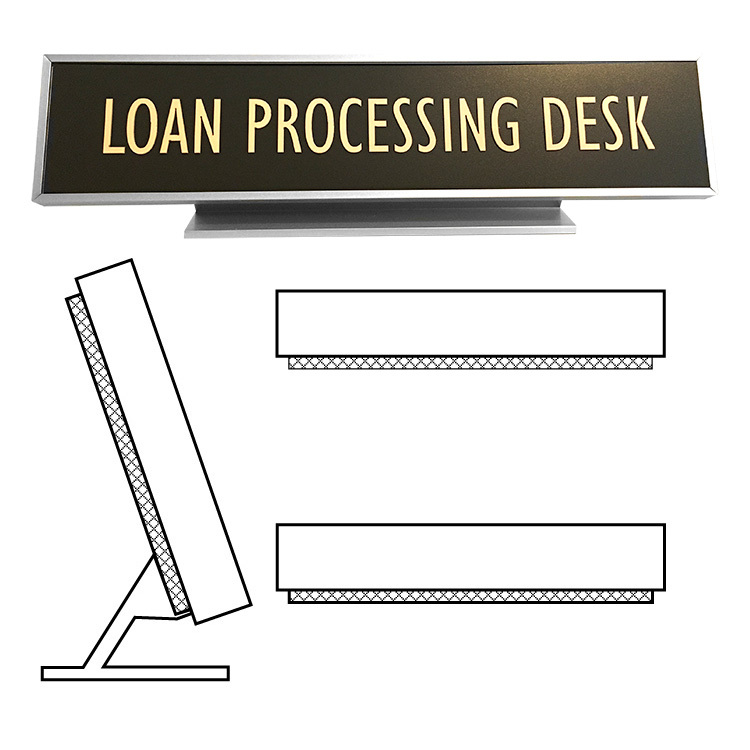 Create signs from any desktop computer using our E-Z Sign system. 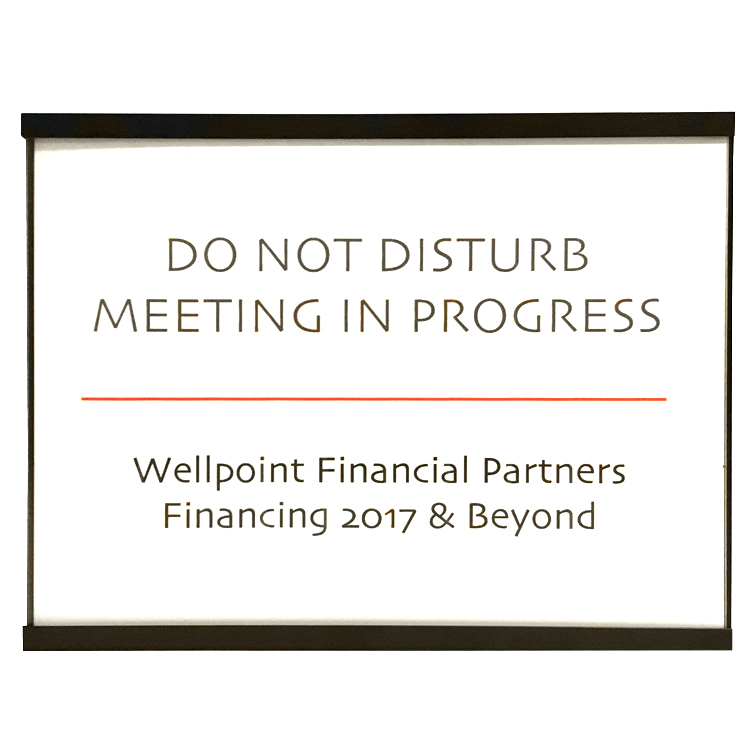 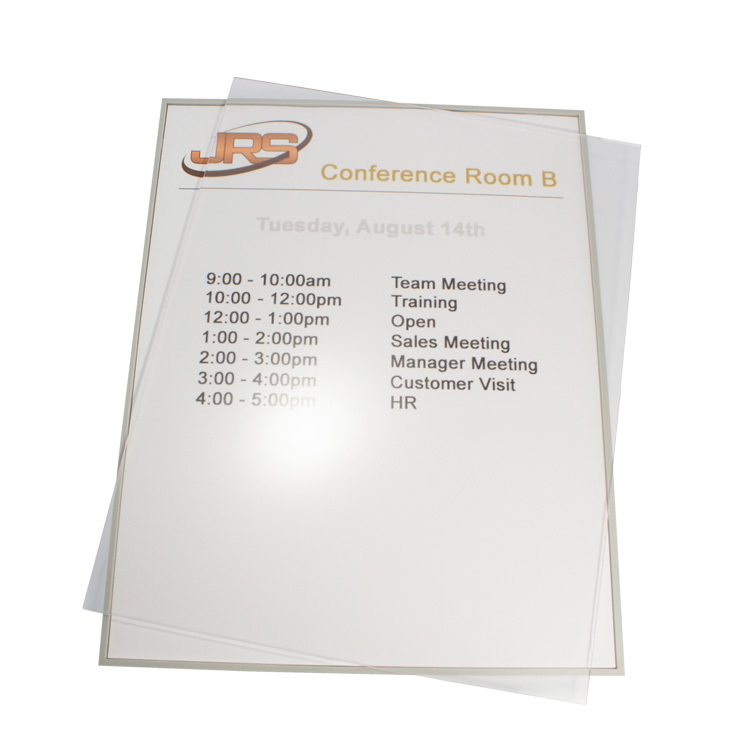 Simple user-friendly templates and within minutes you can be printing your own signs on our custom perforated sheets using your own word processing program. 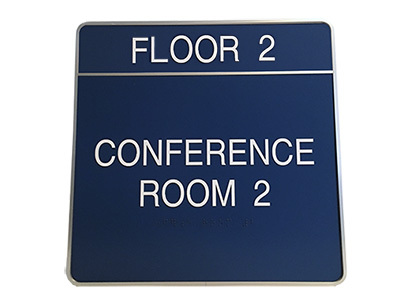 Perfectly suited for temporary signs, often-changed signs, informational signs or conference rooms. 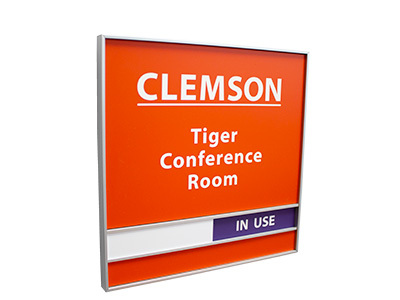 With the E-Z Sign system, your options only end with your imagination. 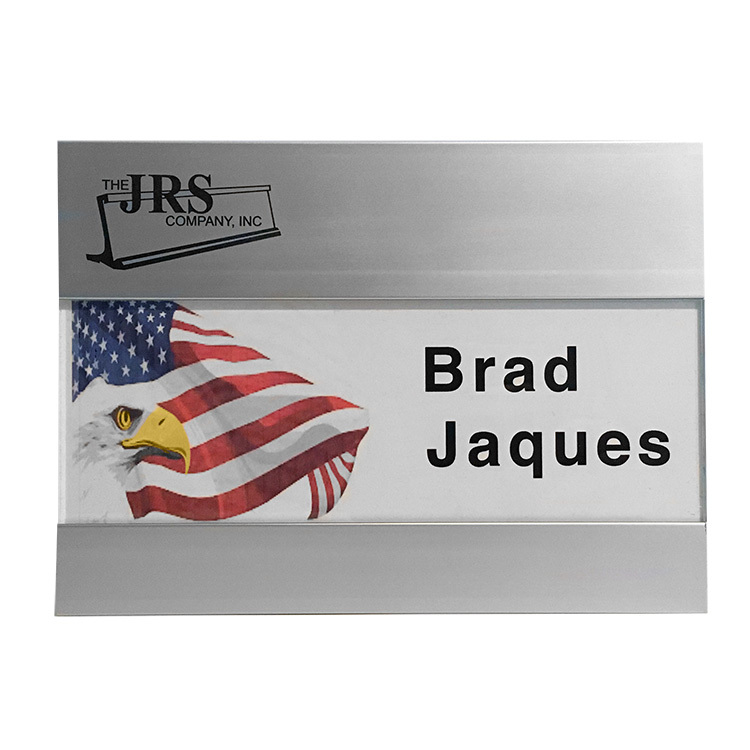 JRS has become the industry leader in the manufacturing of nameplate wall holders, desk holders, desk bases, and corridor brackets in the U.S.A.
JRS wall holders are made from a premium aluminum billet and are available in multiple styles and sizes. 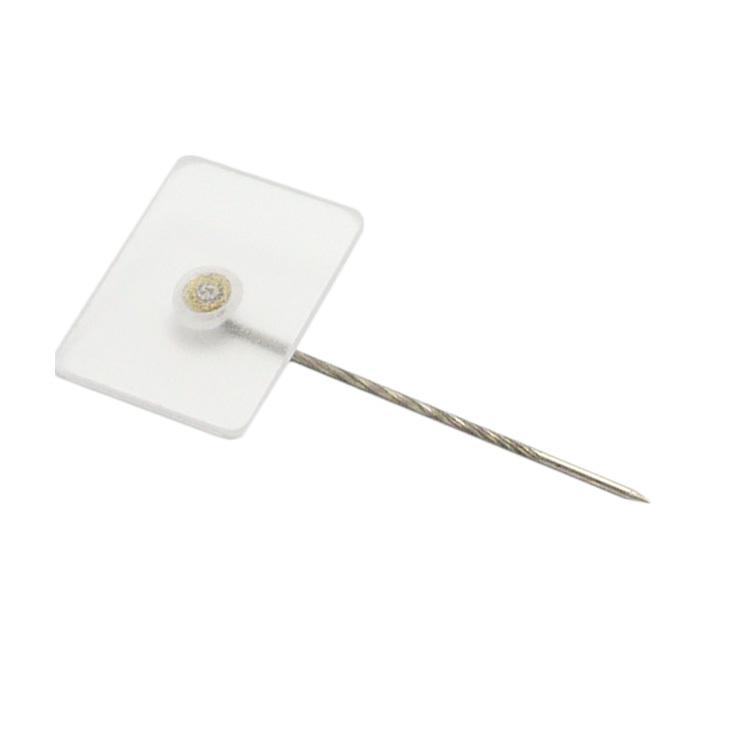 Holders enhance the signs that serve you daily. 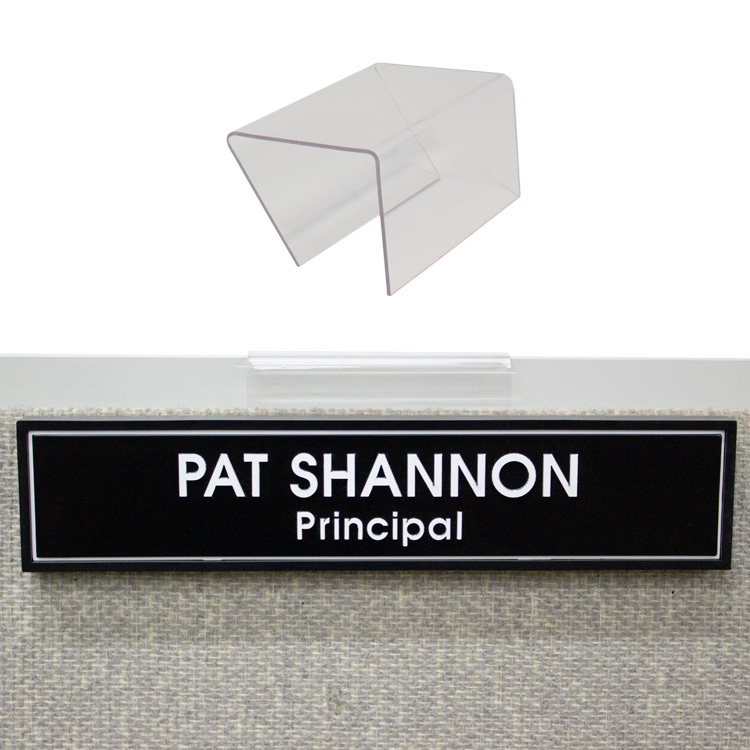 Desk holders provide a professional and elegant solution for desk nameplates and directional signage. 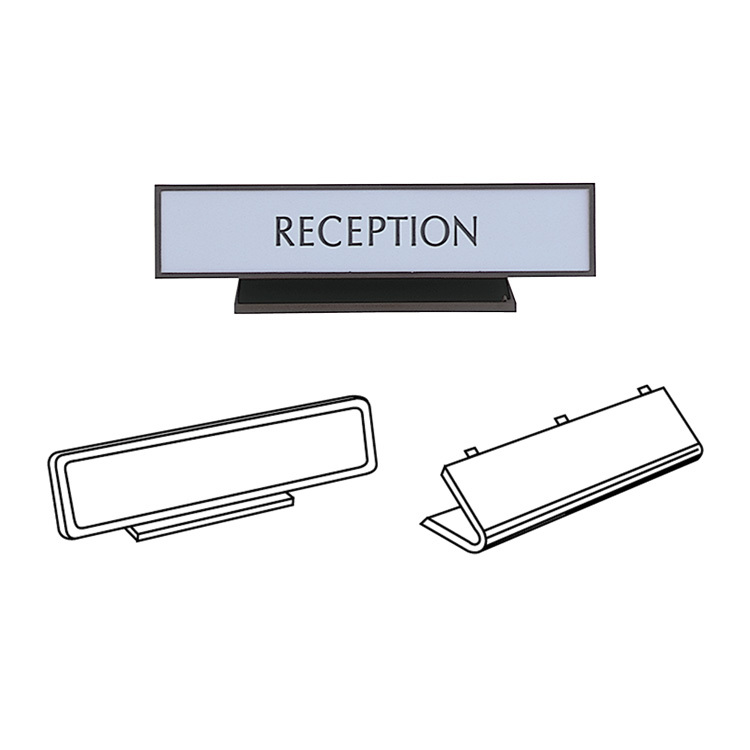 Desk and counter bases are designed to support both small and large signs by having a single base slot and no top channel. 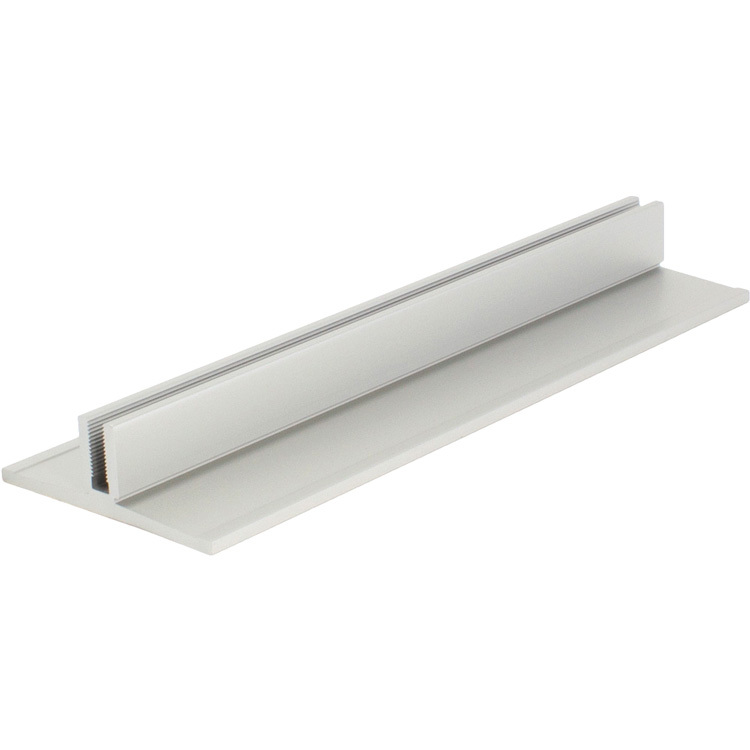 Corridor brackets are designed to make corridor wayfinding signage simple. 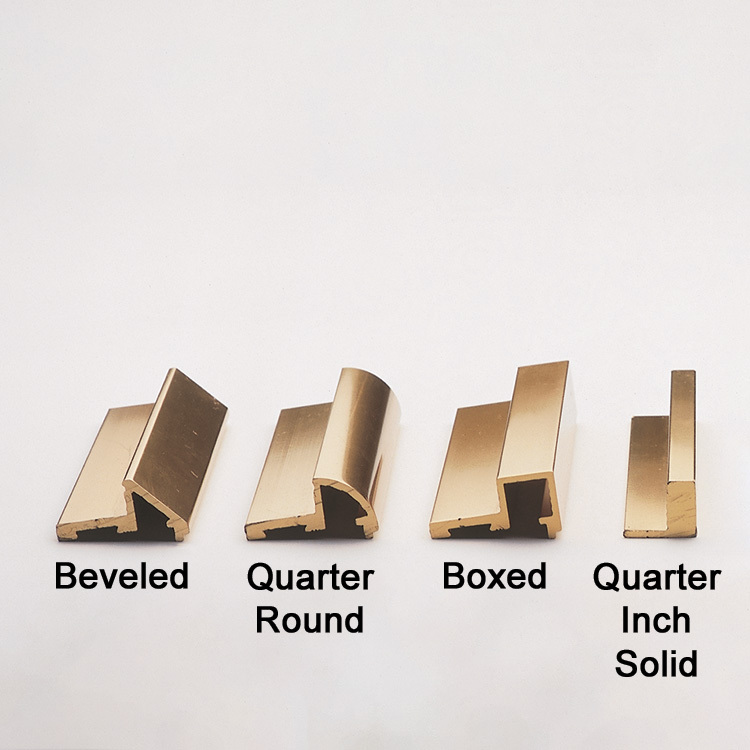 JRS Extrusions can be used to build your own custom mounting solution, use multiple extrusion to create custom sized slots, directory frames, or wayfinding signage. 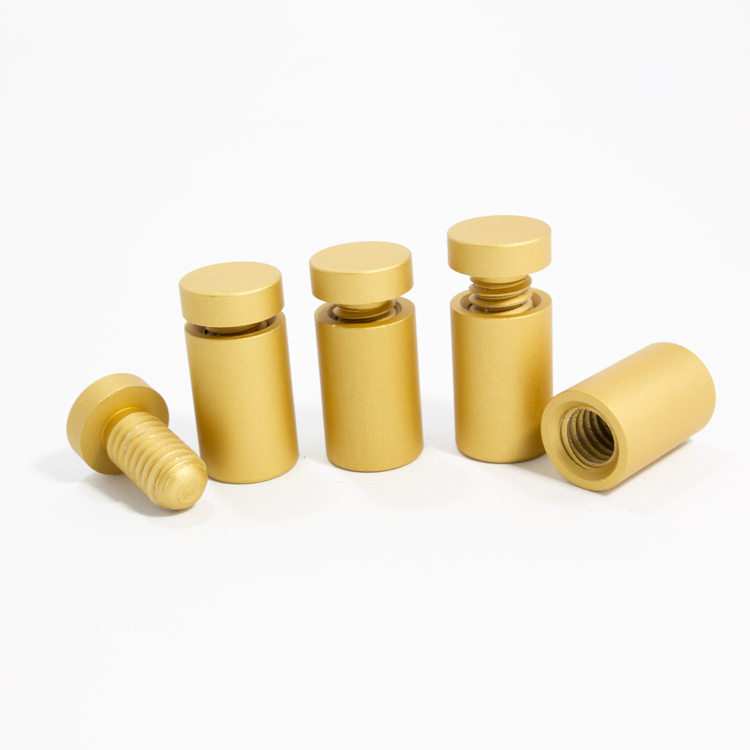 In our continuing effort to be a steward for the environment, we are introducing our Environmentals line of holders. 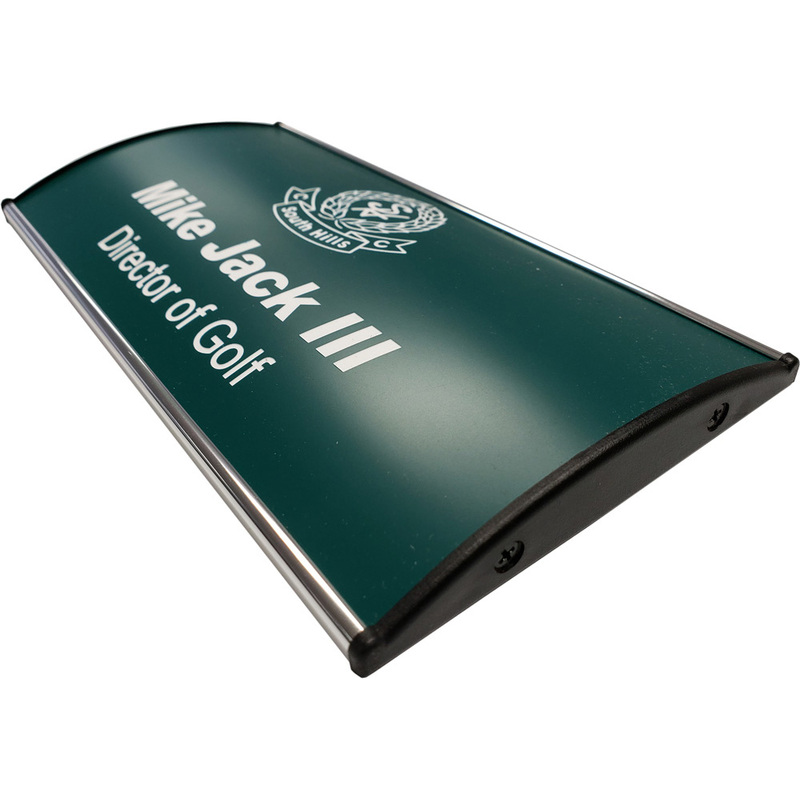 JRS is also a proud distributor of these products in addition to many other sign supply products. 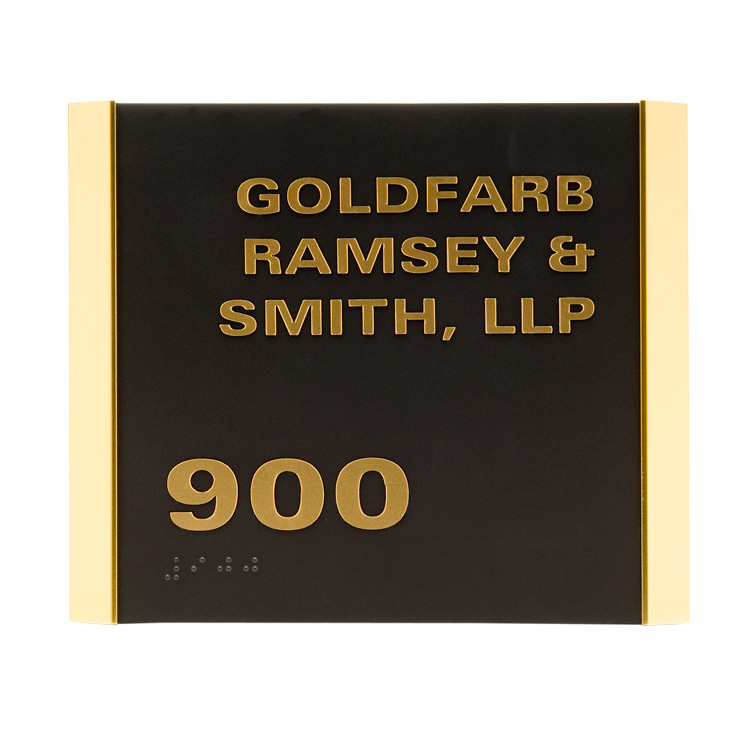 We carry laser & rotary engraving materials, braille & ADA supplies, badge accessories, and sign supplies. 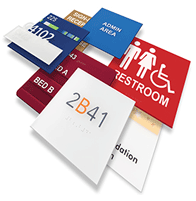 The Duets sheet stock line provides premium quality rotary, laser engraving and ADA substrates in a large variety of color choices which is ideal for architectural sign manufacturers and recognition engraving professionals looking for engraving product at a reasonable price. 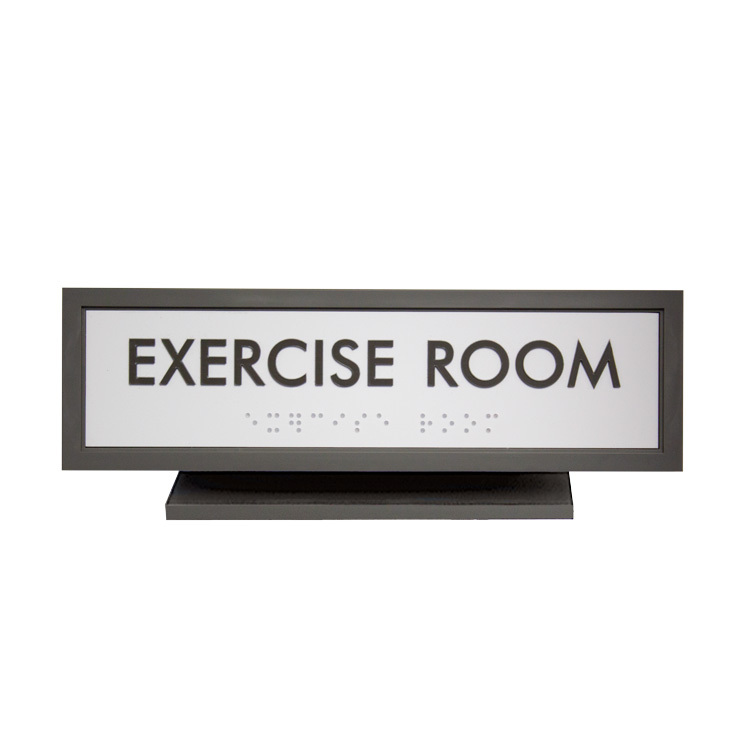 Produce high quality ADA-compliant signage with our ADA Braille Balls. 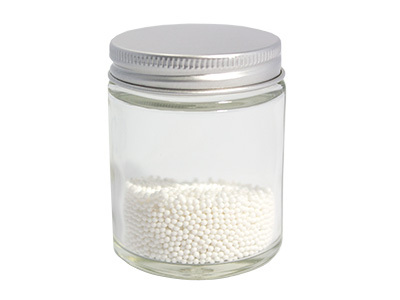 Beads can be applied to any material which has been drilled for braille beads or raster beads. 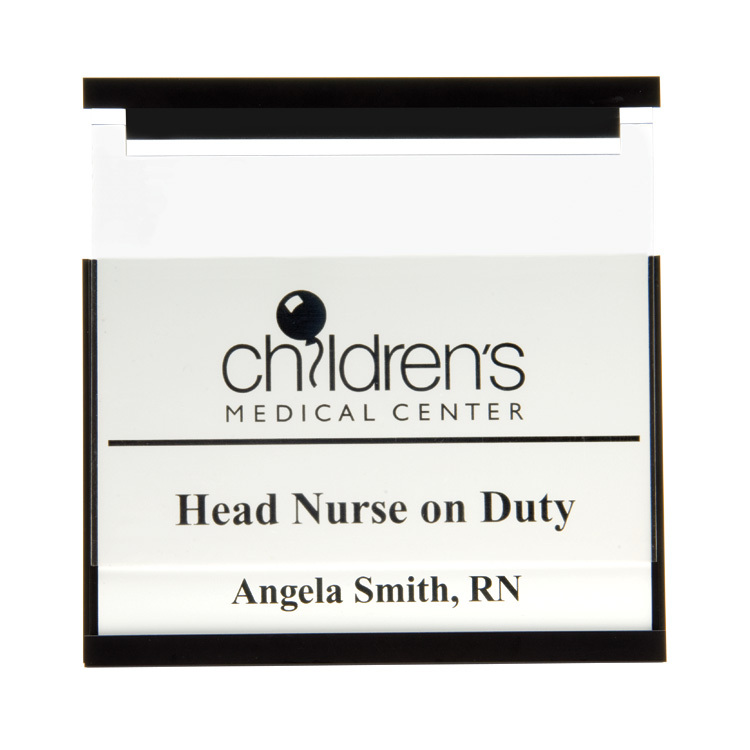 JRS carries a wide selection of products to produce high quality name badges. 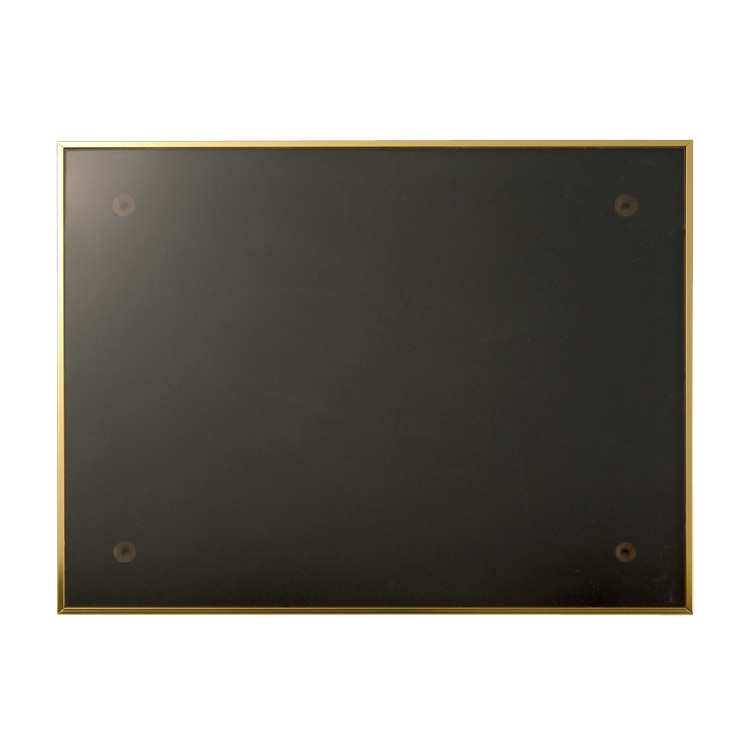 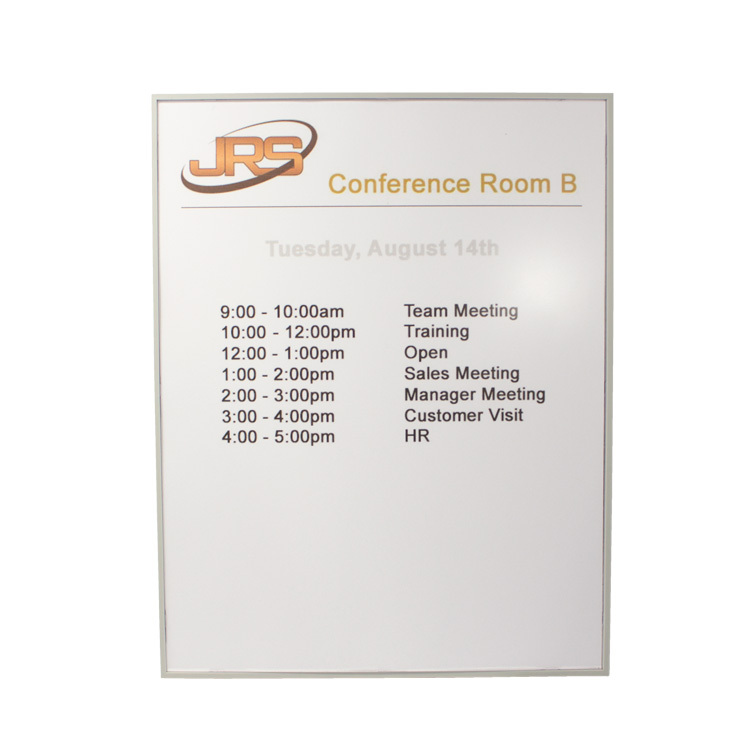 JRS mounting and sign supplies make working with signage easy. 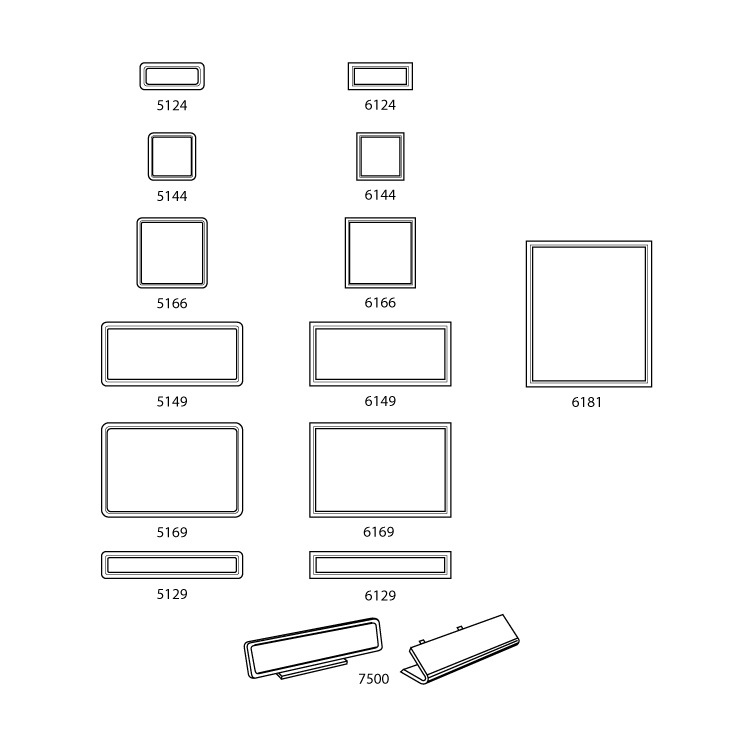 Choose from one of three ways to order. 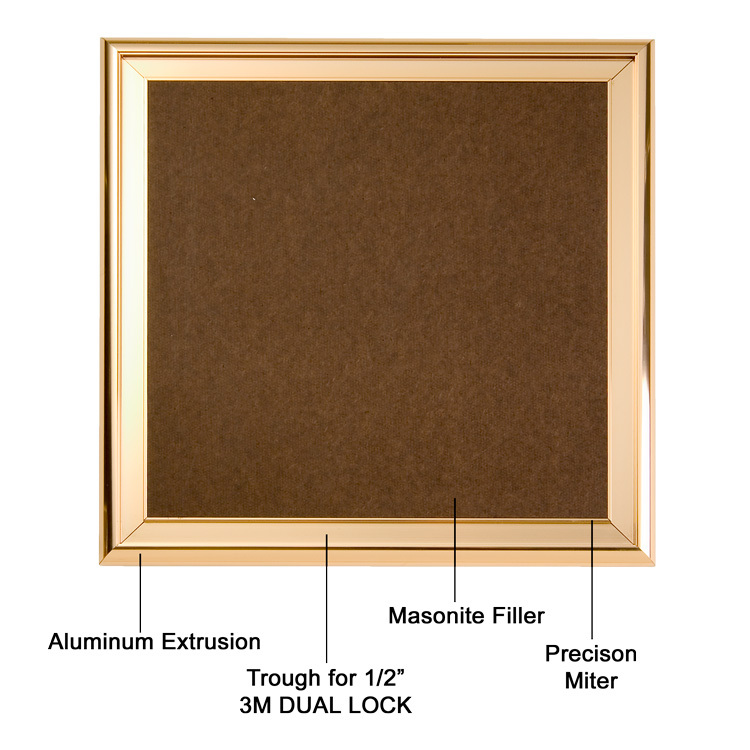 Contact one of our premium distributors. 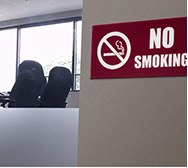 Family owned and operated since 1962, JRS has become the industry leader in the manufacturing of sign frames and holders in the U.S.A. We have developed a standard which insures the highest quality products and complete customer satisfaction. 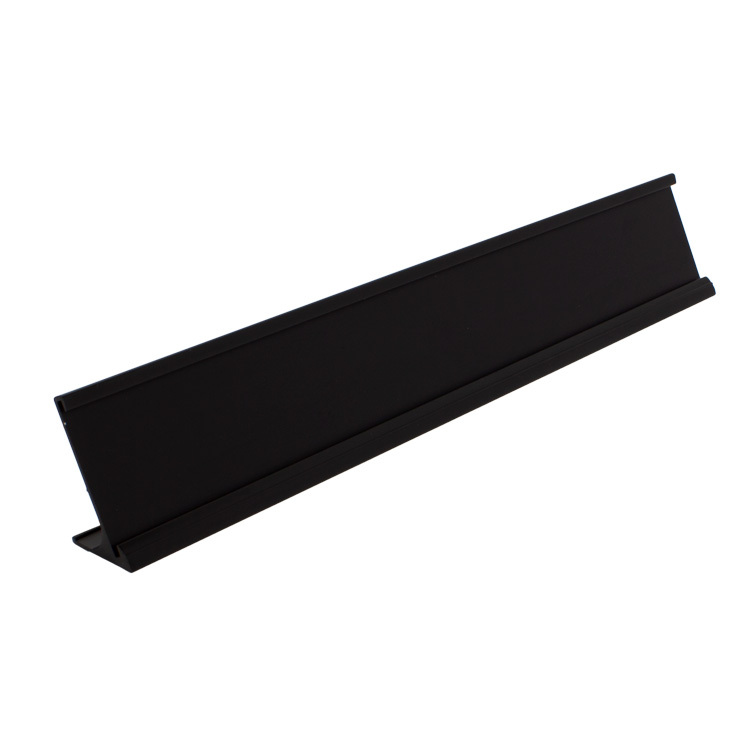 Producing our wide range of products solely in America, we are proud to give our customers exactly what they want. 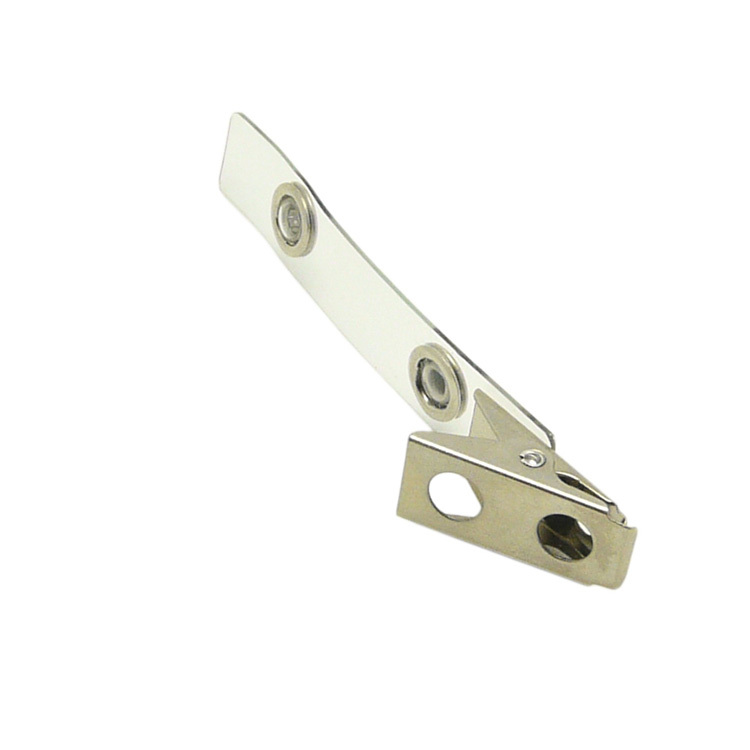 We will make our quality frames and holders to any customized specifications asked for in a timely process. 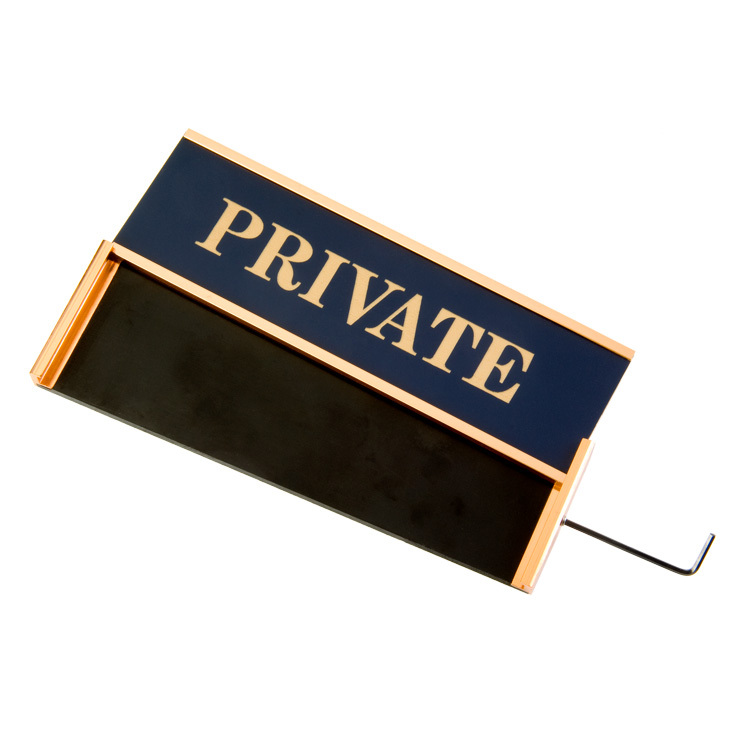 By doing this, we have established true and sincere customer/supplier relationships. 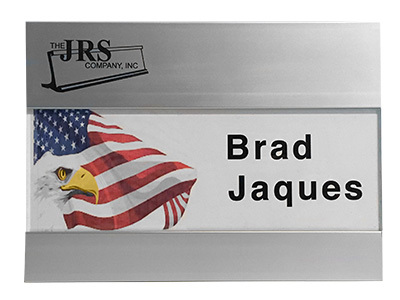 Thank you for your continued partnership and support of the JRS Company, Inc.
We currently have 3 locations in the U.S.A. Our California branch is our headquarters and also manufacturing location. 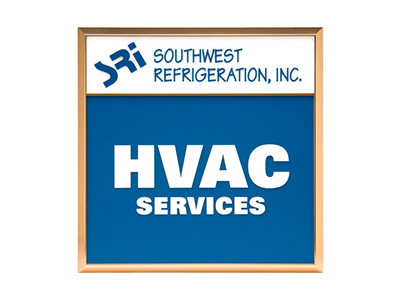 All locations inventory product and provide customer service. 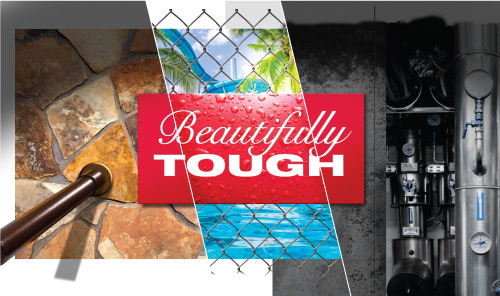 Here is a list of our loyal distributors across the US. 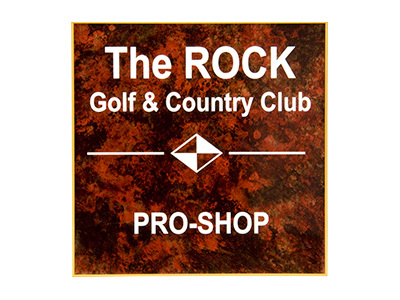 A list of all our resellers can be found HERE. 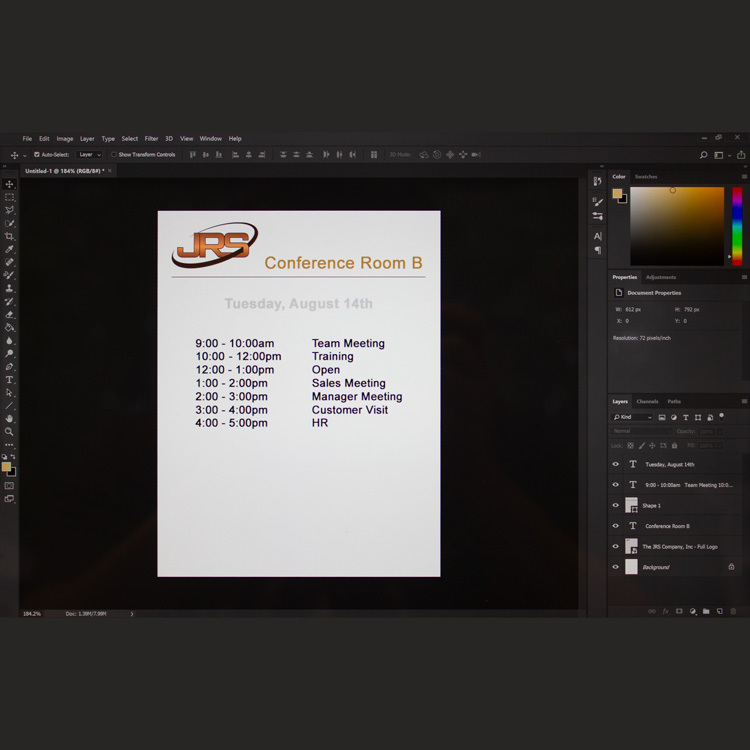 Please contact us with any questions or feedback you might have. 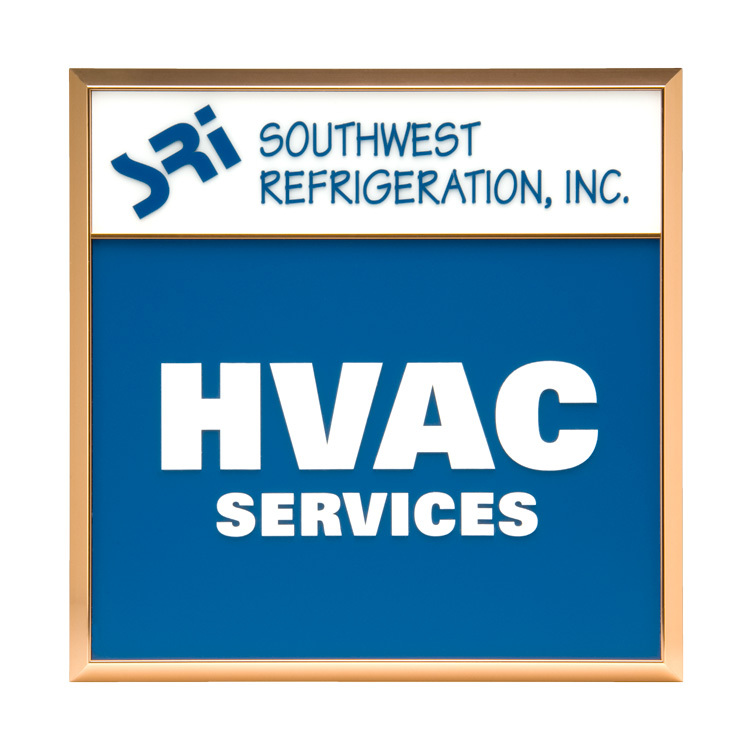 We take pride in helping your business succeed. 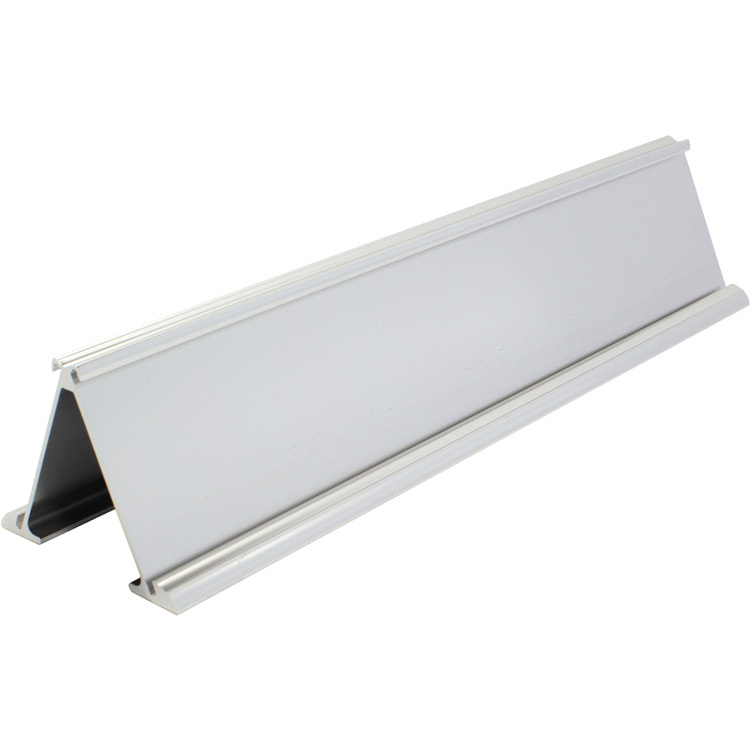 Our architectural aluminum frames are the perfect addition to any office wall, door, counter or ceiling. 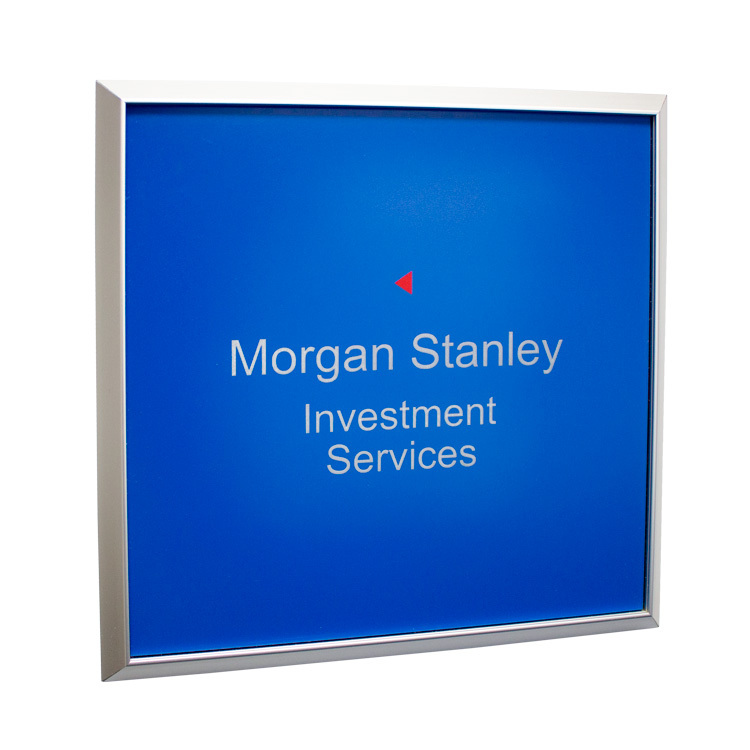 Architectural aluminum frames provide a simple, yet elegant frame solution to any signage. 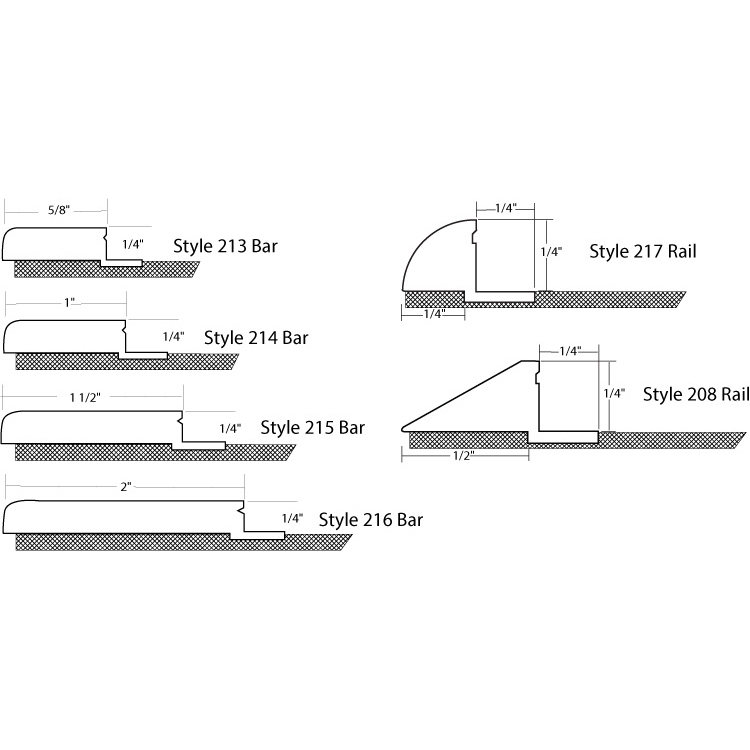 All frames are custom fabricated to your desired specifications from a continuous aluminum extrusion. 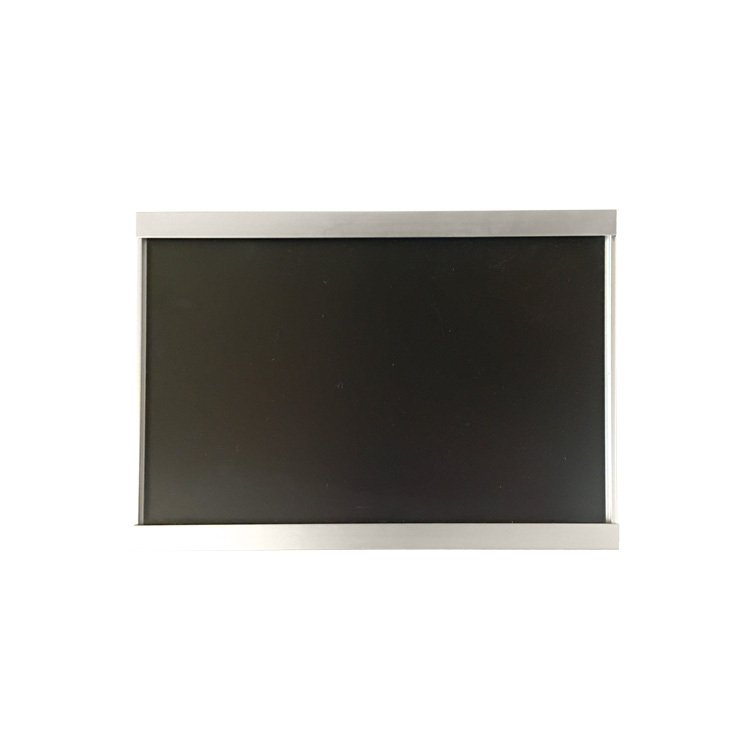 Custom shaped aluminum frames are available. 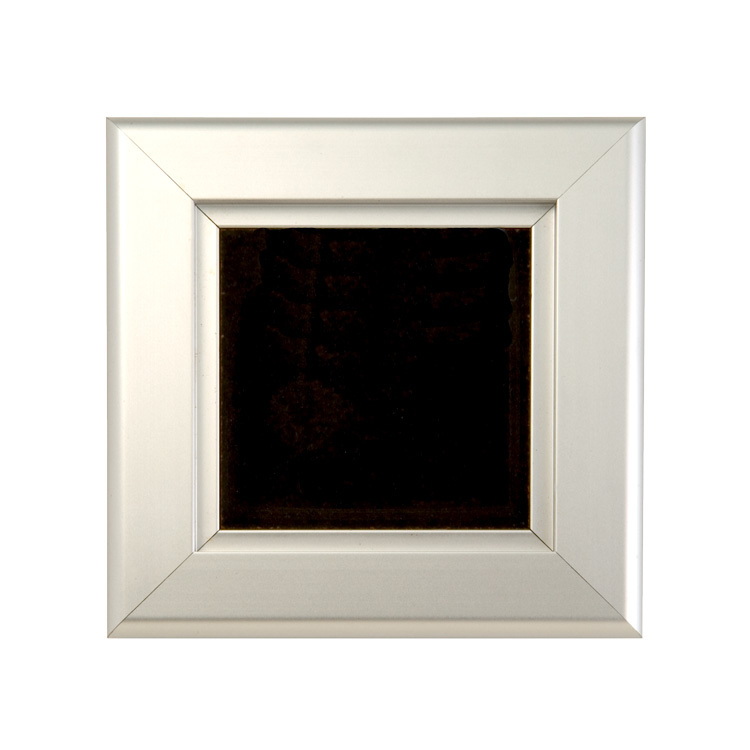 Examples include circles, triangles, ovals, and domed frames. 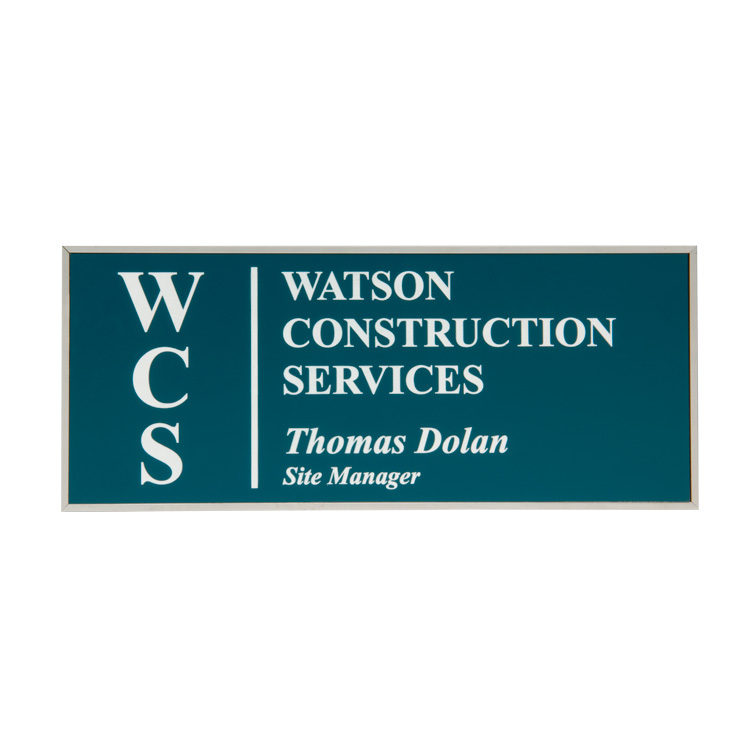 Please call for more information or to request a quote. 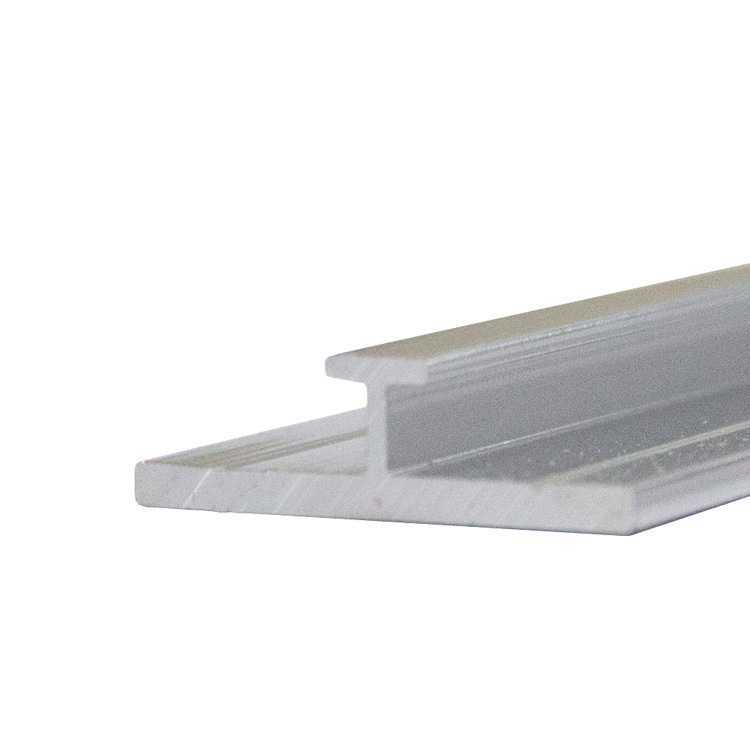 Made of a semi-flexible acrylic material with tabs that snap into a small channel in the frame extrusion. 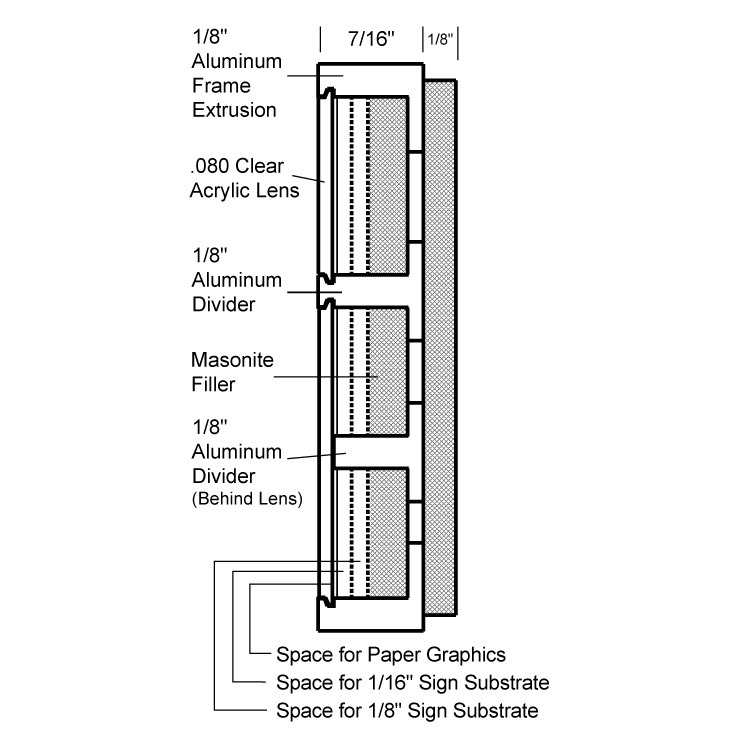 Lenses can be screen printed and have tactile or Braille mounted to them while exposing a paper graphic. 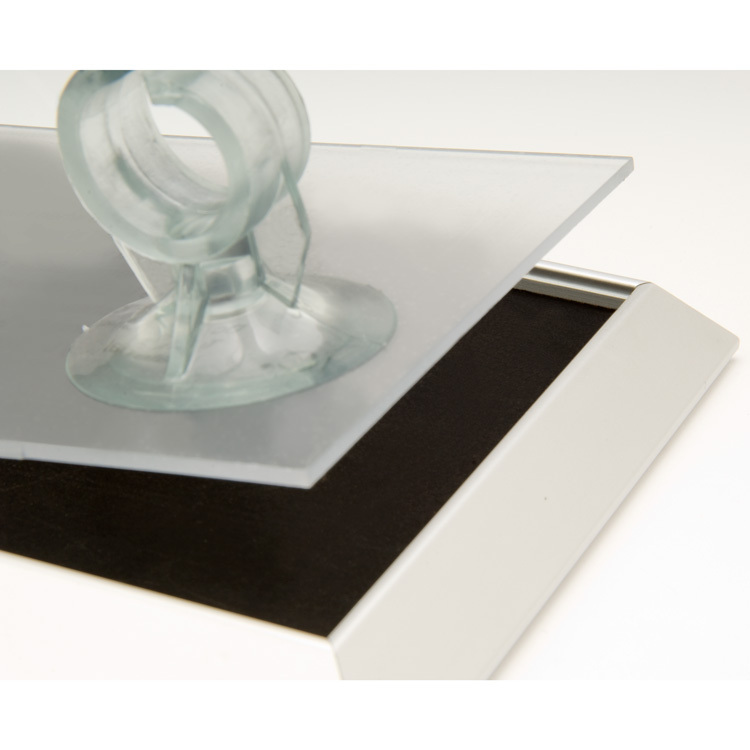 Lenses are easily removed with a suction cup. 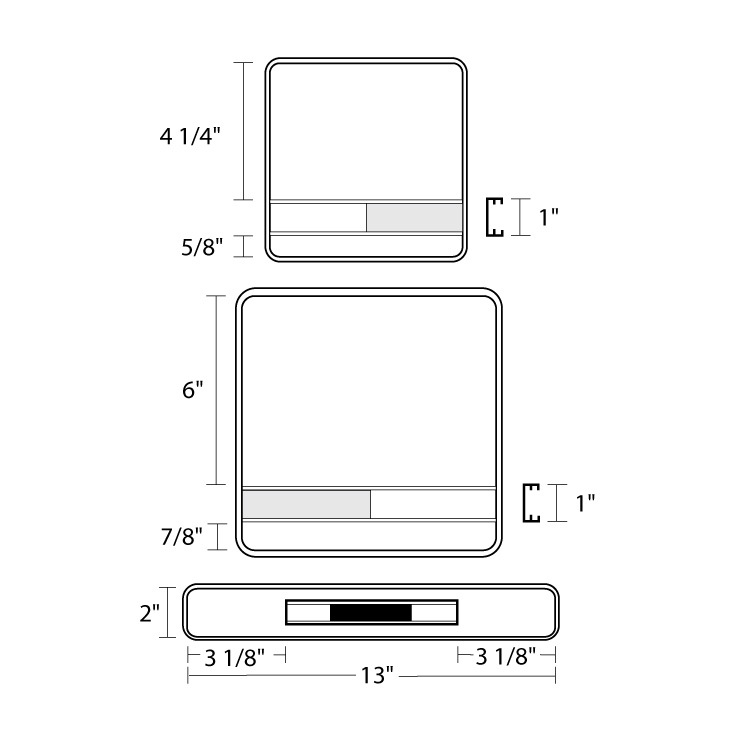 Three standard frame sizes: 6" x 6", 8" x 8", and 2" x 13" (inside dimensions). 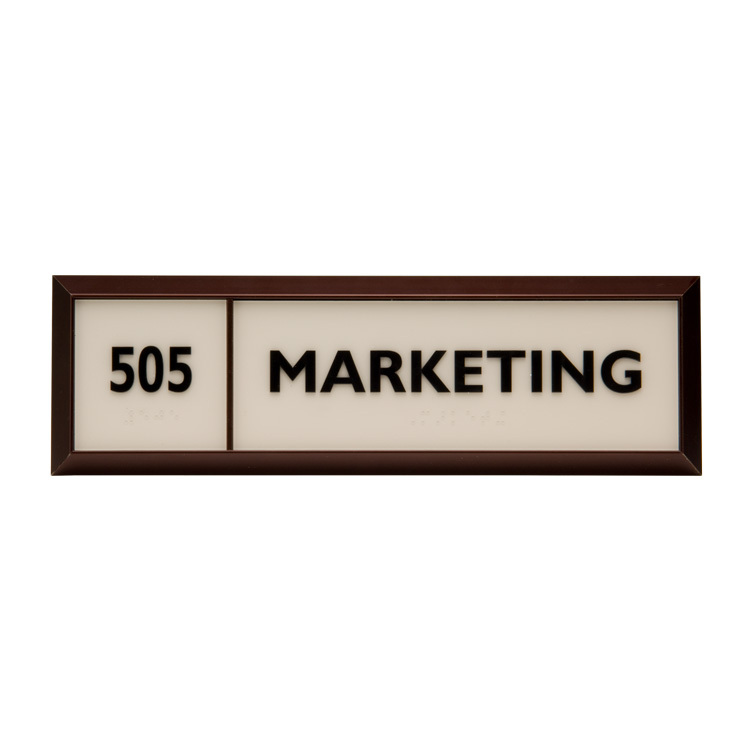 Contains a 1" x 6" extrusion for a 1/16" message plate and a secondary 1/16" slot for a 1" x 3" cover plate to display alternating messages. 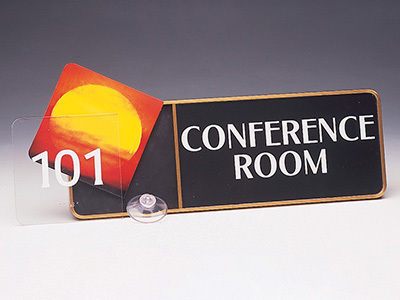 Contains a 1" x 8" extrusion for a 1/16" message plate and a secondary 1/16" slot for a 1" x 4" cover plate to display alternating messages. 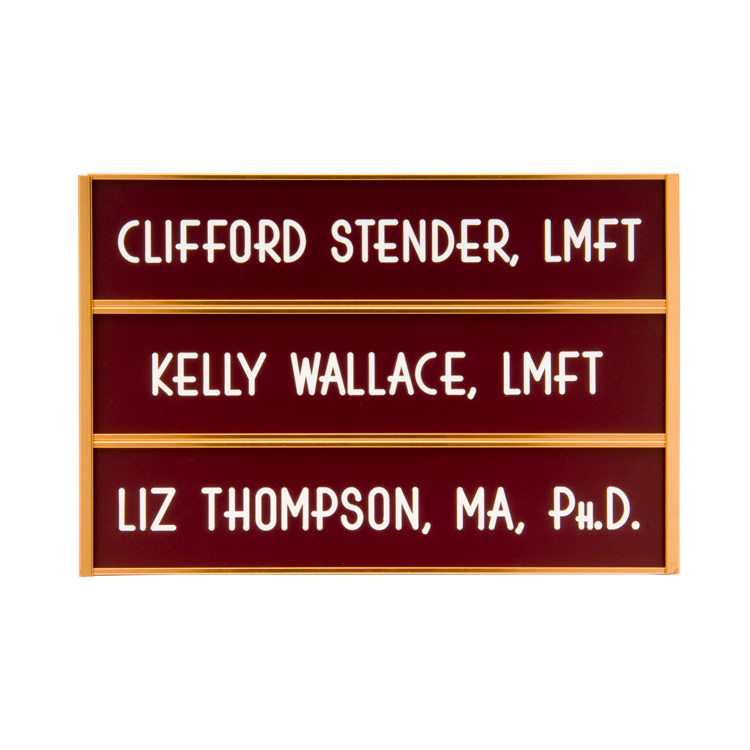 Designed for 2" x 10" message plate to slide right to left to expose alternating messages on each side. Max rail length = 39"
Innovative and cost effective. 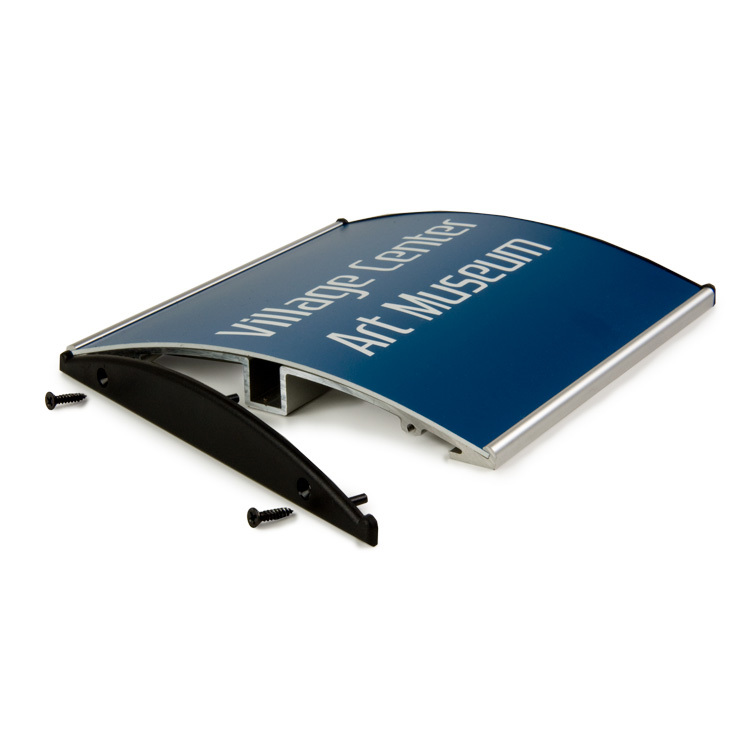 Curves adds a whole new dimension to sign frames. 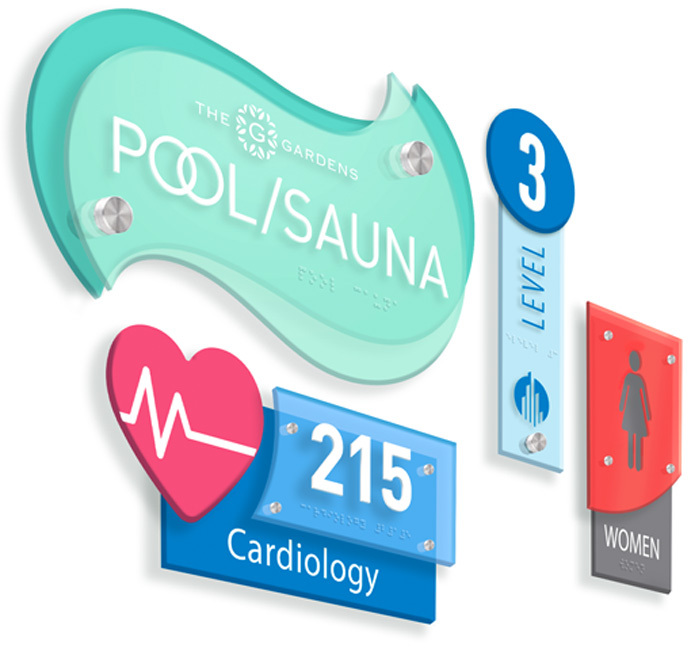 Available in 27 popular sizes and 9 anodized colors, Curves has many applications including personnel signs, room identification and direction wayfinding signs. 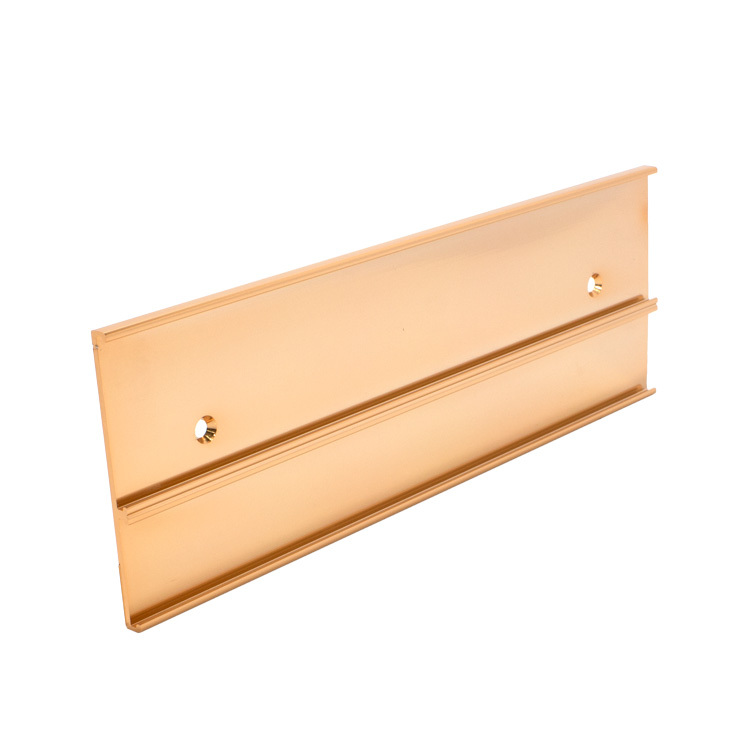 Curves can be mounted to a wall or partition, hung from the ceiling with fixed bracket or wire, flag mounted or used as a desk signholder ...CURVES... literally, the options end only with your imagination! 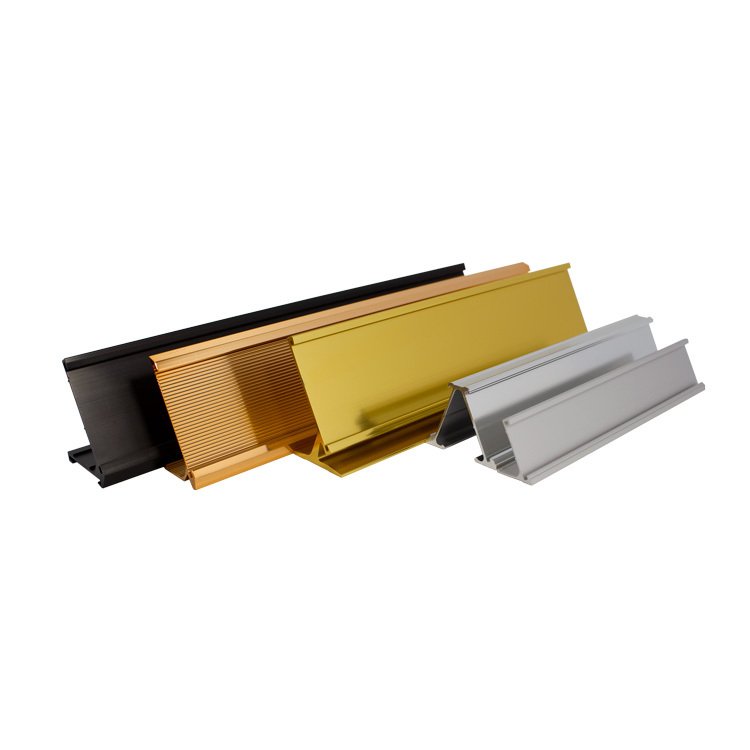 The Decorative Rail frame system is a clean, simple frame system that utilizes similar dynamics as our Decorative Bar system in a more subtle appearance. 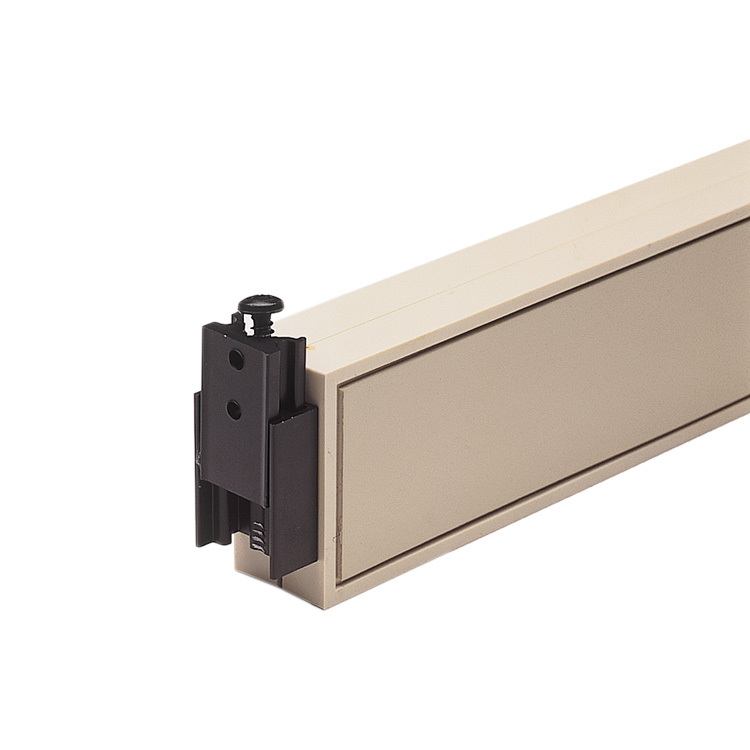 Ideal for room identification, personnel nameplates, and evacuation plans, the Decorative Rail system is the solution when looking for a classic architectural look without breaking the budget. 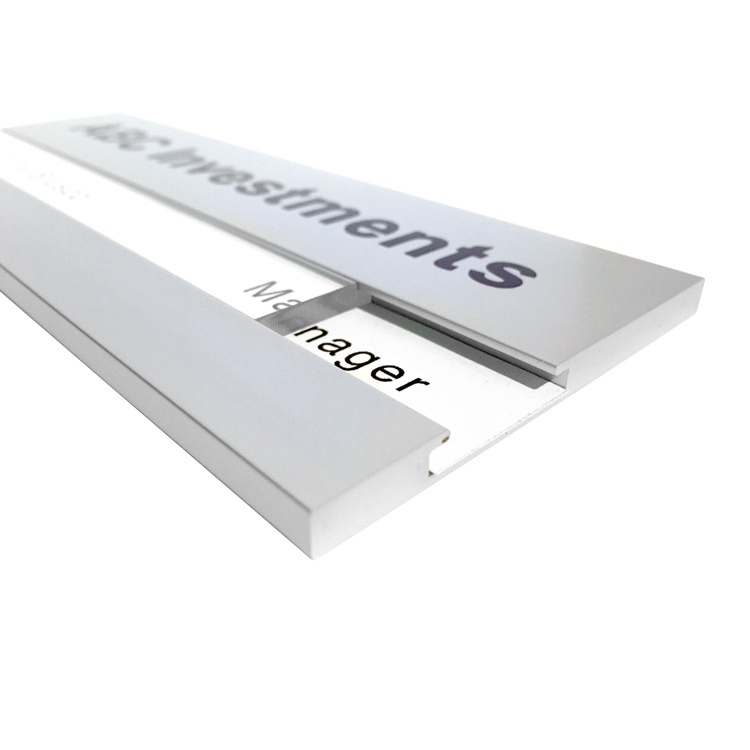 Use as a single frame or combine the Euro System with our Aluminum Holders to create tamper resistant directories, large and small. 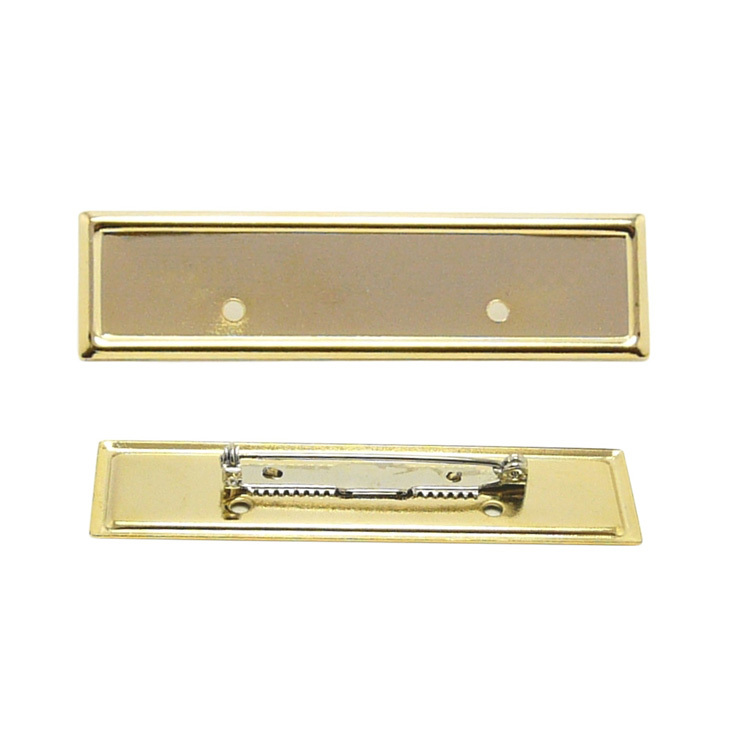 Specifically designed machined screws in round or square head lock the sign assemblies in place and provide security for your signage. 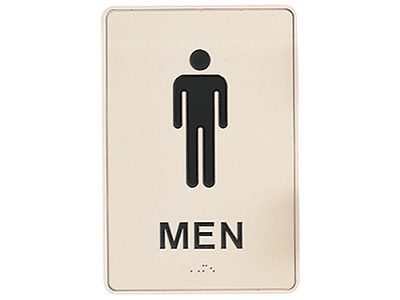 Top screws are simply removed to make signage updates. 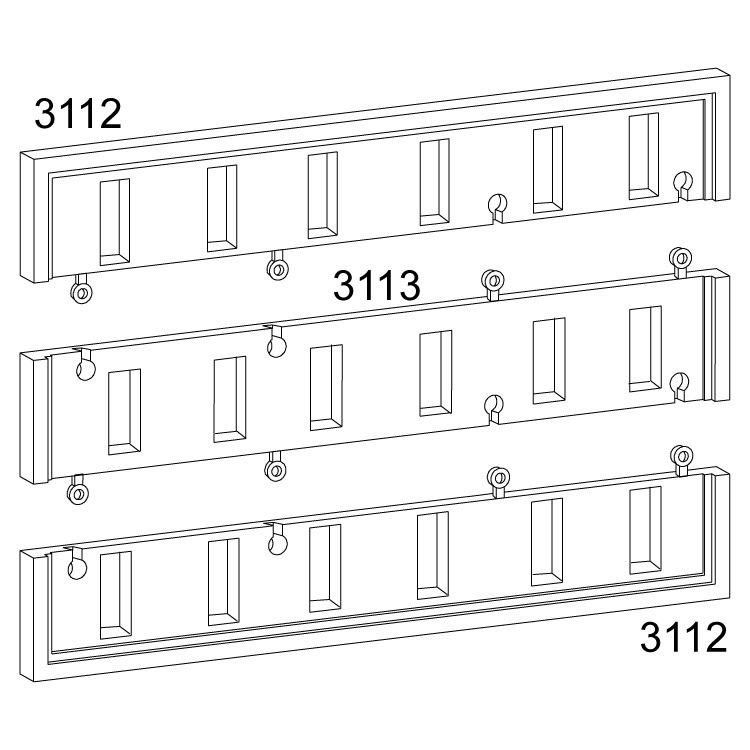 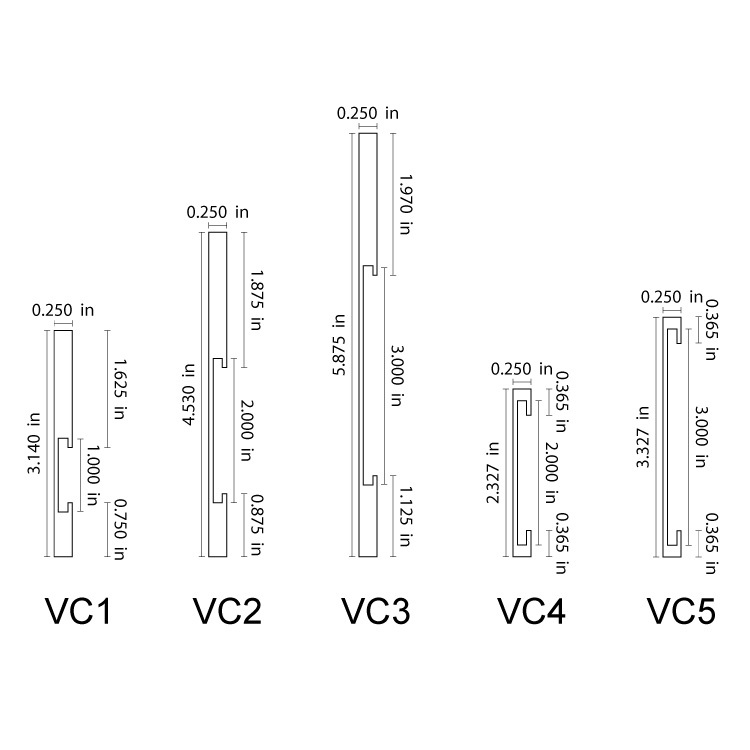 Vertical dividers can be used to create multiple column directories. 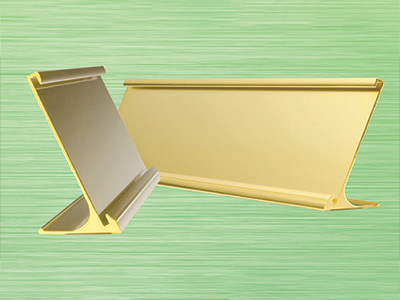 Sign assemblies are stacked to create directories which round out the Euro Sign System. 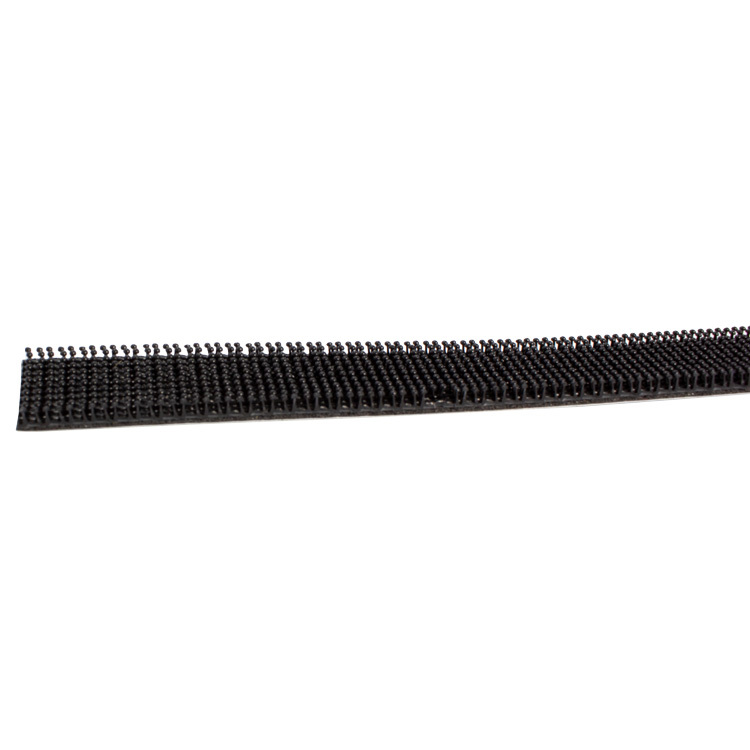 Square and round head screws are specially designed to cap off extrusions, and lock in the holder assemblies. 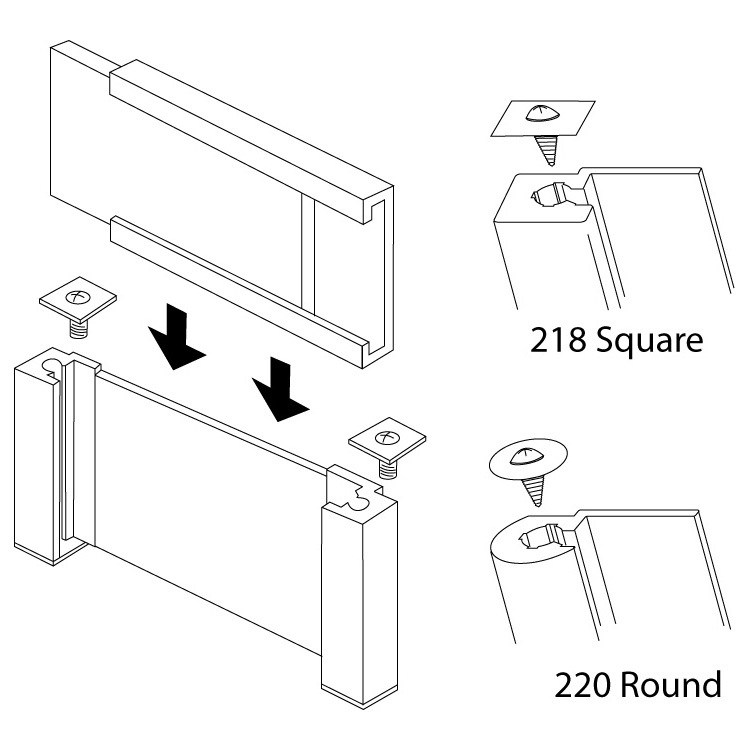 Simply remove the top screws and slide sign assemblies out for a quick change. 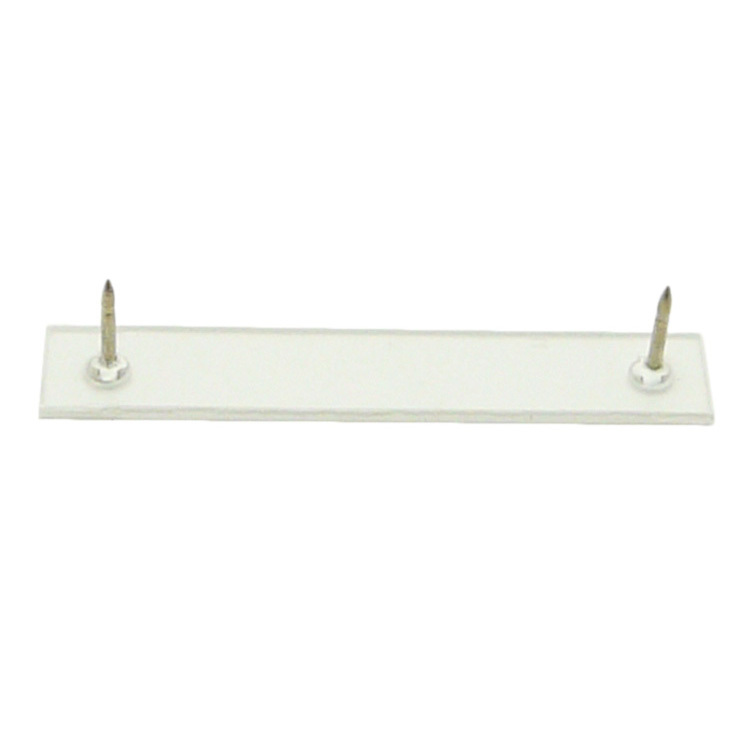 Screw holes are tapped for repeated use. 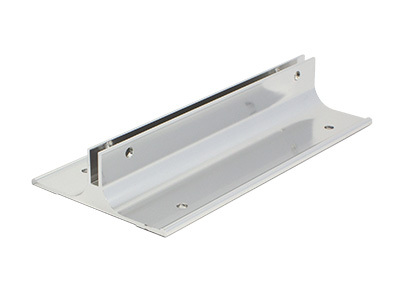 Features a one piece magnetic backed extrusion with six 1/2" x 6" slots for easy plate changes. 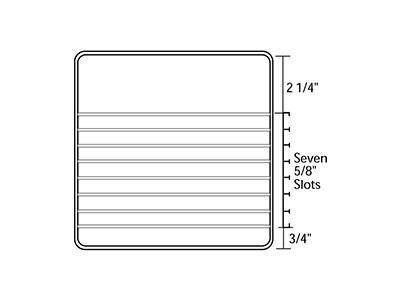 Features a one piece magnetic backed extrusion with seven 5/8" x 8" slots for easy plate changes. 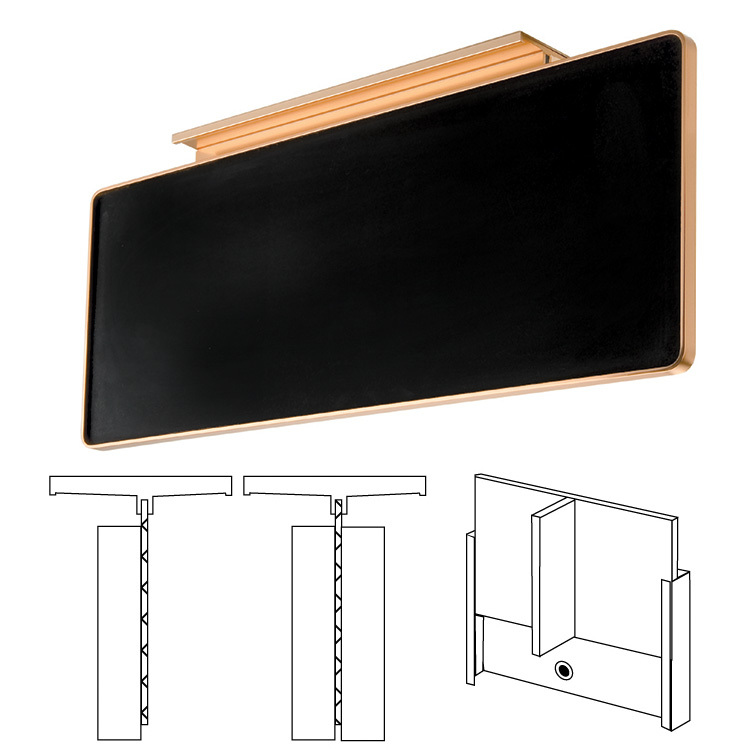 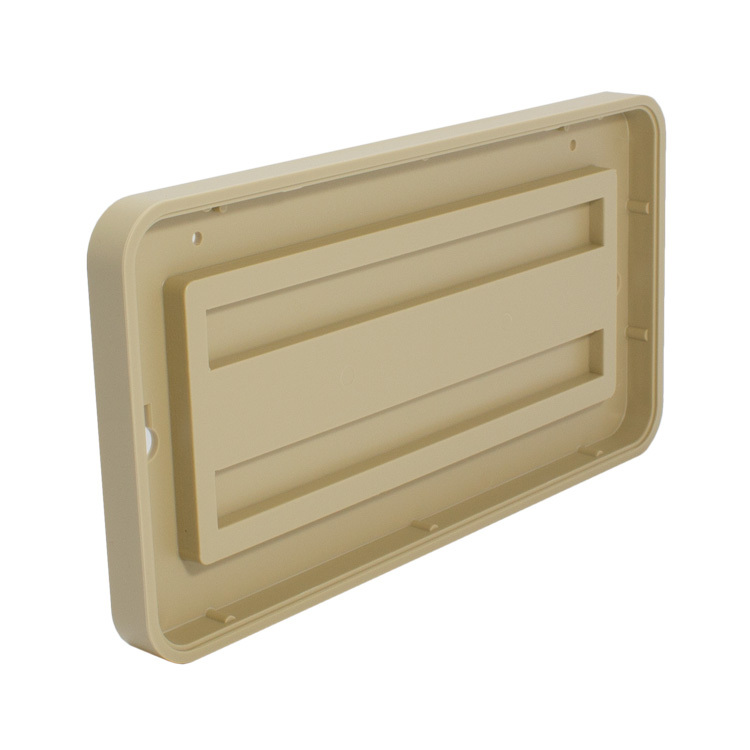 A trough 1/2" wide runs the entire inside perimeter of each frame which accommodates adhesive-backed 3M DUAL LOCK™ or Sign Snap so that a tamper-resistant plate snaps in and out with the use of a suction cup. 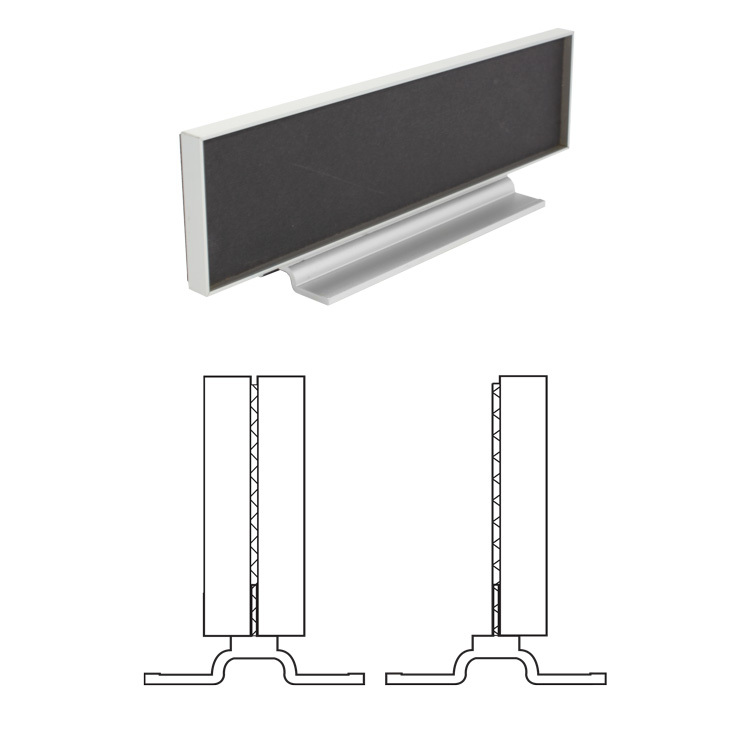 JRS wall holders are made from a premium aluminum billet and are available in multiple styles and sizes. 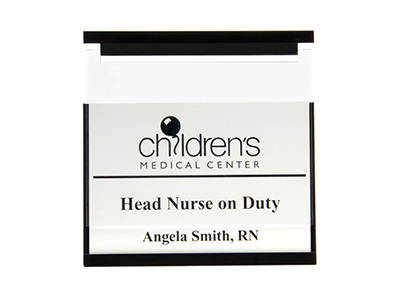 Holders enhance the signs that serve you daily. 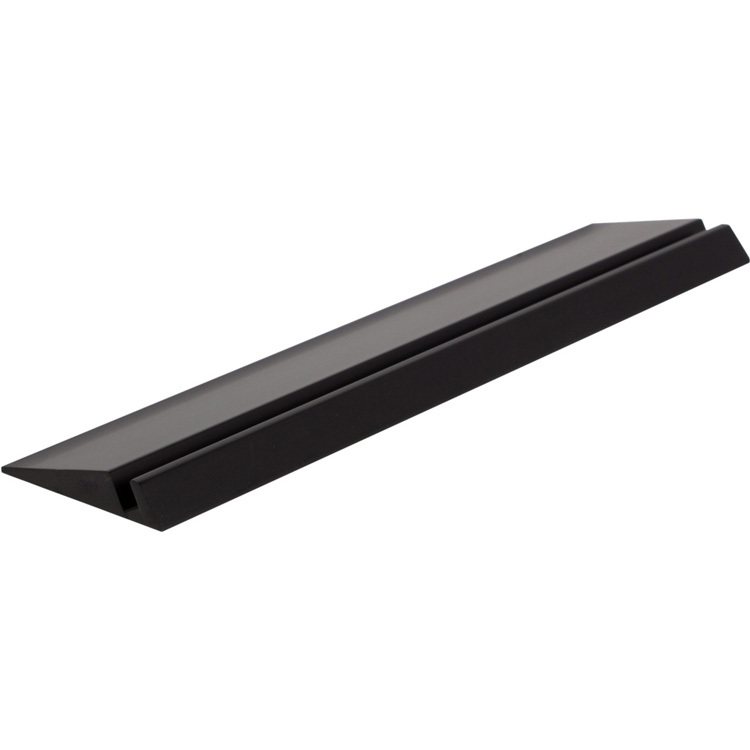 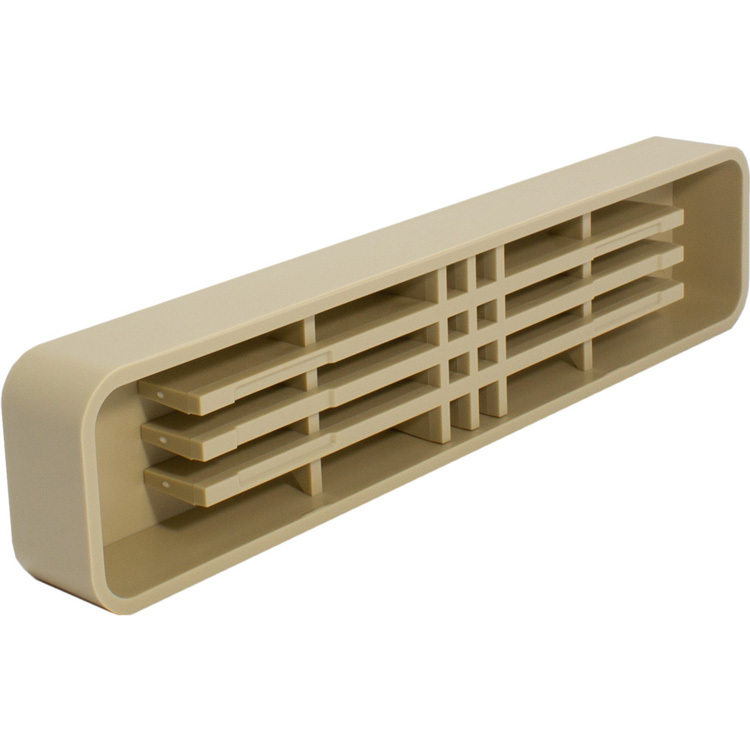 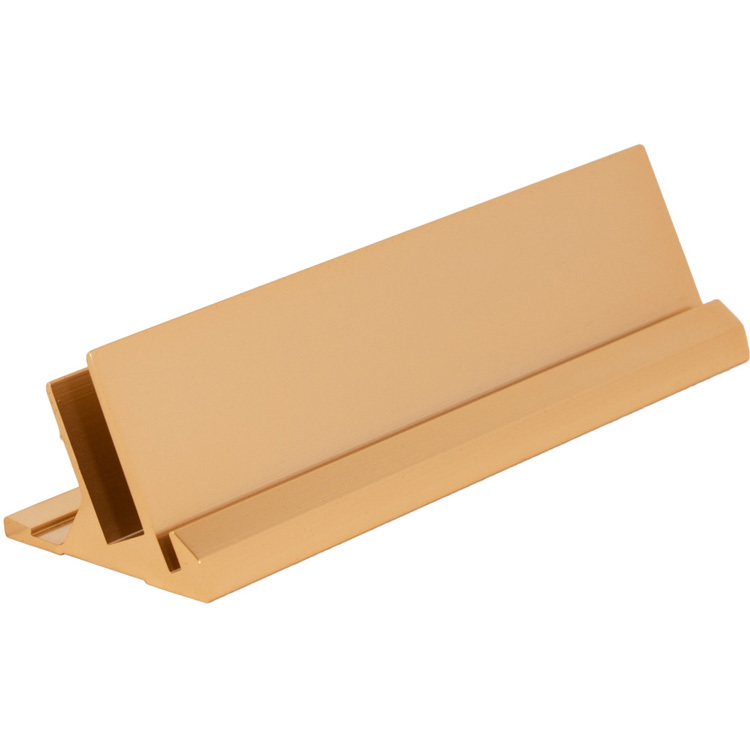 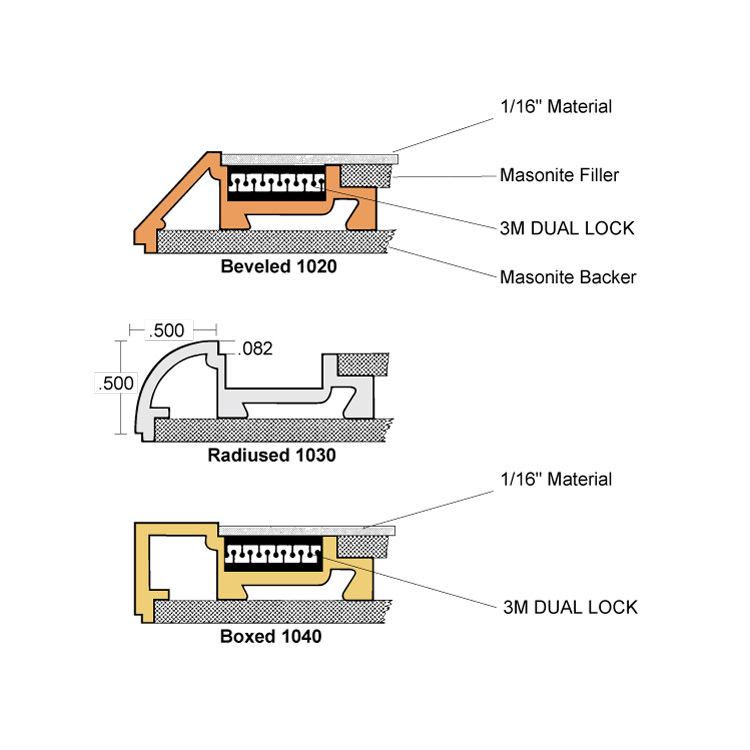 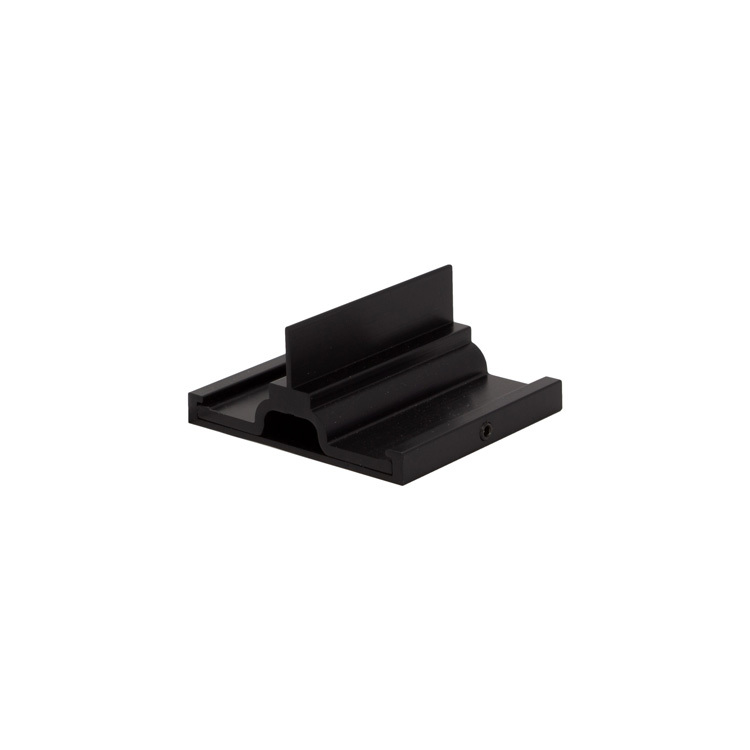 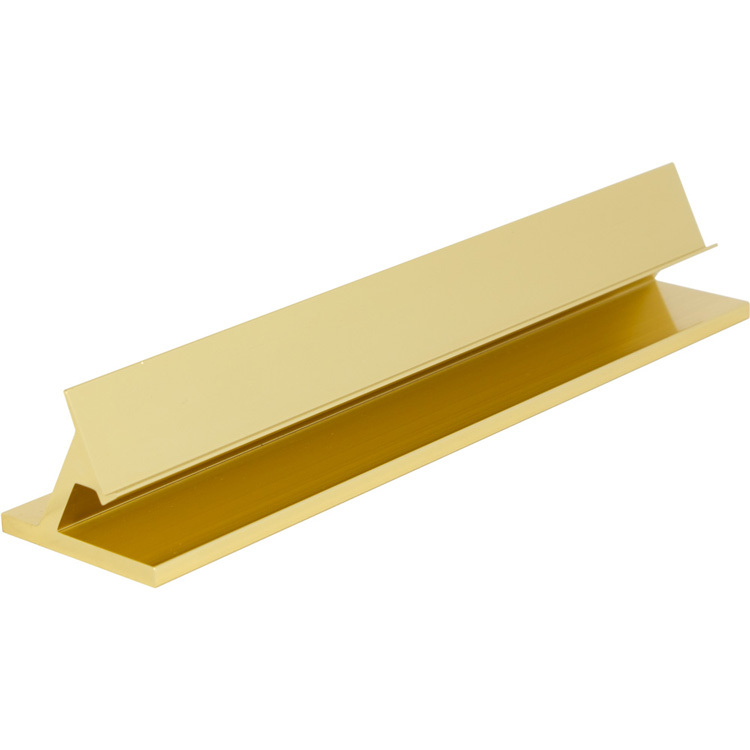 Our wall holders support 1/16", 1/8", and 3/32" thick materials. 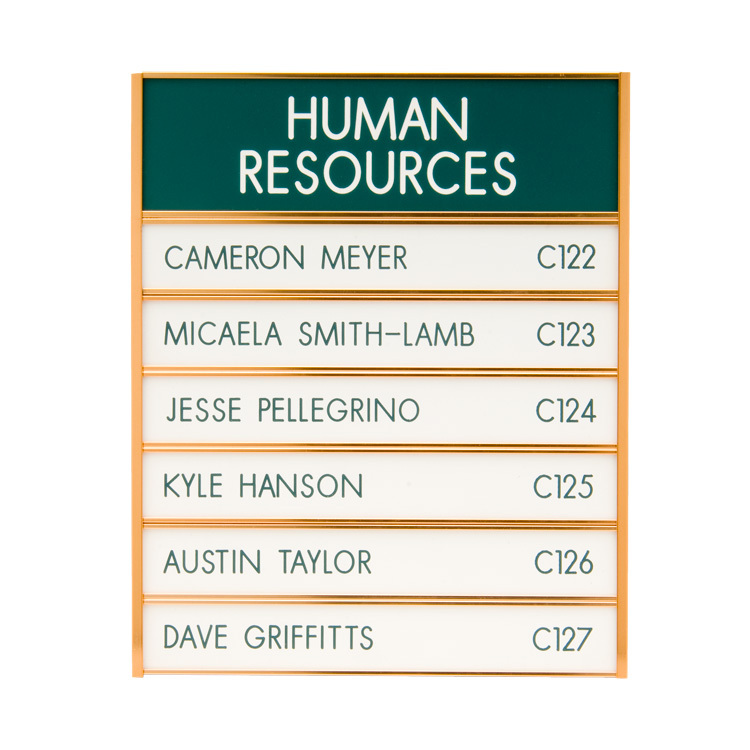 These nameplate holders come standard with mounting holes for all inserts with heights between 1-1/4” – 4” and lengths 4” – 24”. 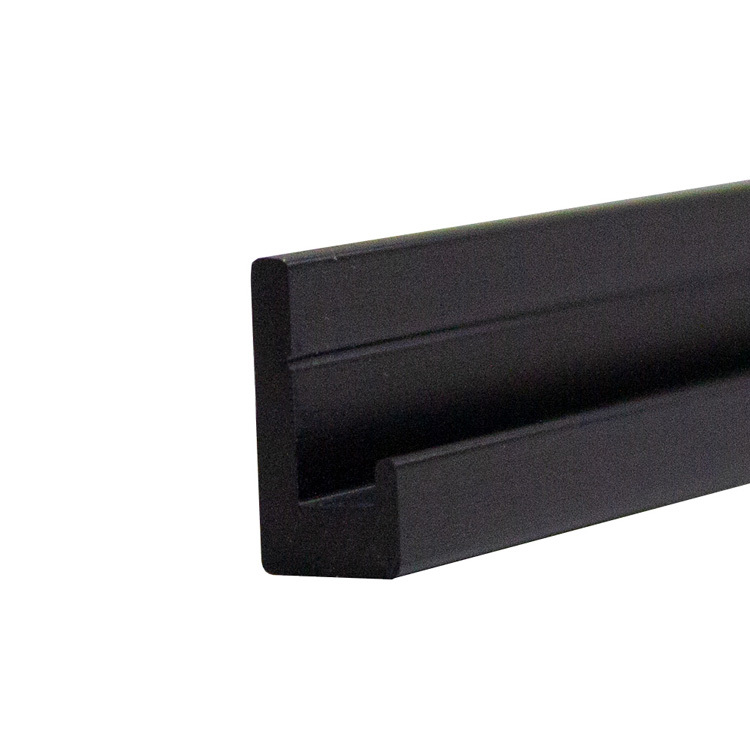 Custom lengths are available up to 39". 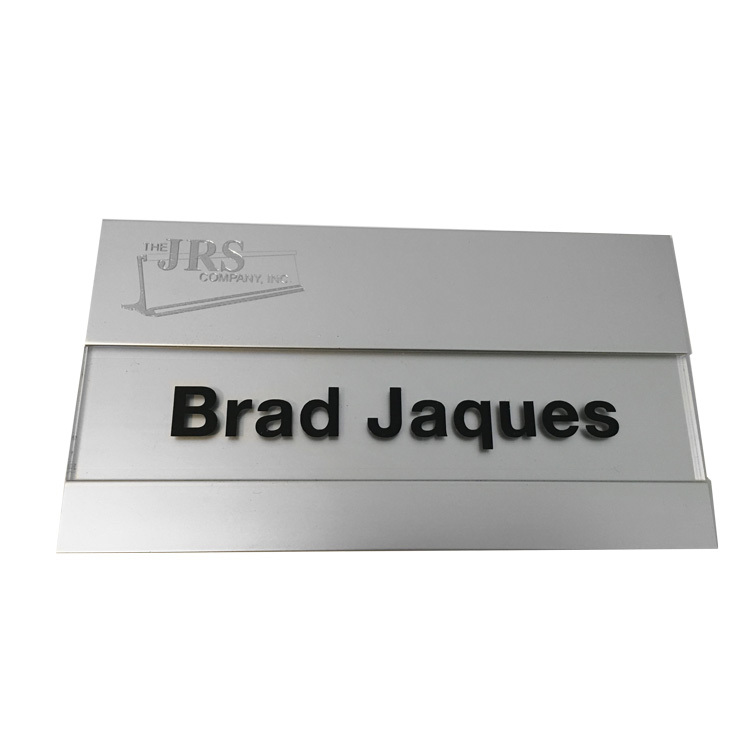 JRS desk holders are made from a premium aluminum billet and are available in multiple styles and sizes. 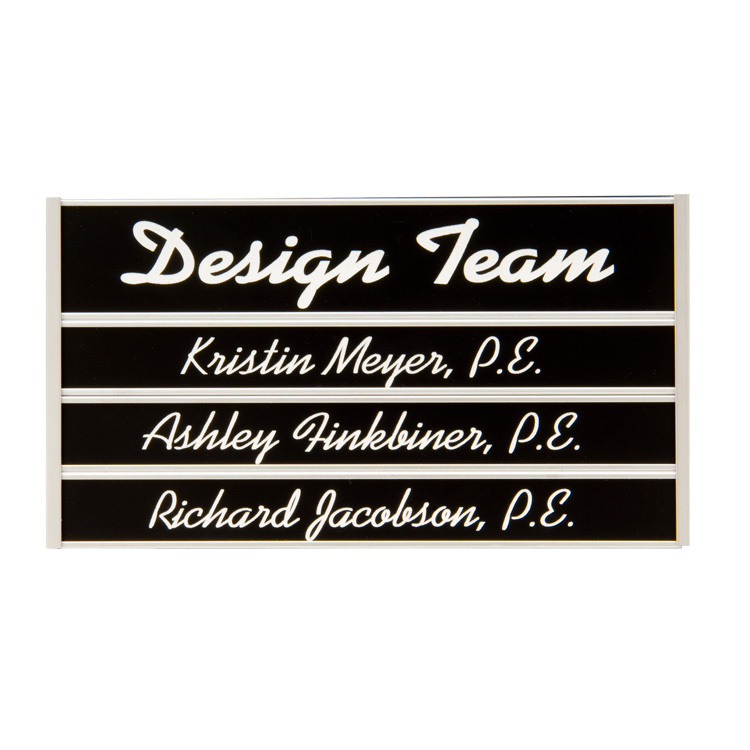 Our desk nameplate holders support 1/16", 1/8", and 3/32" thick materials. 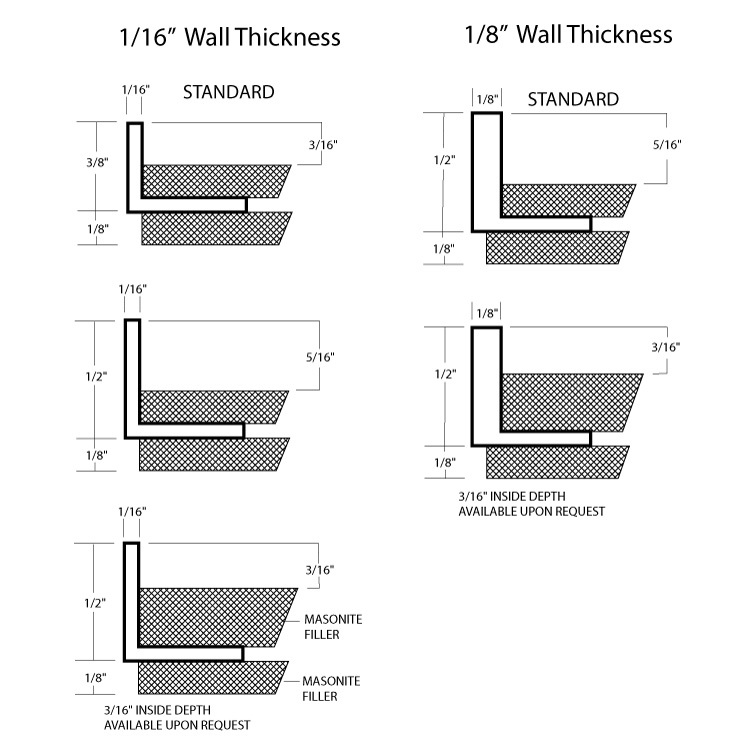 Custom lengths are available up to 39". 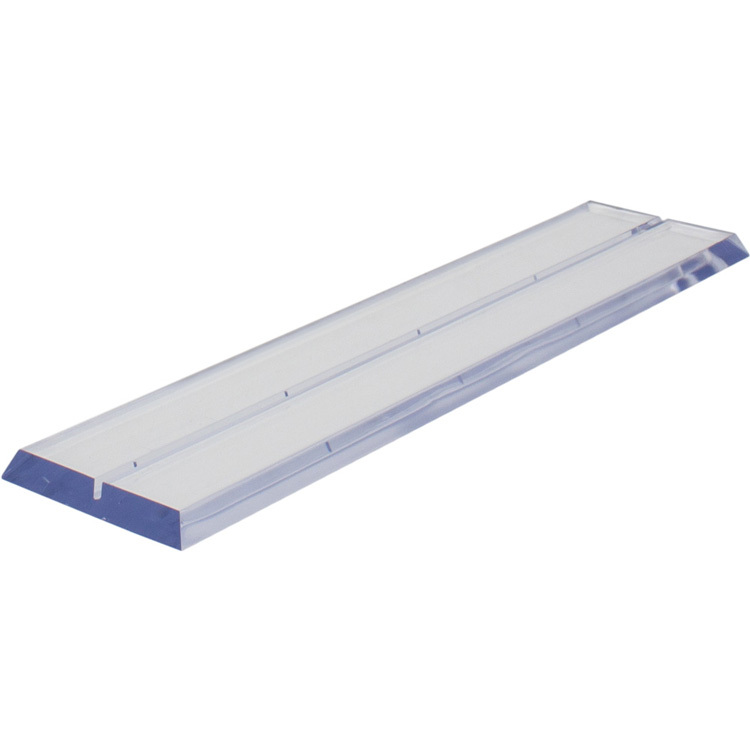 JRS desk and counter bases are designed to support both small and large signs by having a single base slot and no top channel. 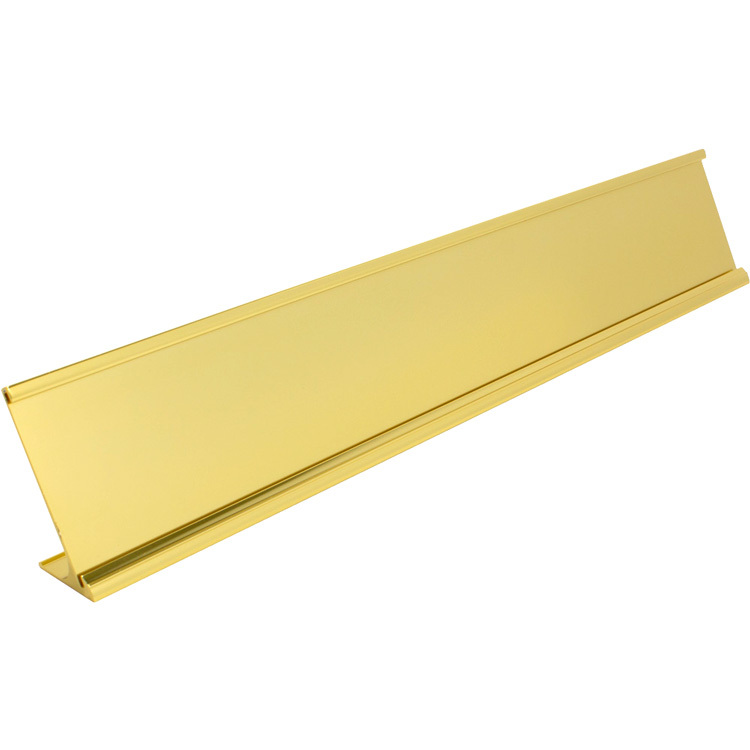 Our desk nameplate bases support 1/16", 1/8", and 3/32" thick materials. 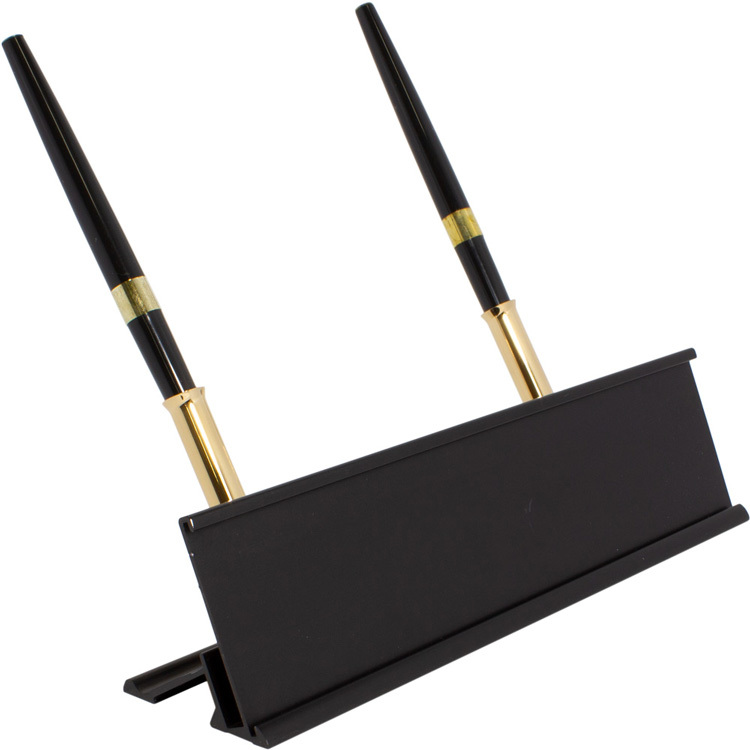 Custom lengths are available up to 39" for aluminum bases. 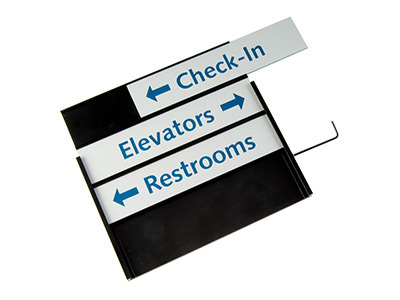 Corridor brackets are designed to make corridor wayfinding signage simple. 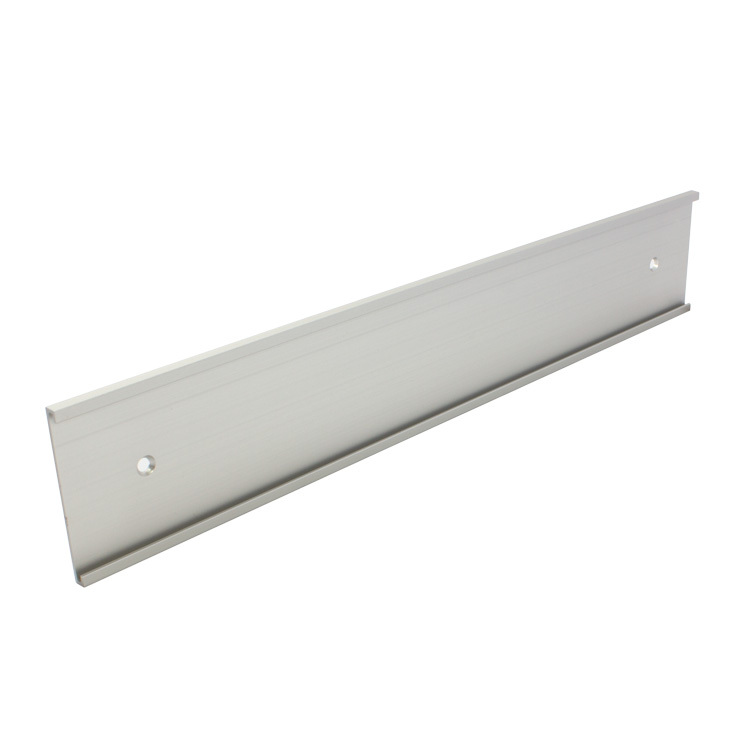 Custom lengths are available up to 39" for brackets. 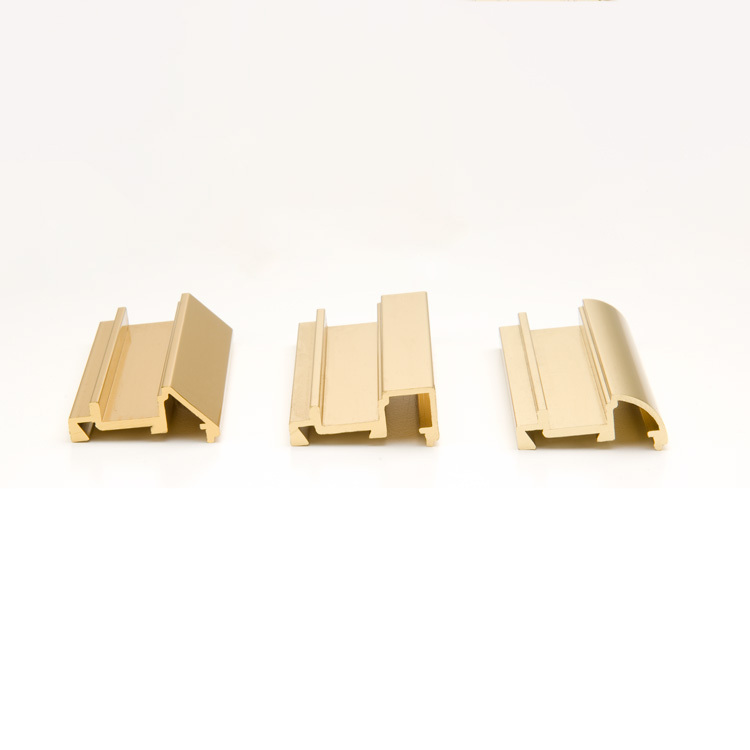 JRS Extrusions can be used to build your own custom mounting solution, use multiple extrusion to create custom sized slots, directory frames, or wayfinding signage. 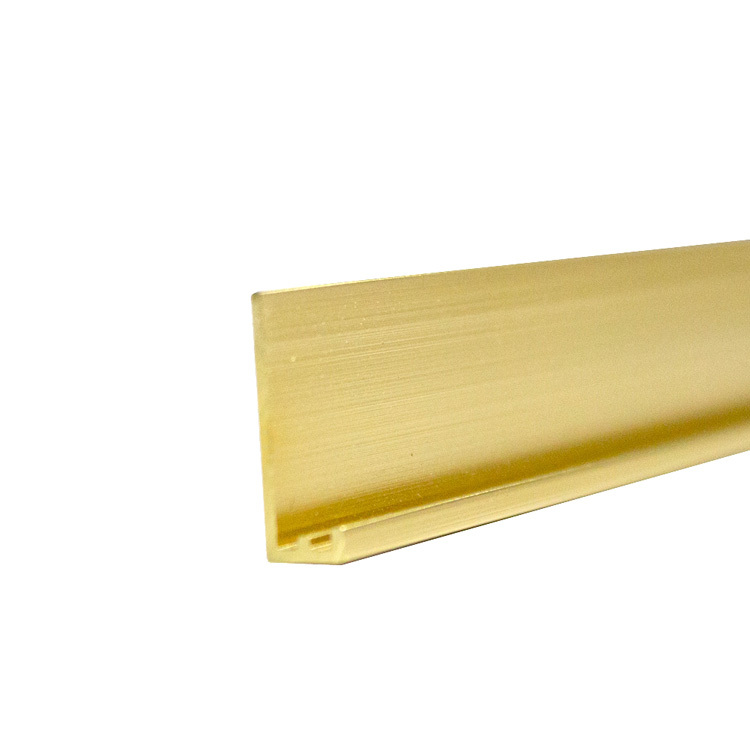 Extrusions accept 1/16" or 1/8" thick materials. 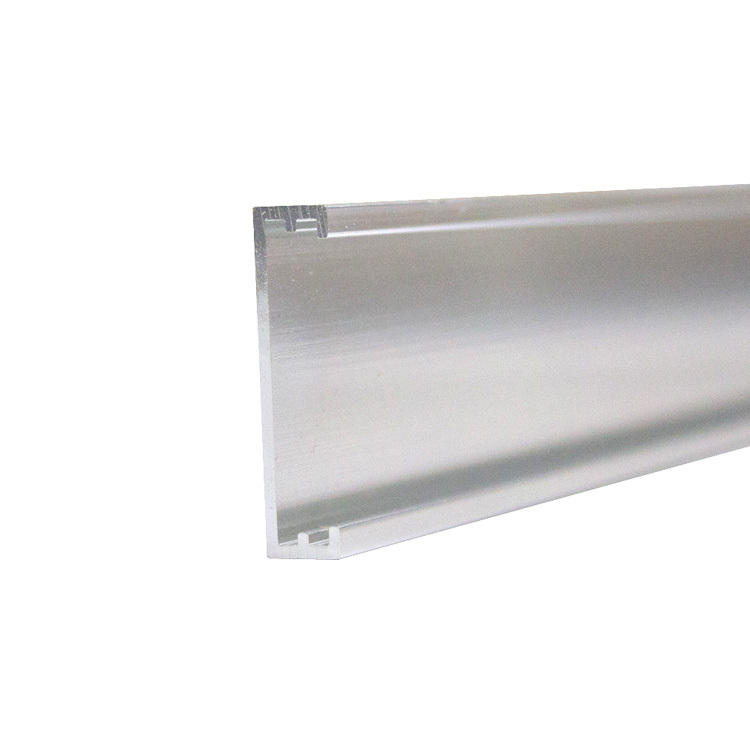 Custom lengths are available up to 39" for aluminum extrusions. 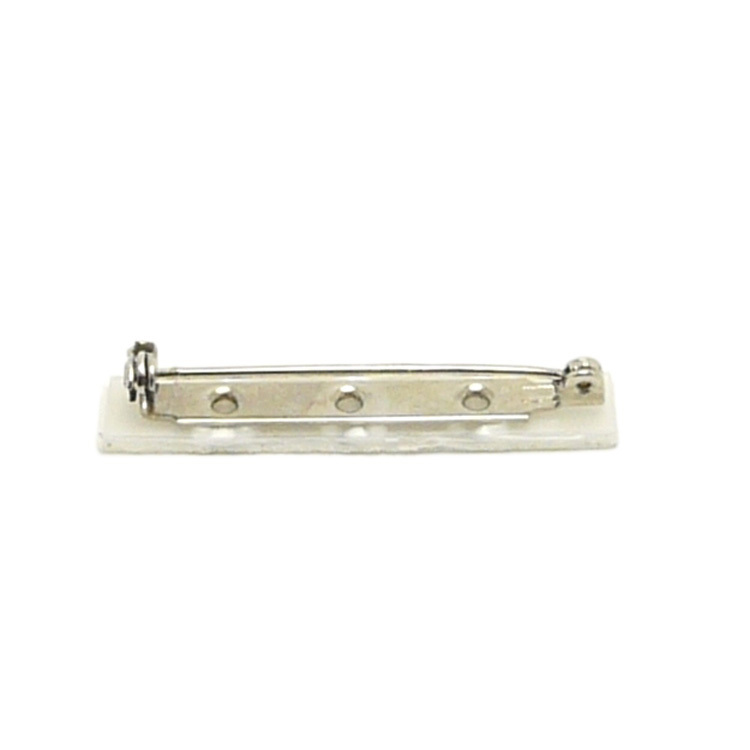 In our continuing effort to be a steward for the environment, we are introducing our Environmentals line of holders. 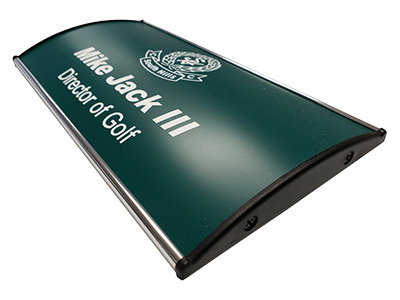 Manufactured to our exacting standards for workmanship and quality from a special recycled aluminum billet that is an Environmentally Preferred Product, the Environmentals will help us as we strive to provide sustainable product solutions for your signage needs while caring for the future as well. 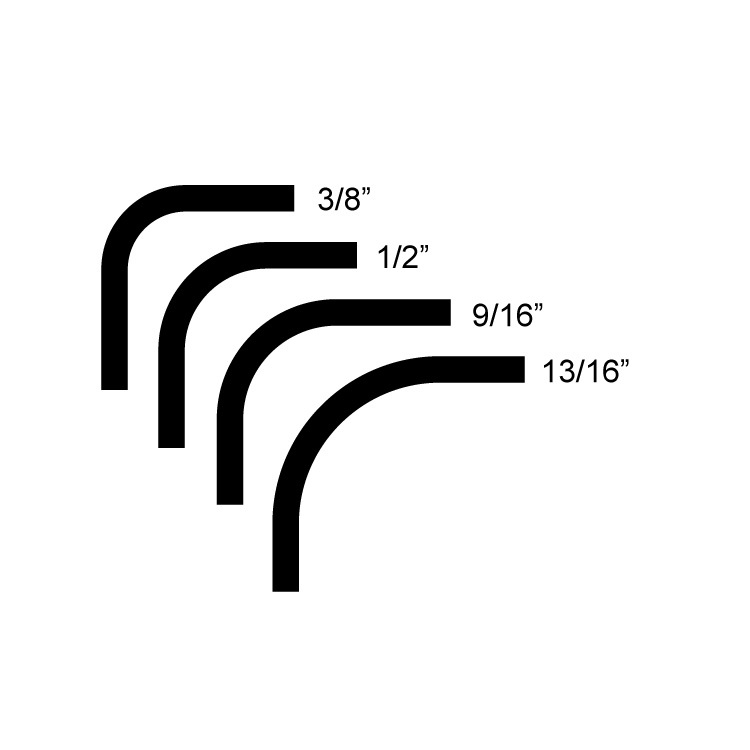 Custom lengths available up to 39". 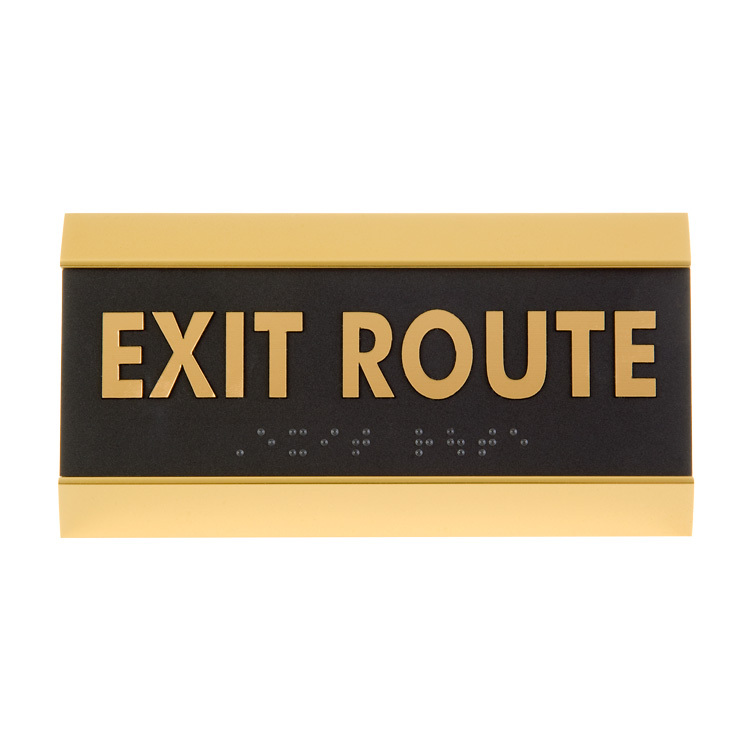 ADA wayfinding is a vital segment of any sign making business, and DuetsTactiles products are the perfect solution. 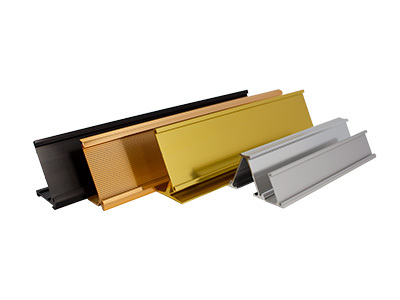 Choose from the broadest selection of modern colors to match any interior or exterior decor. 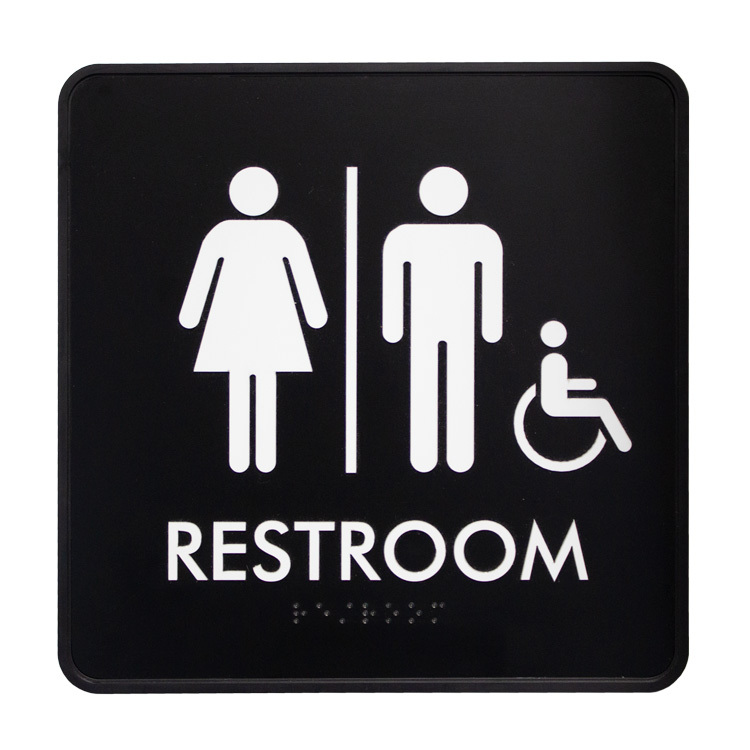 Make a powerful impression with design-forward interior or exterior signage. 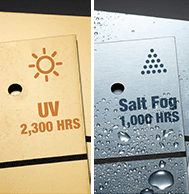 Quality substrates for fine engraving, yet durable enough to resist the ravages of weather and sun. 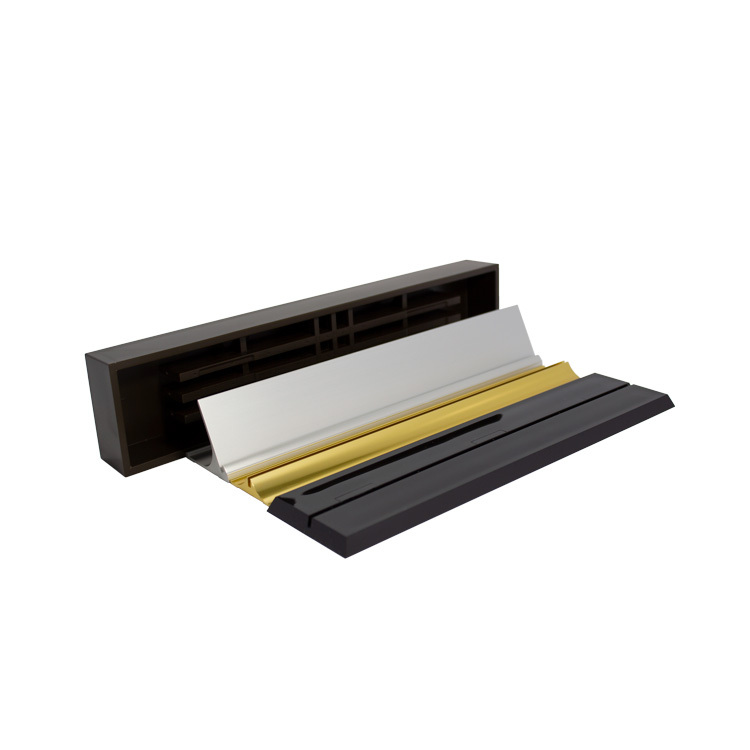 Duets Laser XT is available in three thicknesses. 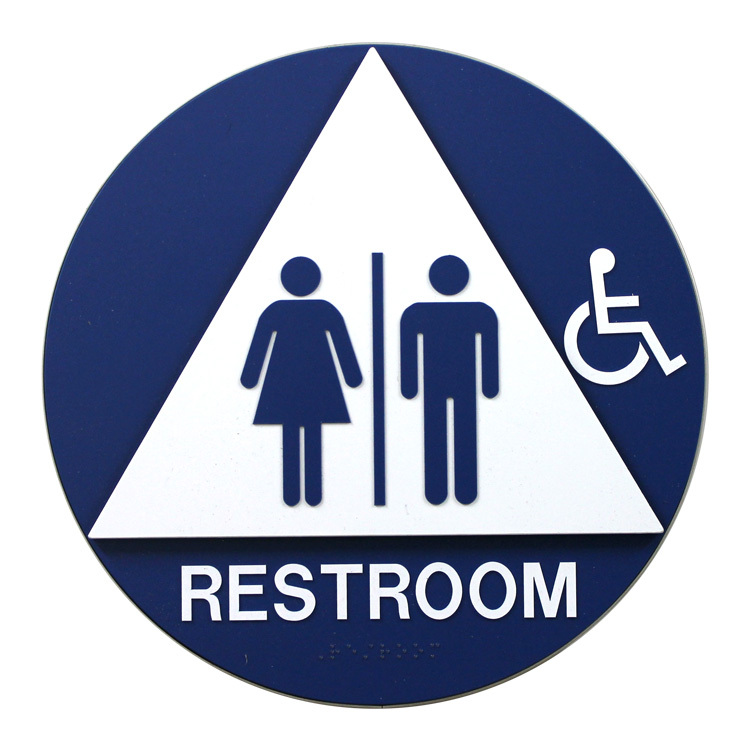 Several colors come in a two-sided, 3-ply option. 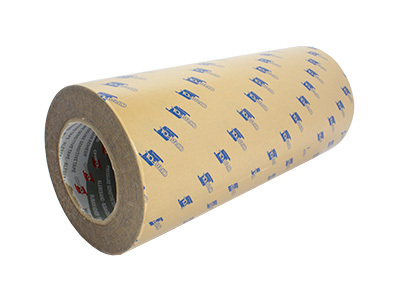 Make a statement with this sturdy 2-ply engraving substrate. The clear top layer has a matte finish, and the vividly-colored back layer is reverse engraved. 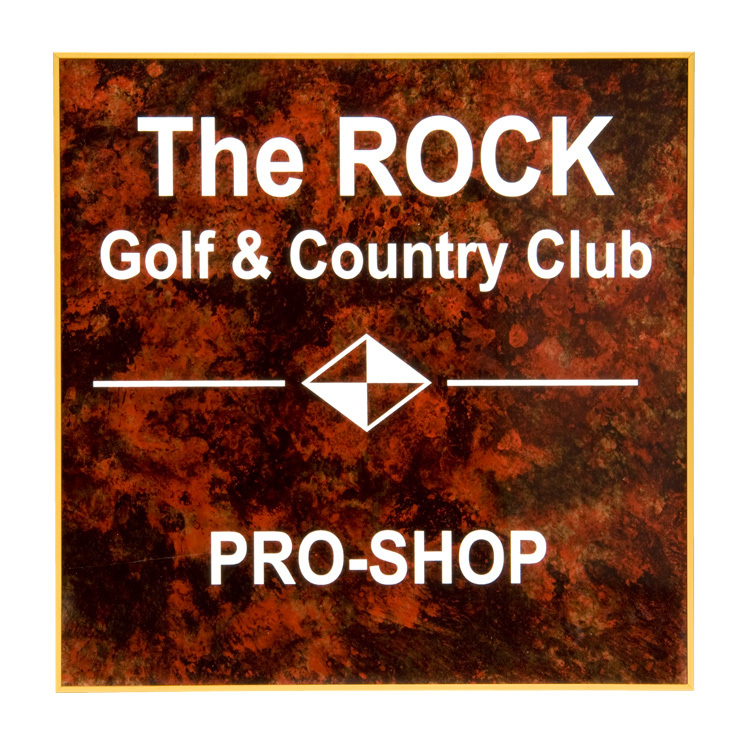 Backlight or back paint this outdoor-grade material to give a whole new dimension to wayfinding, branding or displays. 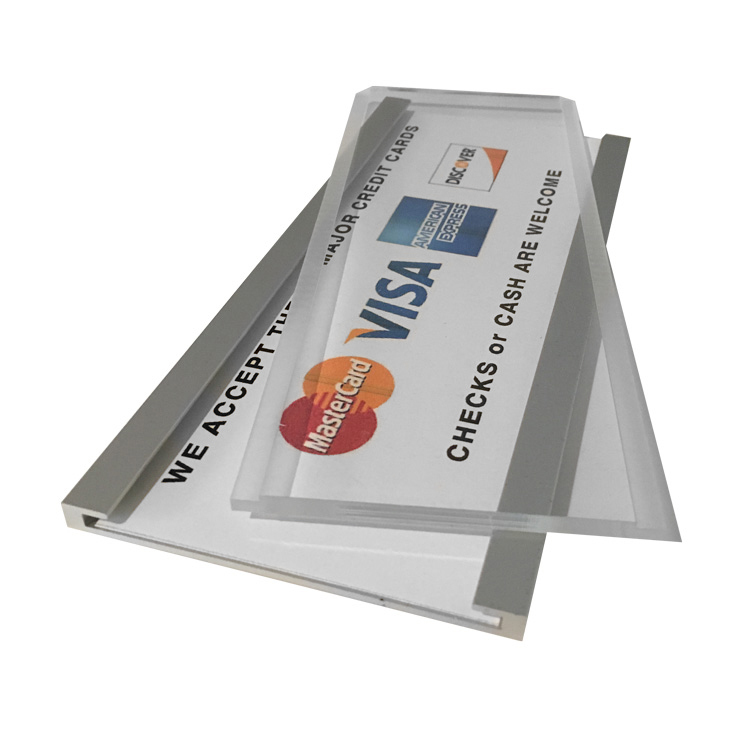 Transparent, translucent and solid color substrates for aesthetic decor. 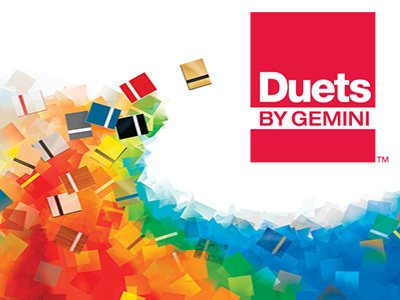 Duets Accents is single-ply, cell-cast acrylic sheet material offered in both a range of transparent, translucent and opaque colors. 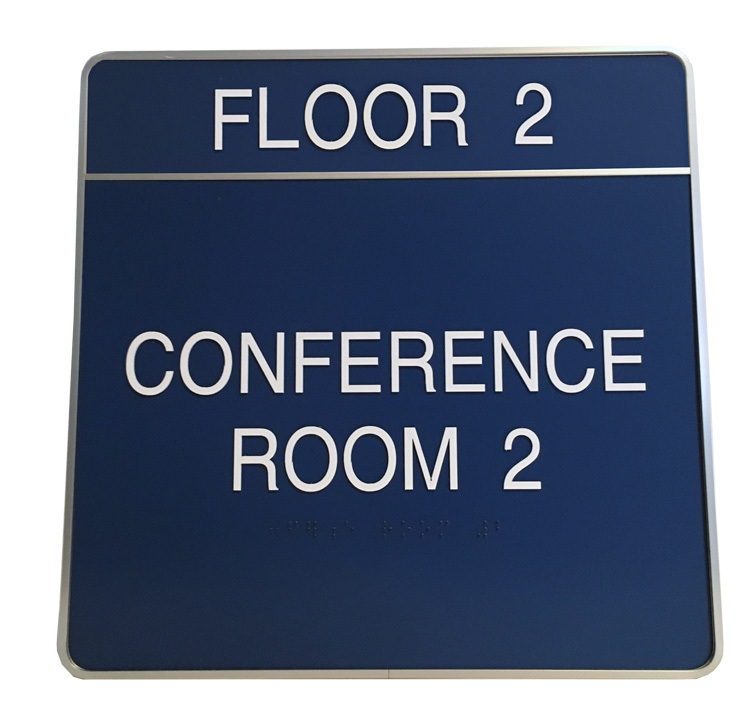 Duets Accents offer a wide range of versatility, with contemporary architectural colors, a combination of gloss and matte finishes, and can be easily paired with Duets Tactiles to create a tactile sign with the look you want. 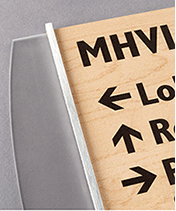 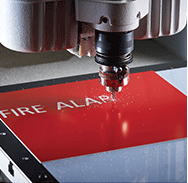 Perfect for interior wayfinding, branding or recognition, Gemini makes consistent laser engraving substrates. 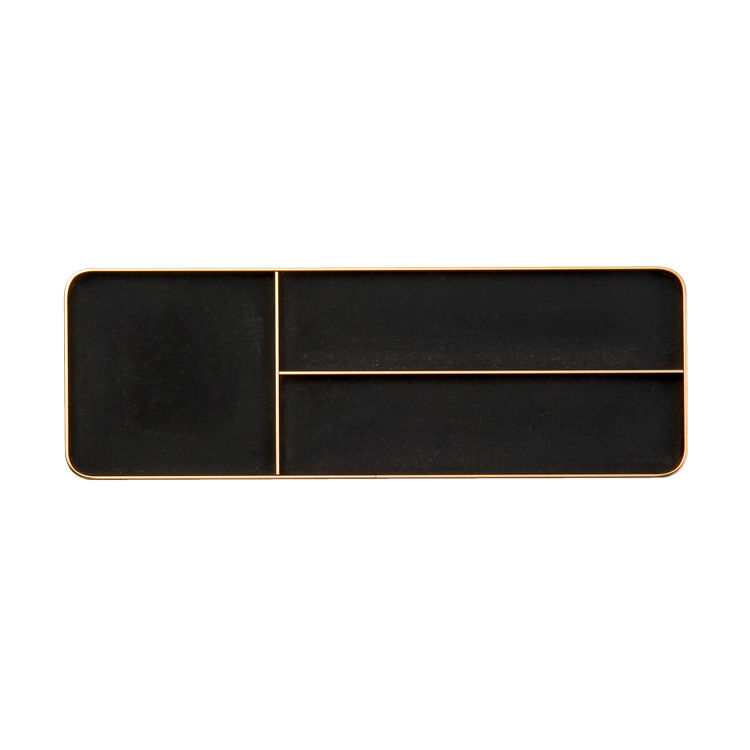 They come in three thicknesses, and several finishes that model real wood, marble and metallic surfaces. 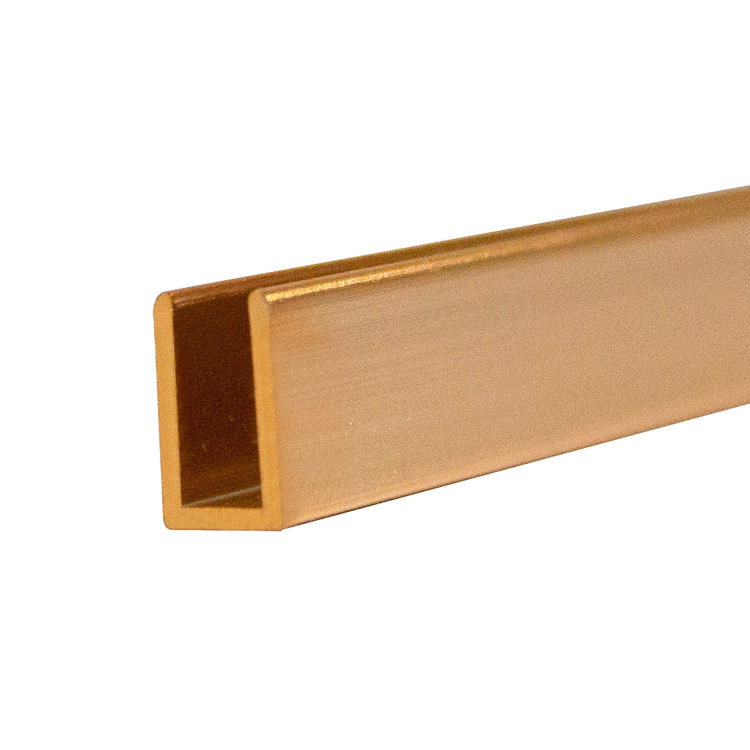 When precision engraving is important to your next project, count on Duets. 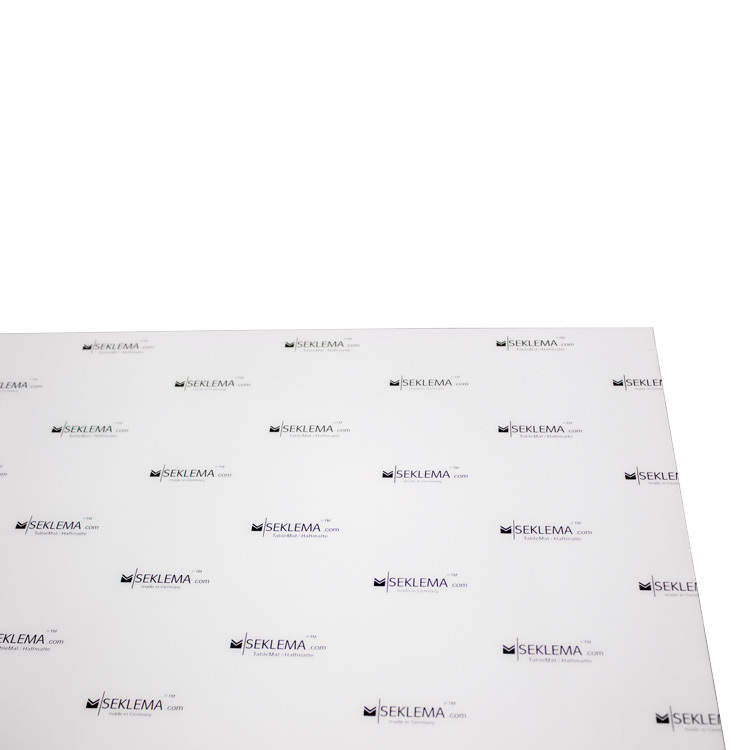 Thin but durable, DuetsContours microsurfaced flexible product are designed to deliver the prominent look of engraved signage applied to curved surfaces. 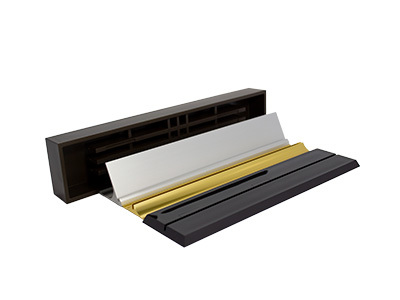 Available with or without adhesive and in a number of color combinations and finish choices. 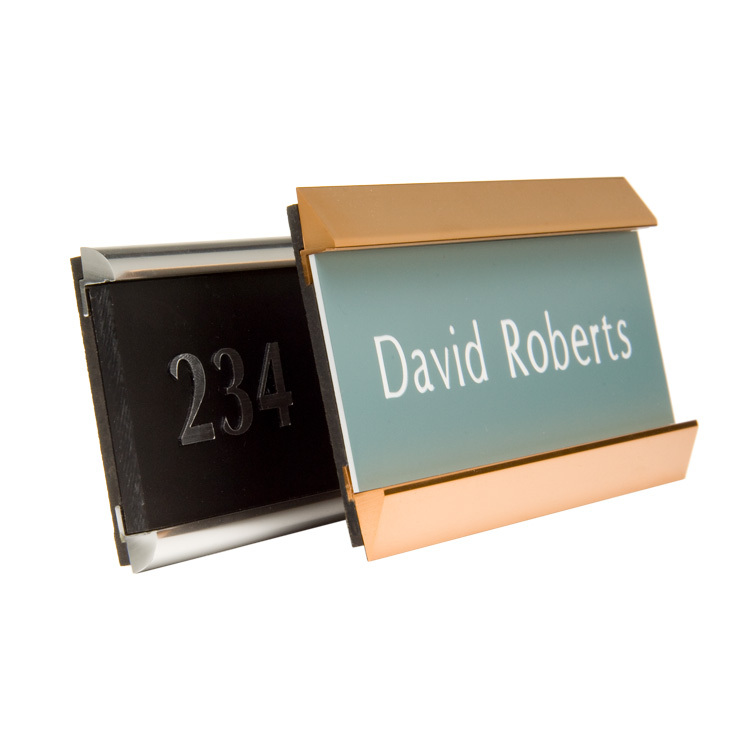 When you are rotary engraving, Duets has a wide variety of high contrast colors and metallic finishes to choose from. 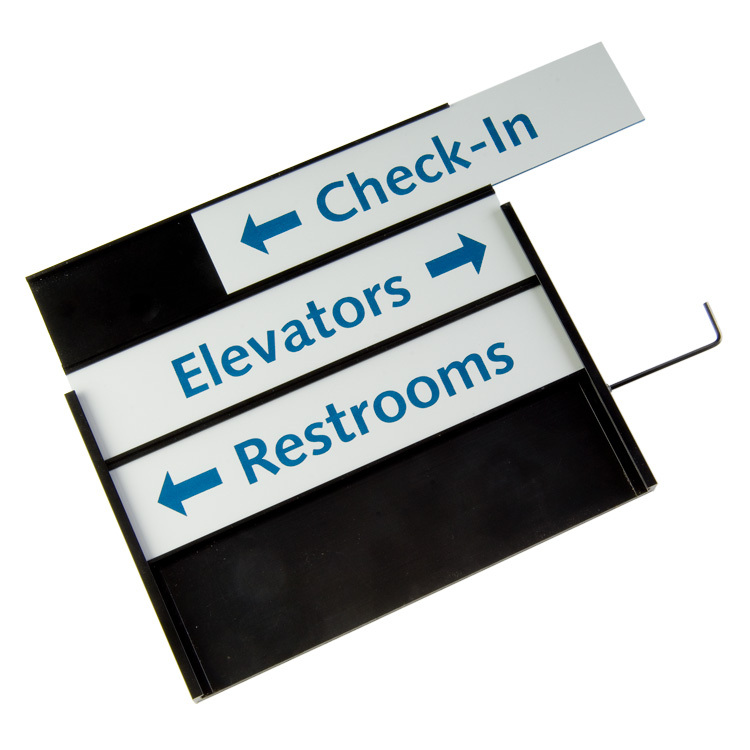 Ideal for indoor wayfinding and labeling. 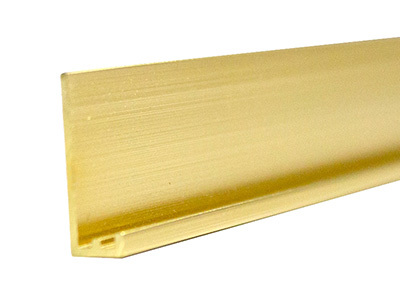 Duets Ultimates is a co-extruded impact modified acrylic which is UV stable and suitable for interior and exterior applications. 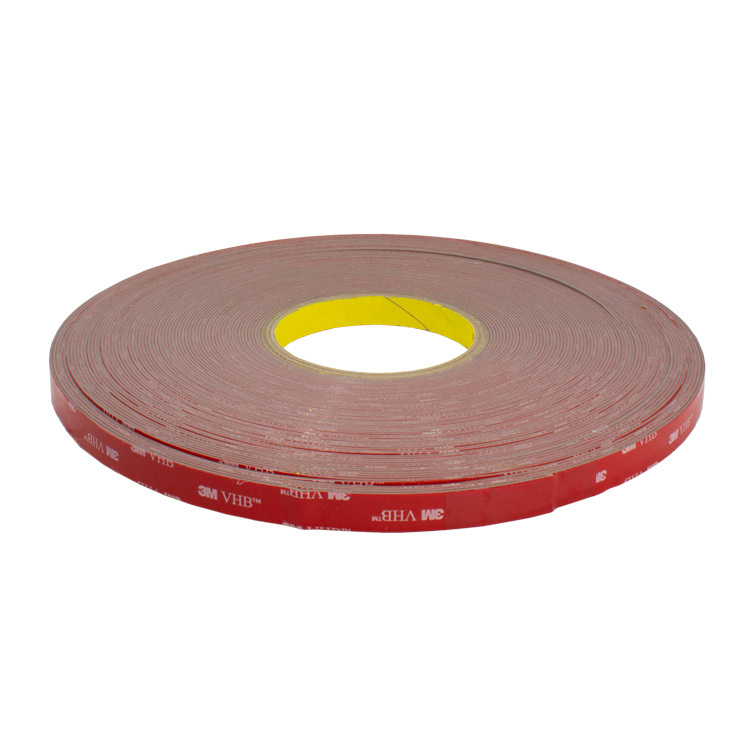 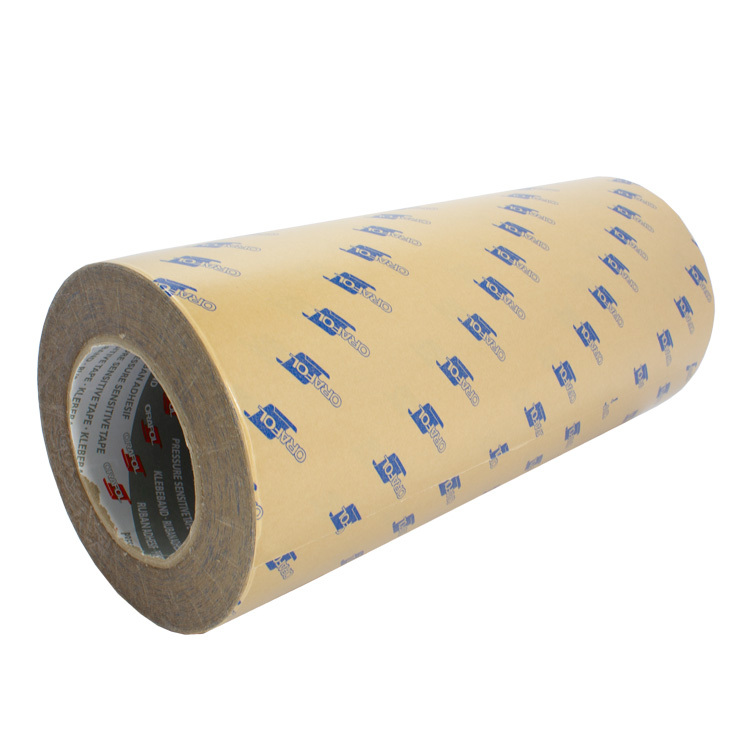 The heavy-duty top layer offers increased abrasion resistance and damage protection making Duets Ultimates the material of choice for harsh environments. 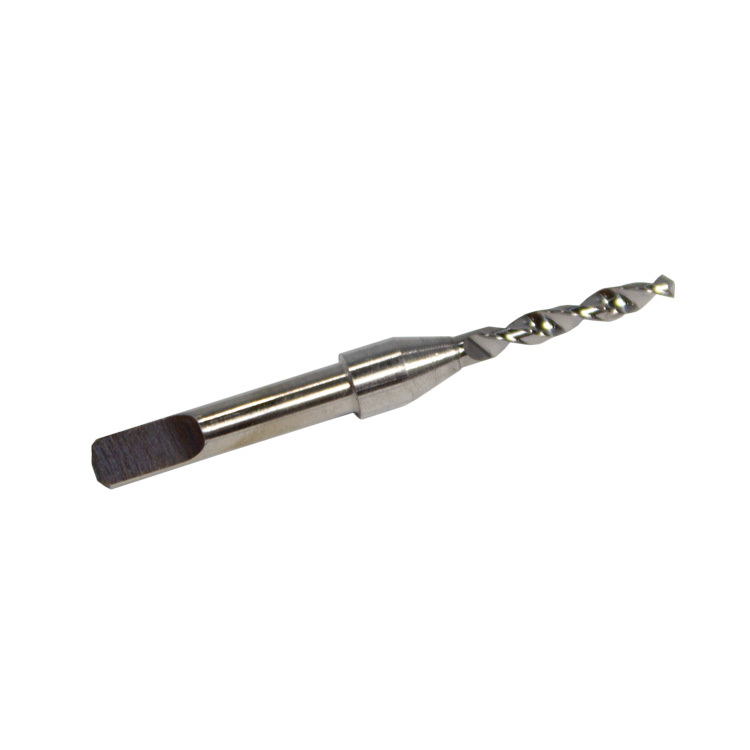 JRS carries a popular selection of supplies for the engraver. 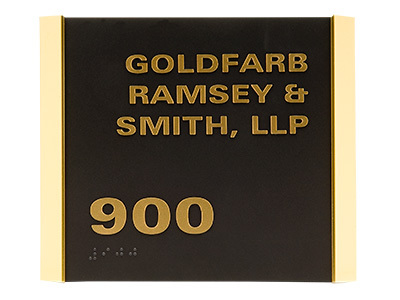 We carry Orafol® transfer adhesive, mounting adhesives, hold down mats for engraving tables, and braille dot drills for rotary engravers. 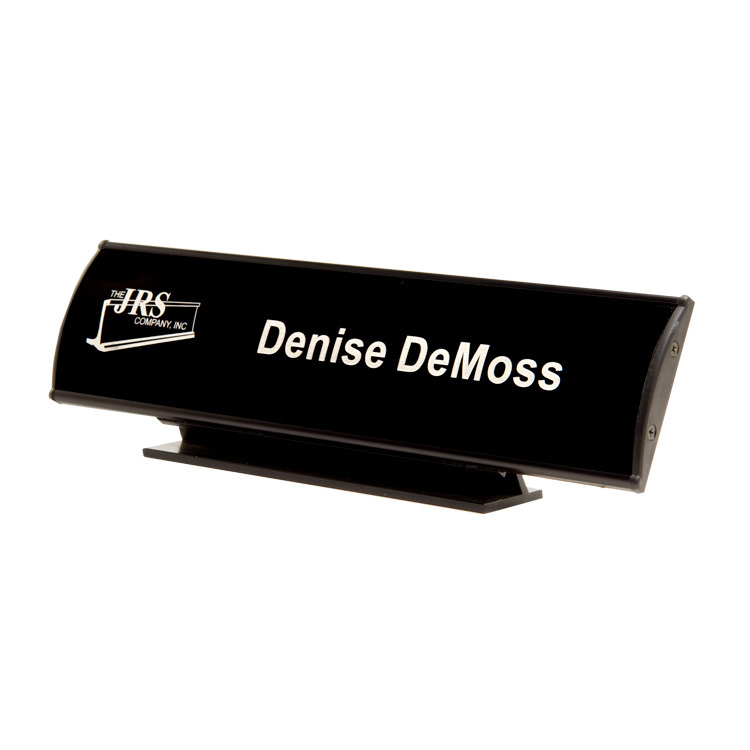 JRS carries a wide selection of products to produce high quality name badges. 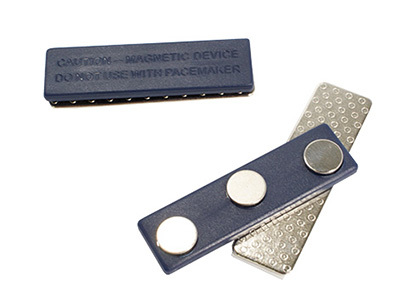 Besides stocking Duets™ by Gemini we carry a large assortment of badge blanks and badge findings. 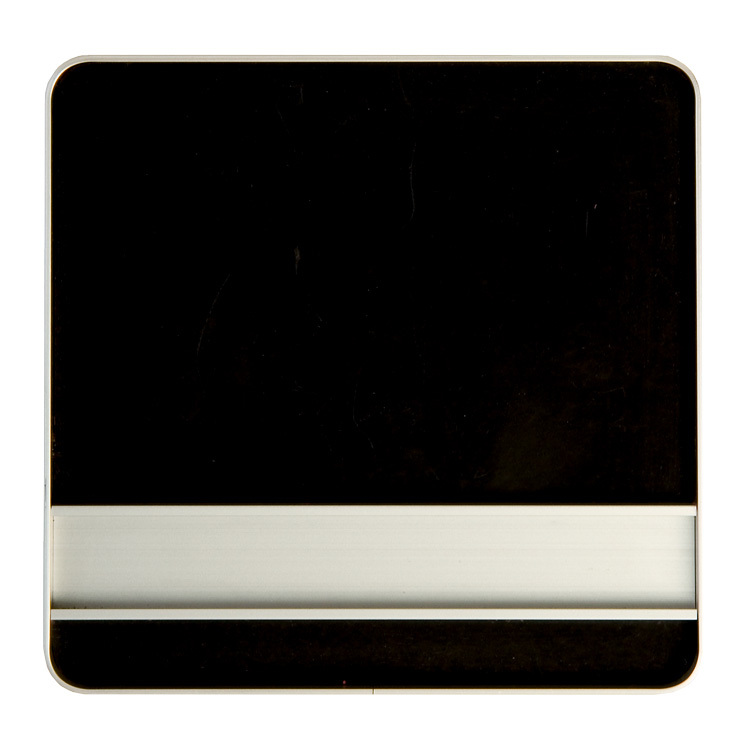 Our badge frames are made from a high grade steel and are manufactured in the USA by The Touch Adjust Company. 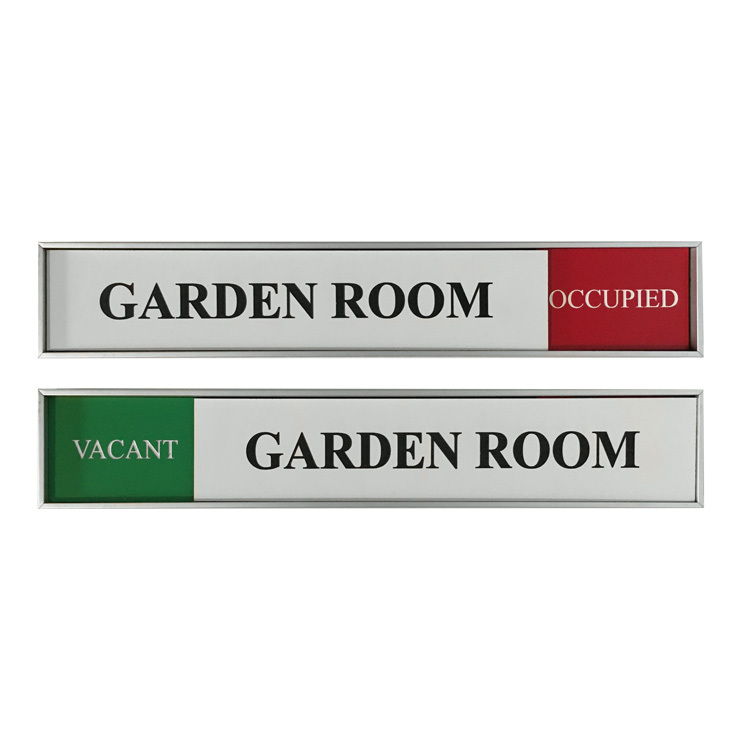 You'll find we carry the most popular Pin Backs, Bulldog Clips, Military Ribbon Bars and Lapel Tacs to mount and secure your badges. 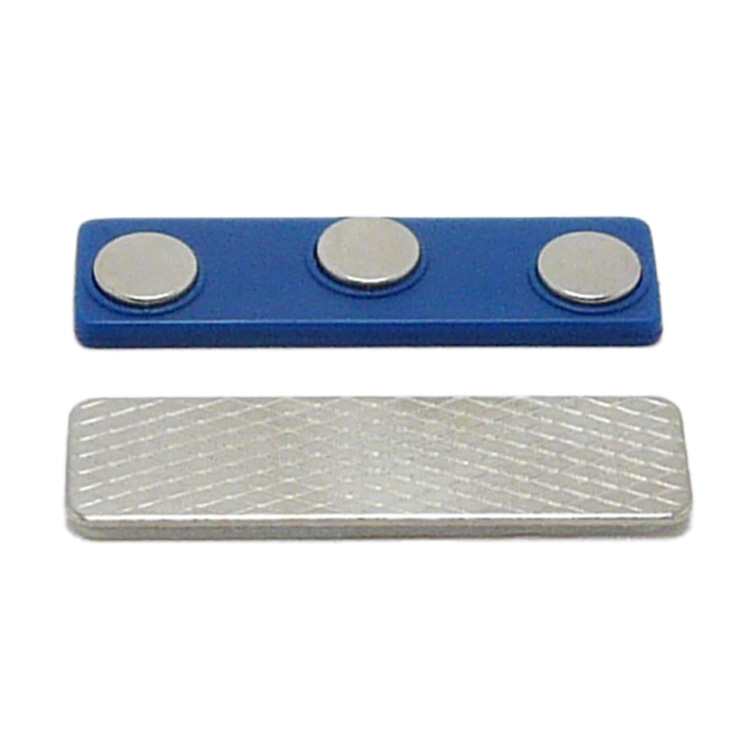 We also stock superior strength badge magnets in various sizes and styles. 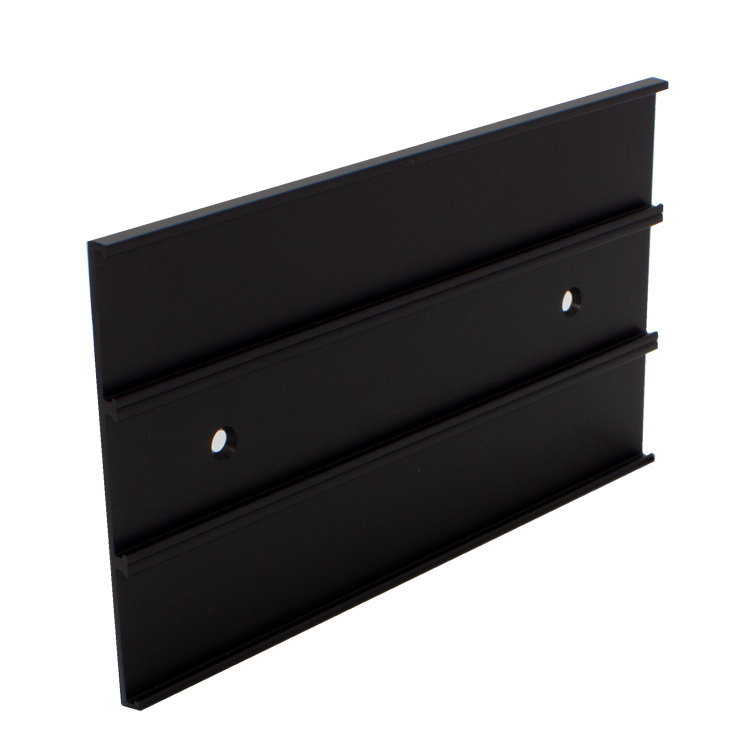 We continue to expand our line of products to assist with mounting your frame or nameplate holder. 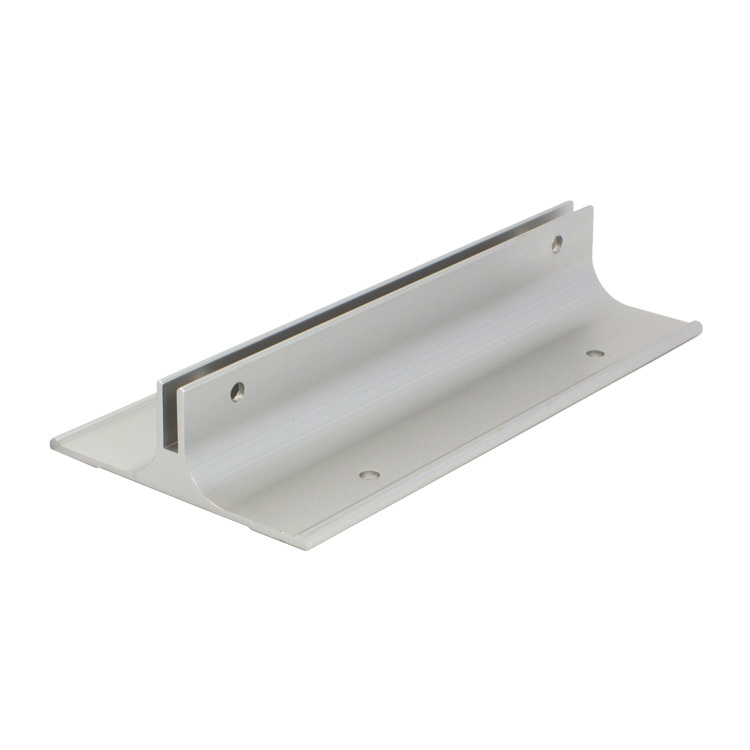 JRS stocks a variety of mounting products like mounting adhesives, solutions for mounting on cubicles or partitions, fixtures for securing materials or frames, and the popular stand-offs.